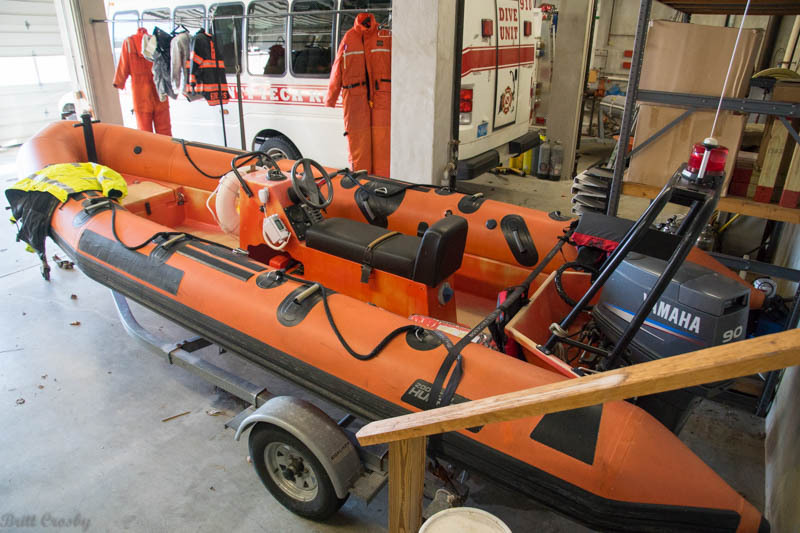 to be used as a high water vehicle. 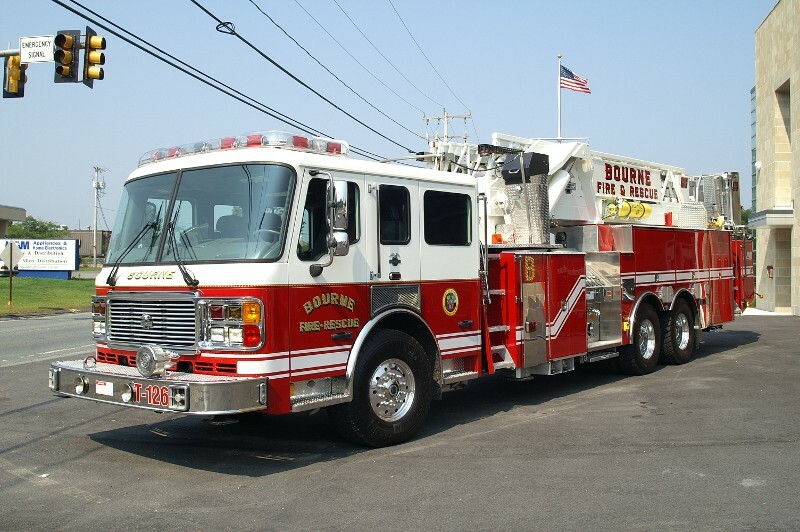 to replace the 2000 Ford Rescue Truck 361.
areas difficult for the larger engine. 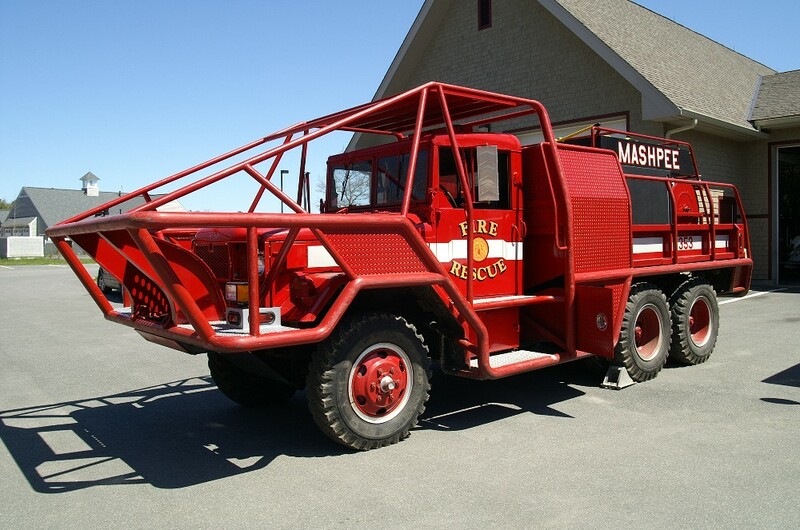 rescue and off road access. 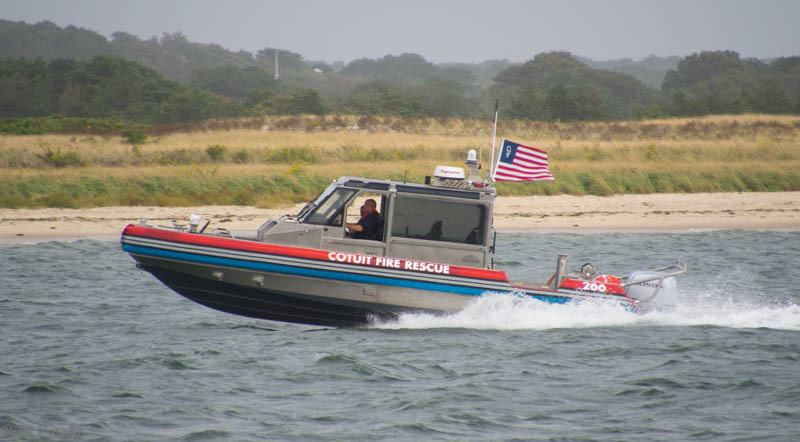 Aquinnah also acquired a surplus 24' USCG boat. 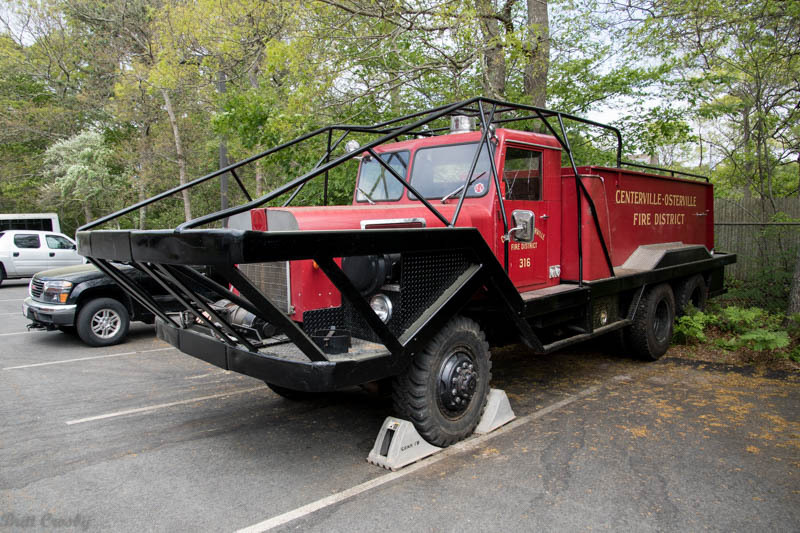 it would serve as a water rescue unit. 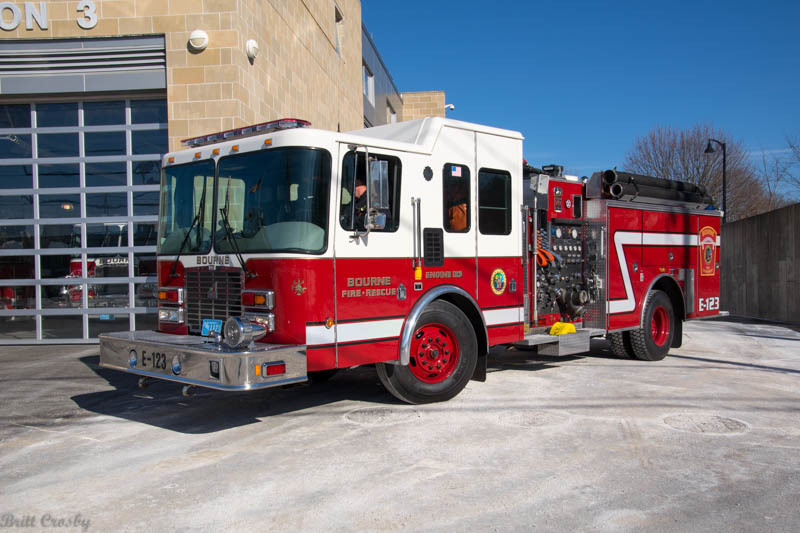 1250/750/30 for Engine 123. 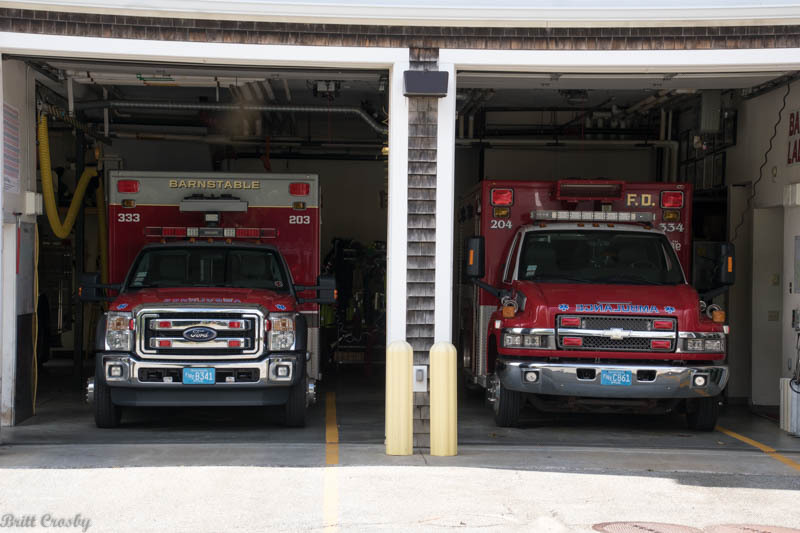 It will be assigned to Station 3.
to Station 3 for a couple years will go back to Station 1 in Buzzards Bay. 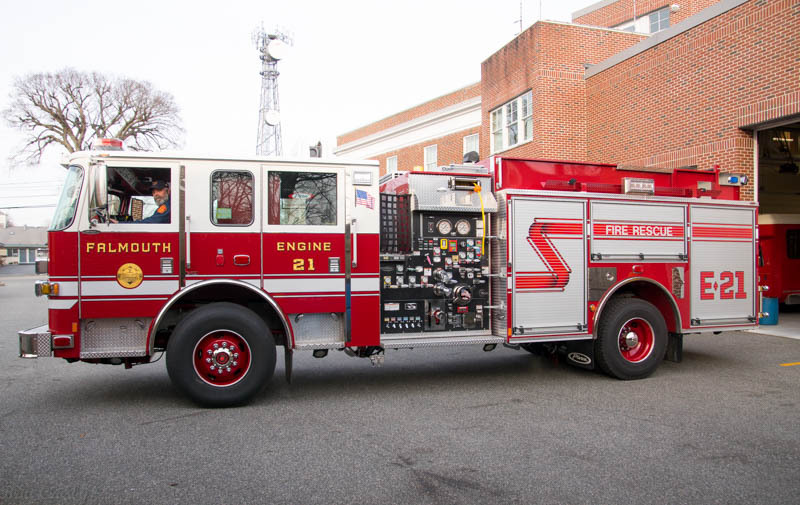 department's spare engine at Station 1.
as Engine 124 when first delivered. 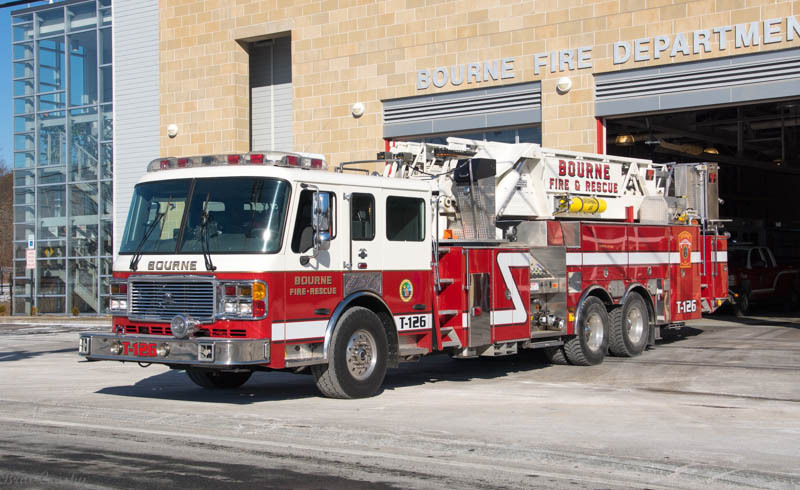 Bourne had 3 brush breakers in recent years. 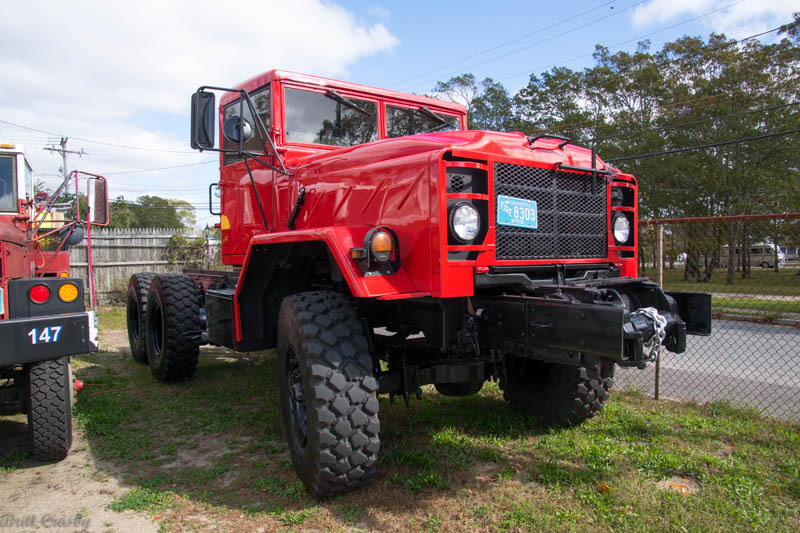 Breaker 127 was a 1974 Military 6x6 turned into a breaker in 2001. 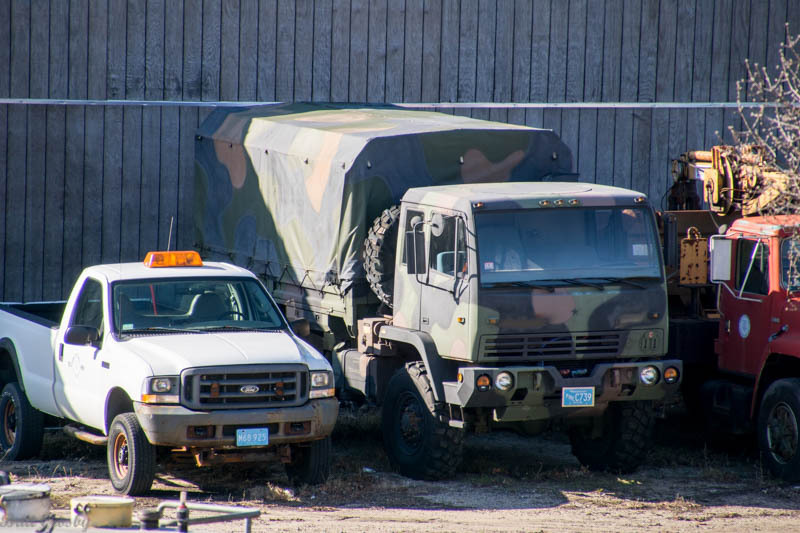 It has been taken out of service. 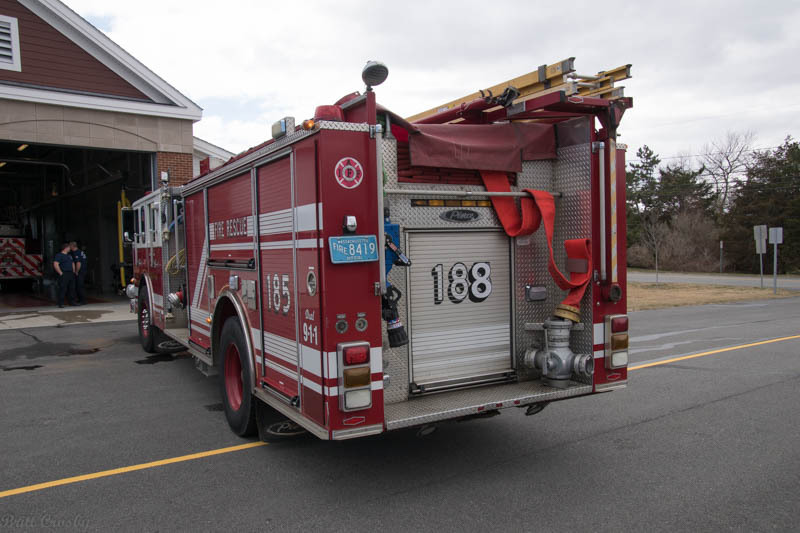 outfitted with the 2002 pump and tank from the previous truck. 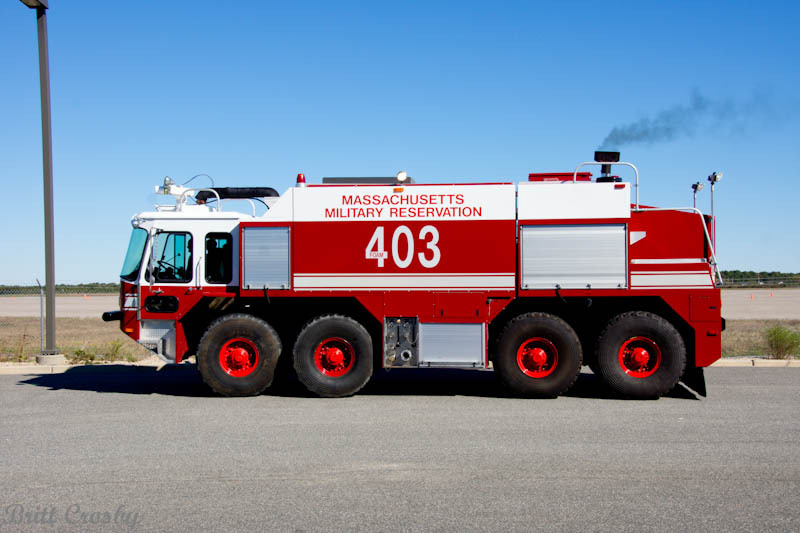 and would likely be reassigned to Station 2.
used for A-135. 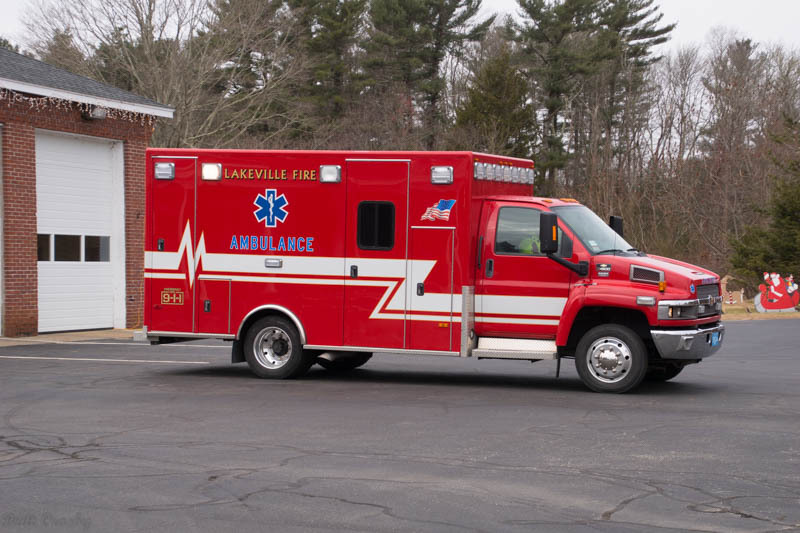 A new ambulance is likely in 2019. 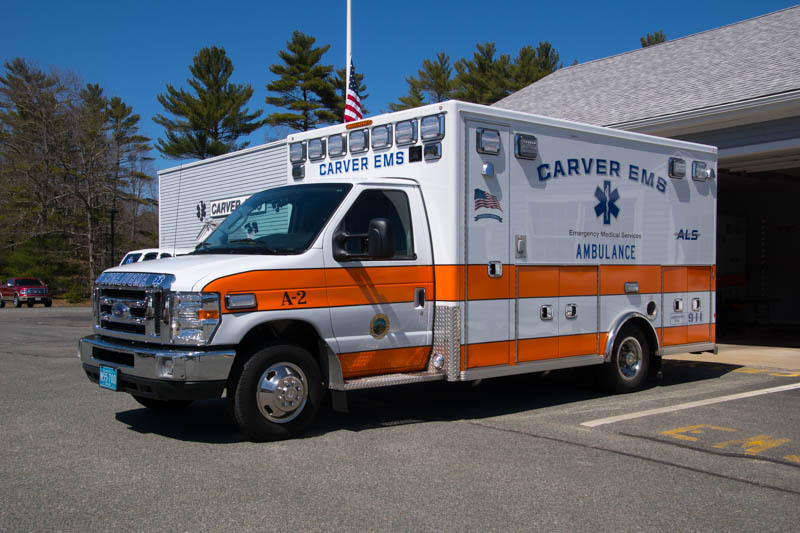 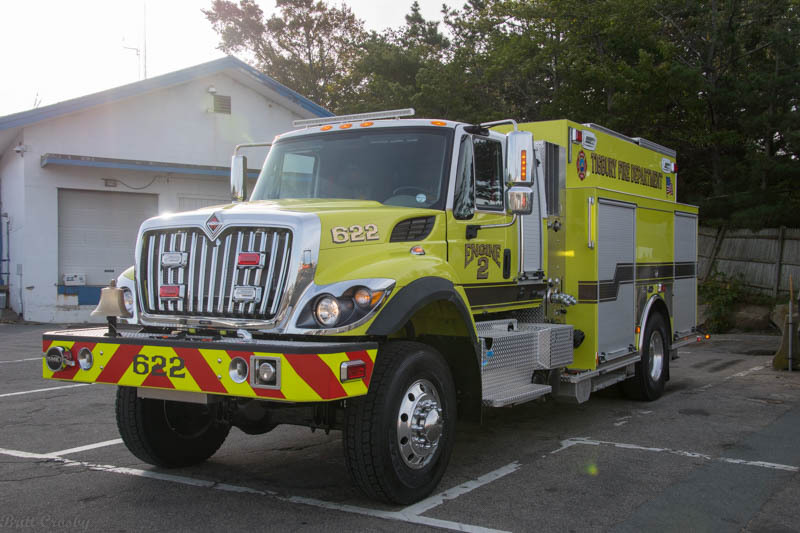 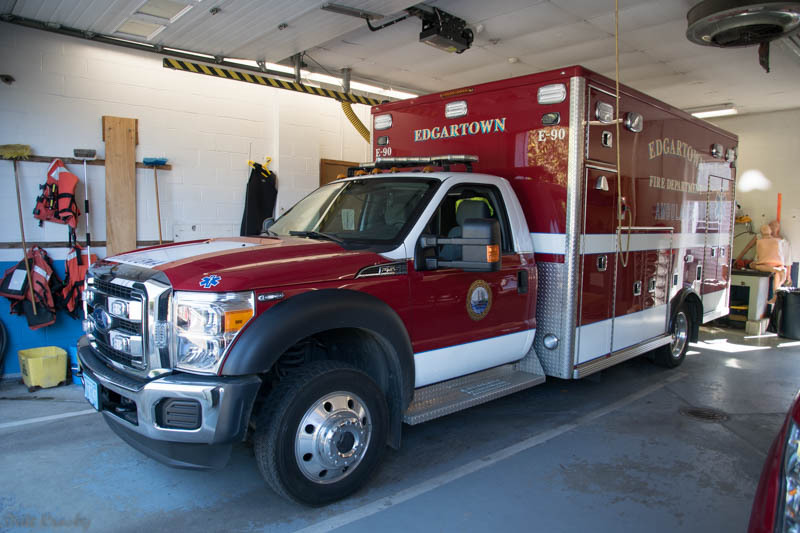 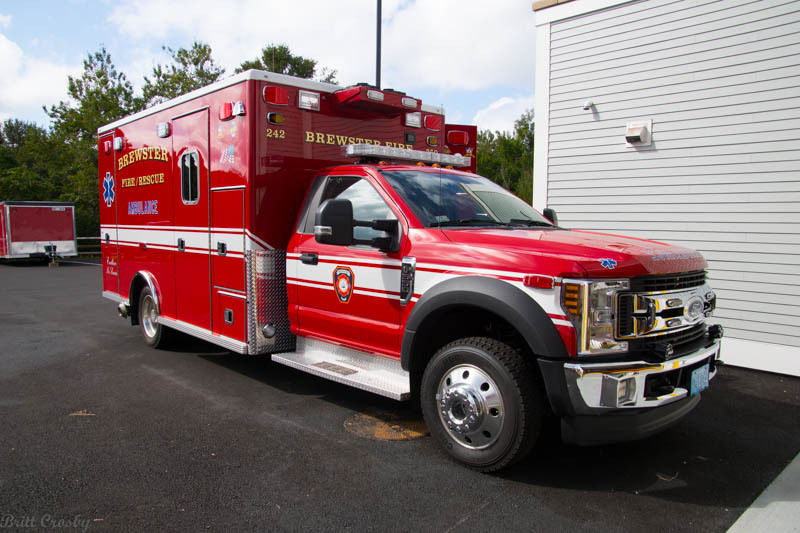 A new ambulance was approved at the 2018 District Meeting. 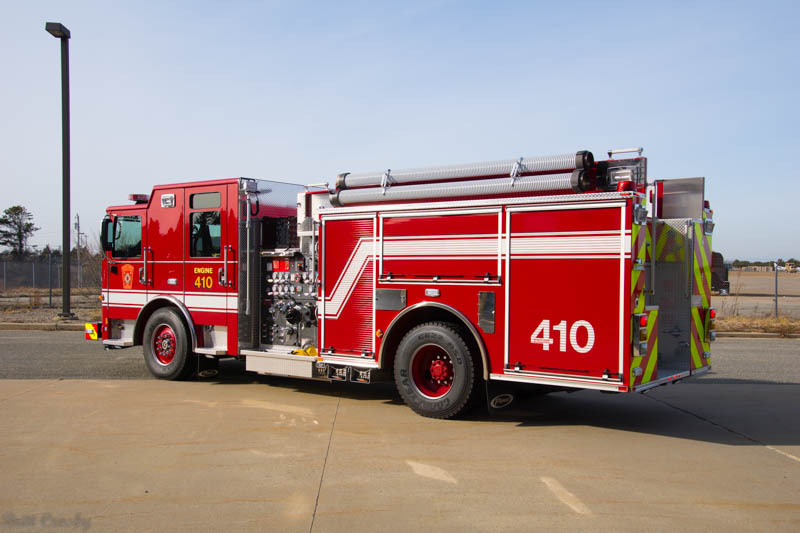 It will replace the 2009 International/Horton A-325. 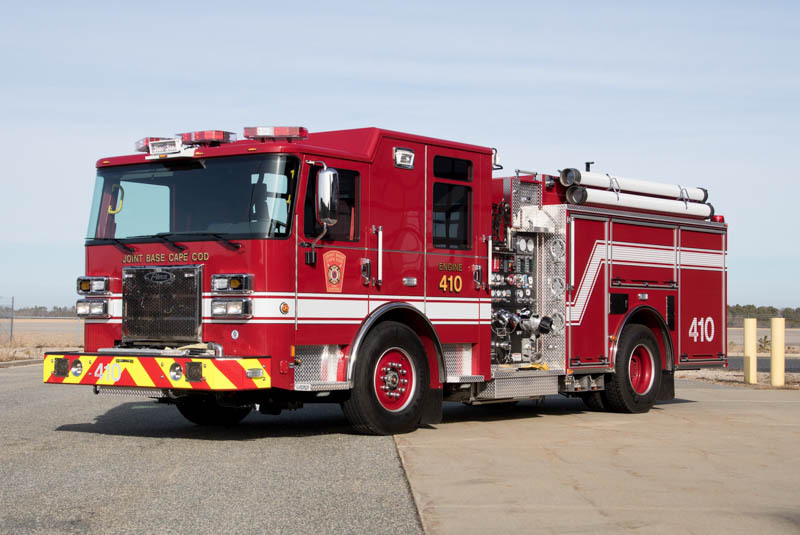 similar to A324 and A326. 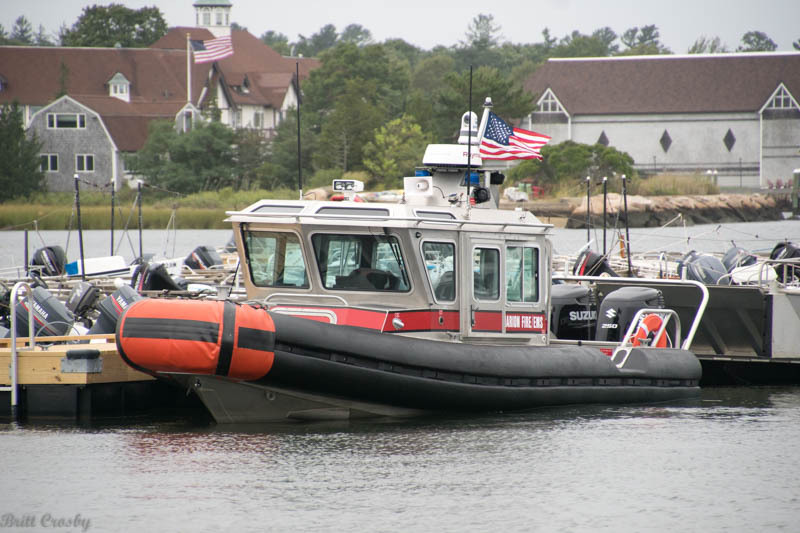 in service as Marine 266, replacing the 2005 21' Edgewater. 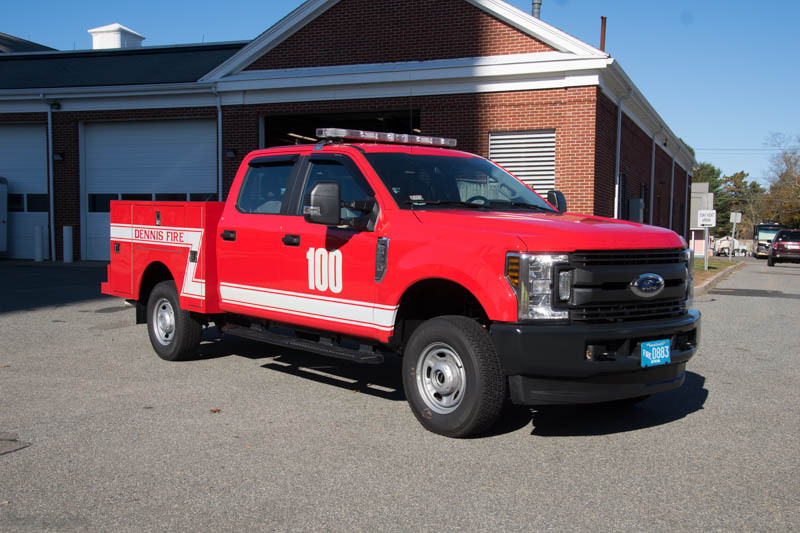 pickup truck in service as Car 100. 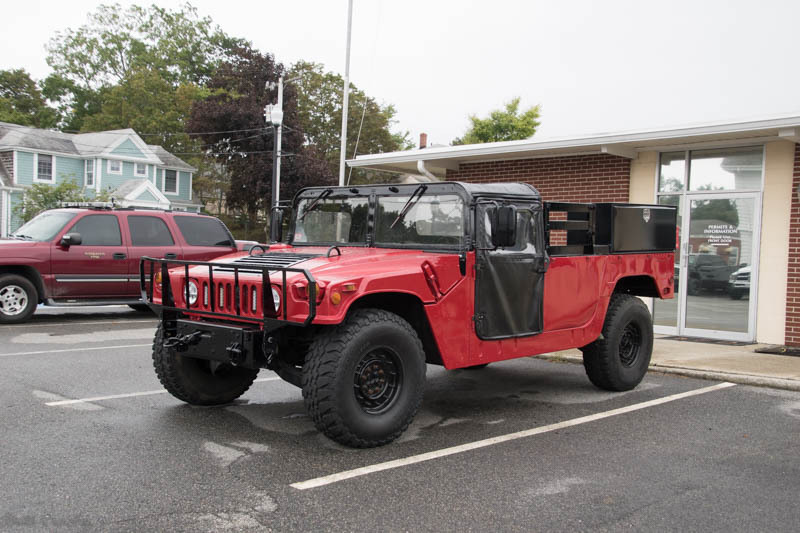 It will serve as a utility vehicle. 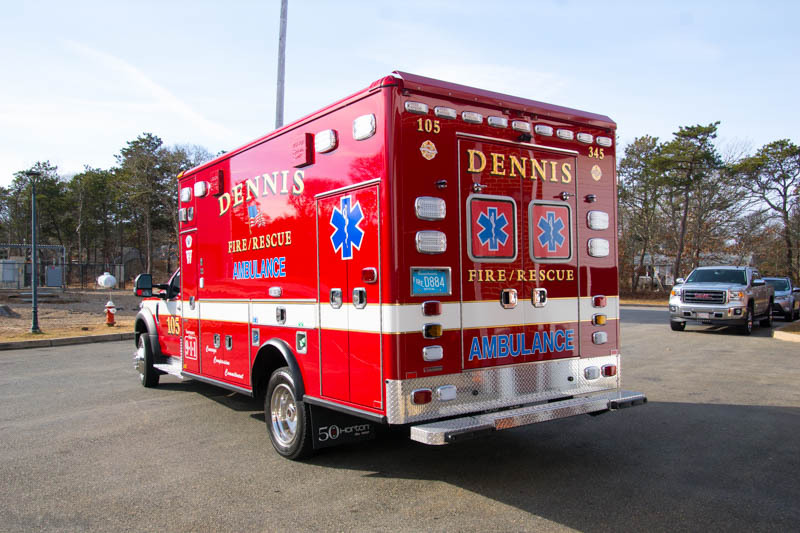 Dennis recently took delivery of a new Ambulance. 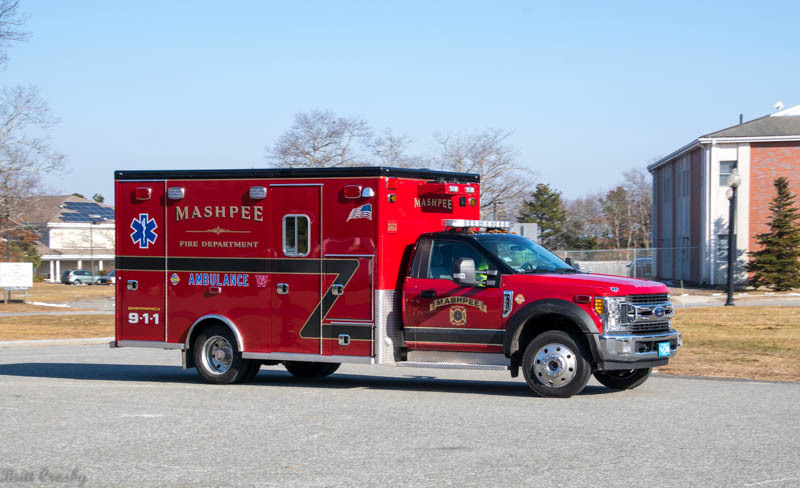 will be assigned to Ambulance 105.
which will be reassigned to Dive 116 as the Dive Truck. 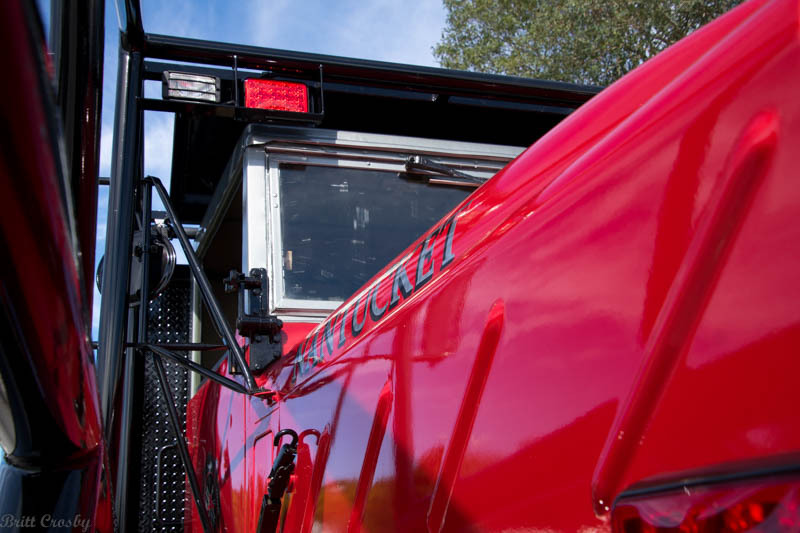 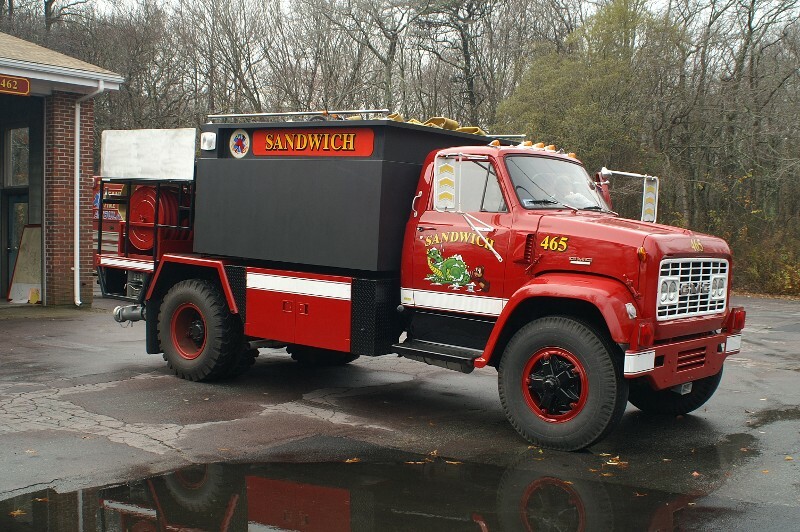 has served as the dive truck since 1995. 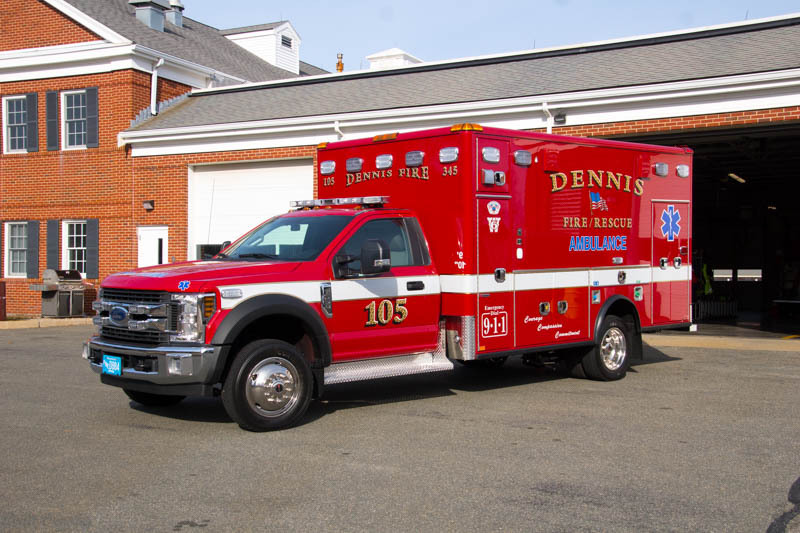 Dennis expecting a 2019 vehicle for Chief Car 101. 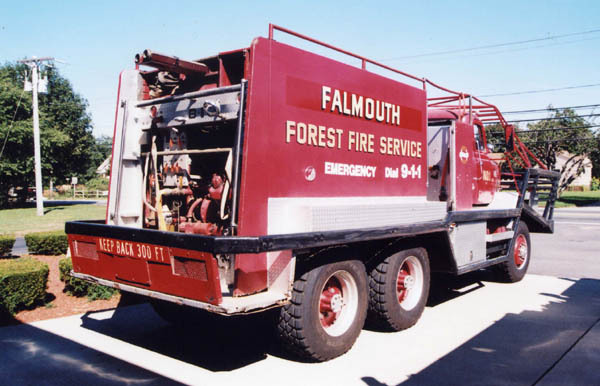 Eastham has taken delivery of a new Forestry Truck. 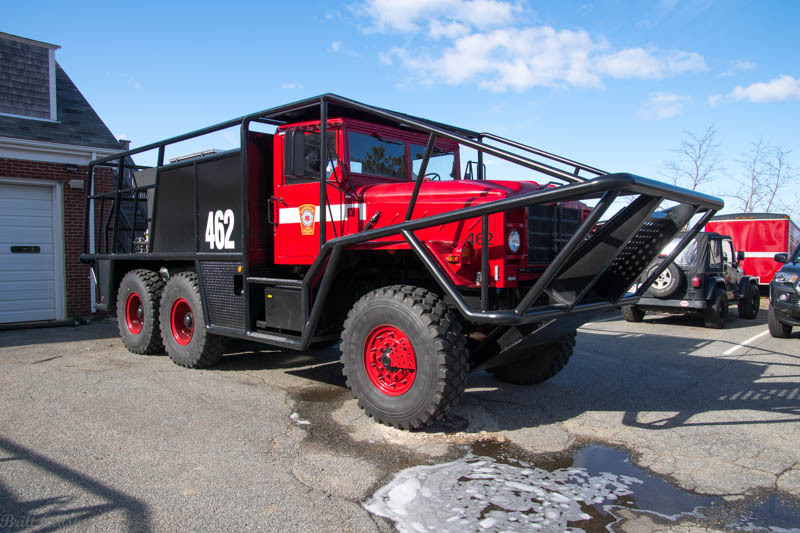 has a 300 gallon water tank and foam system. 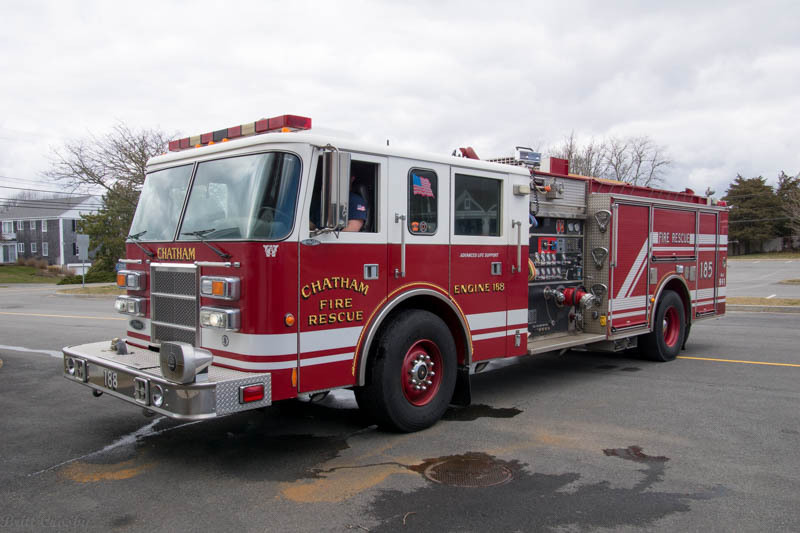 Special Hazards 158 that Eastham got from CCNS in 2003.
down narrow driveways. 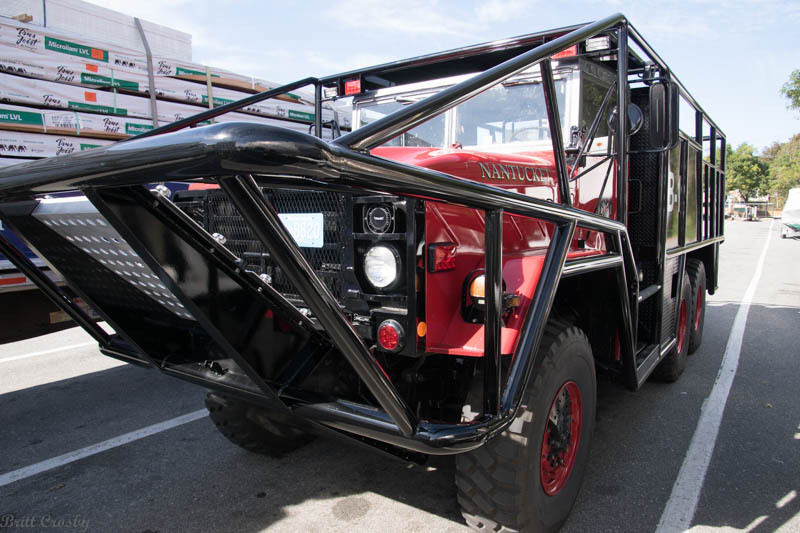 It could also tow a boat trailer. 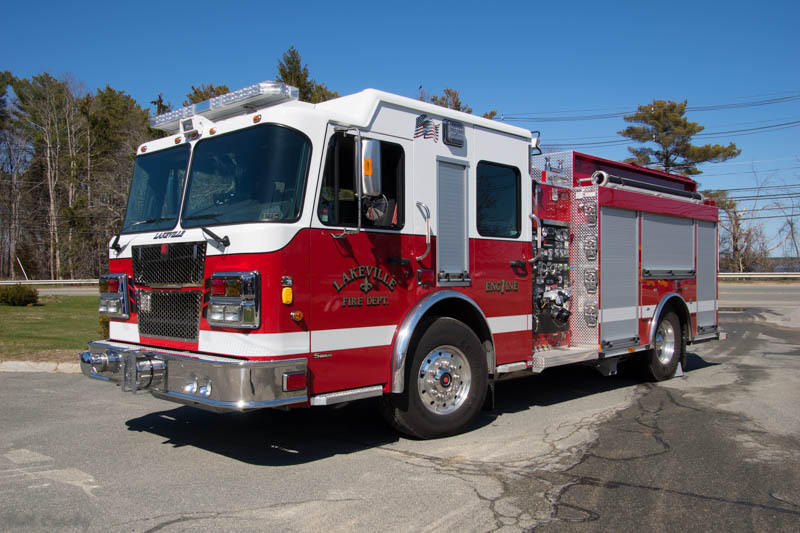 1500/750/20A Pumper in service as Engine 2.
was traded in to help offset the cost of the new engine. 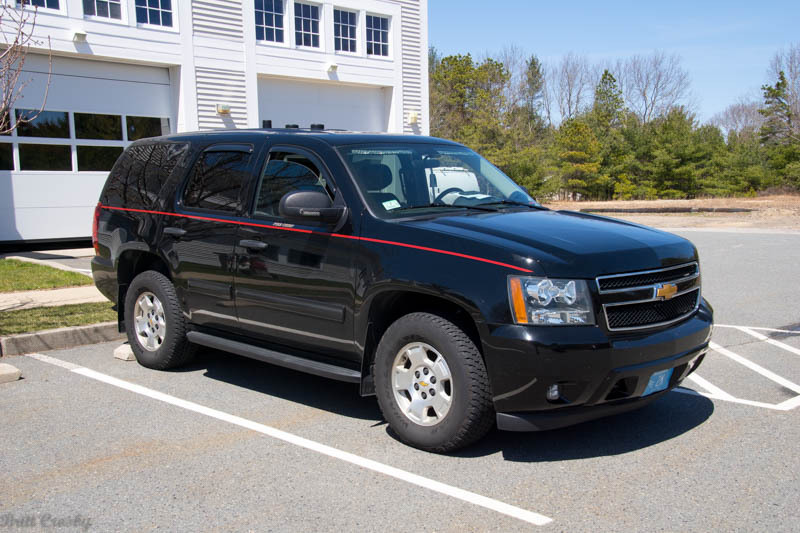 been used while the new truck was being built. 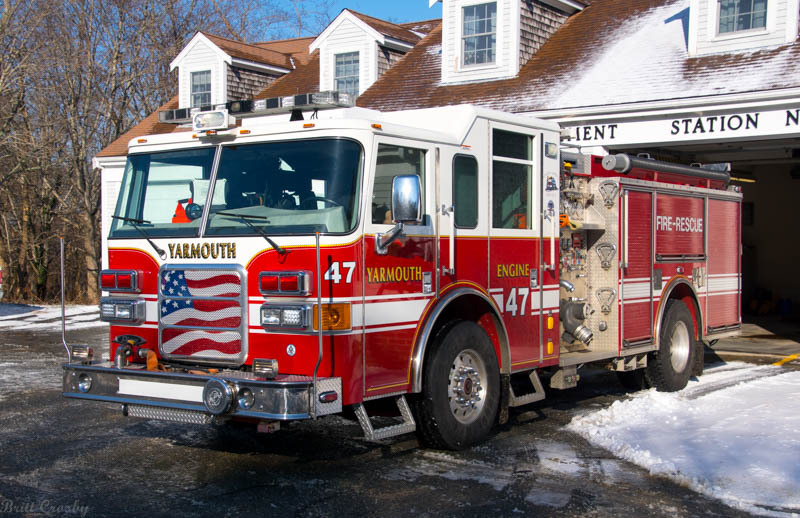 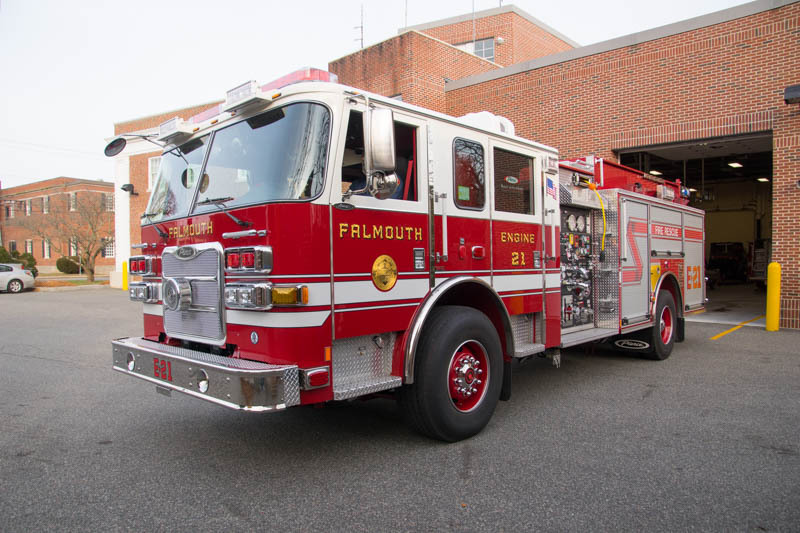 Falmouth has fallen behind in recent years with apparatus replacements. 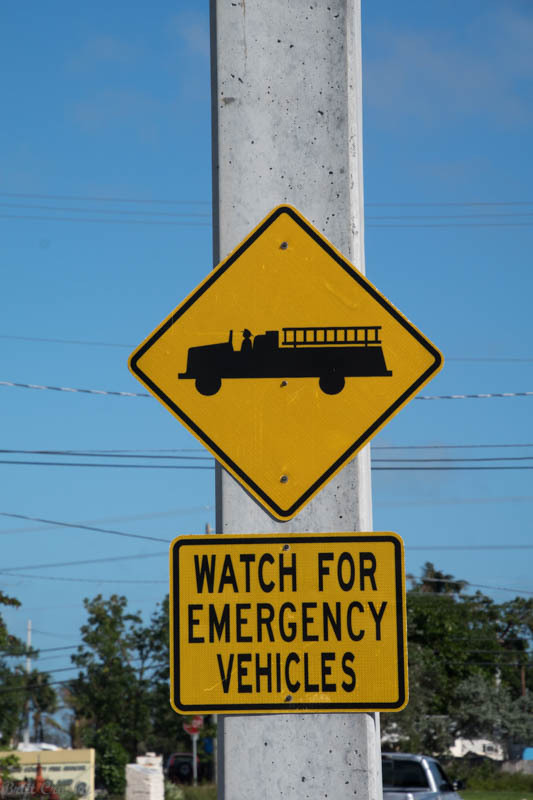 would fund the replacement of several vehicles. 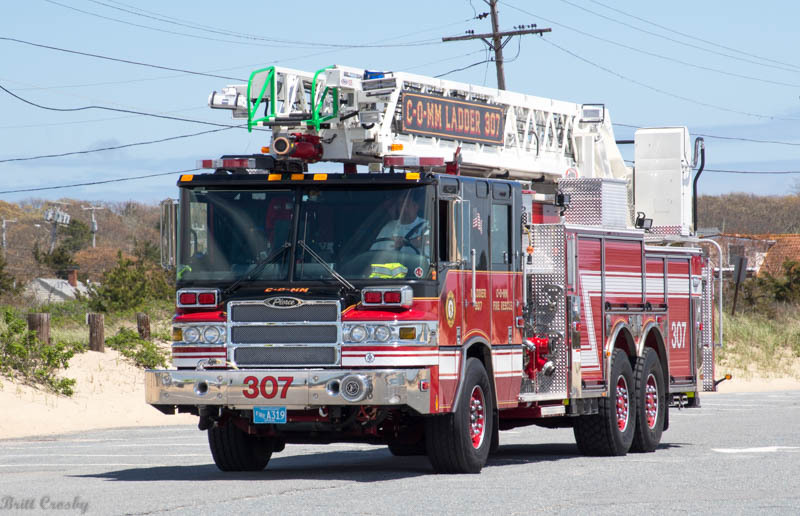 by a new Ladder Truck. 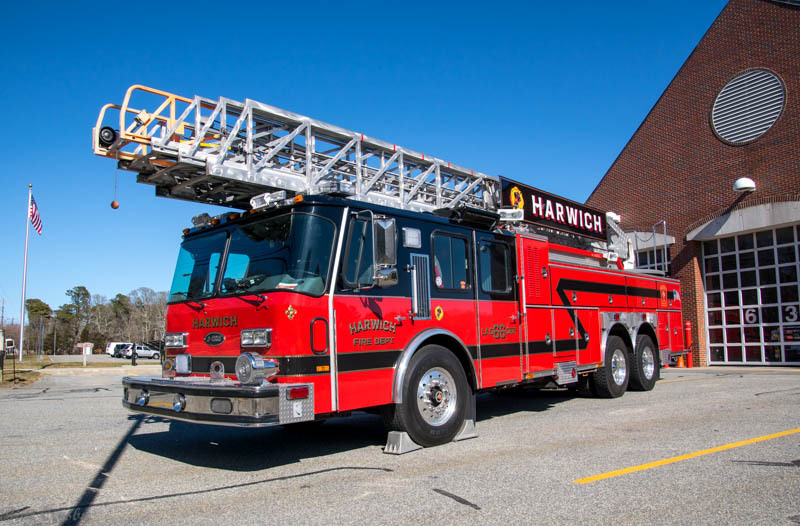 and carry the specialized rescue equipment on the new Ladder truck. 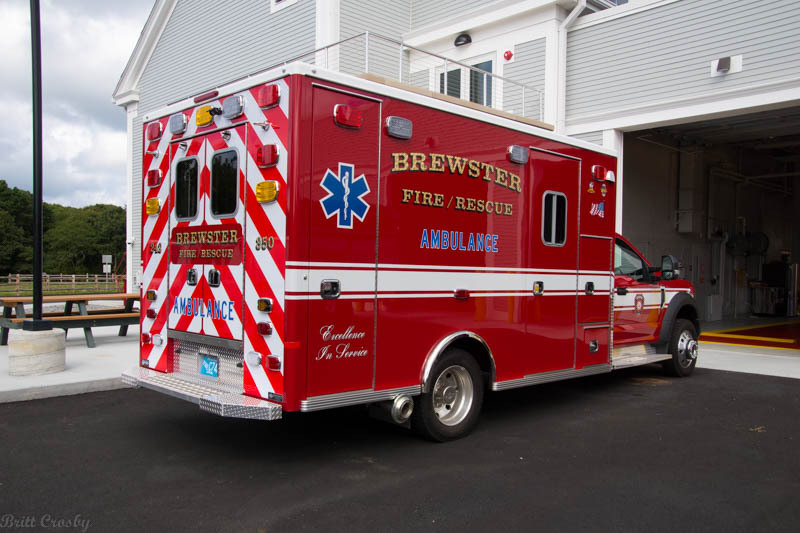 The plan would also include the purchase 2 new ambulances. 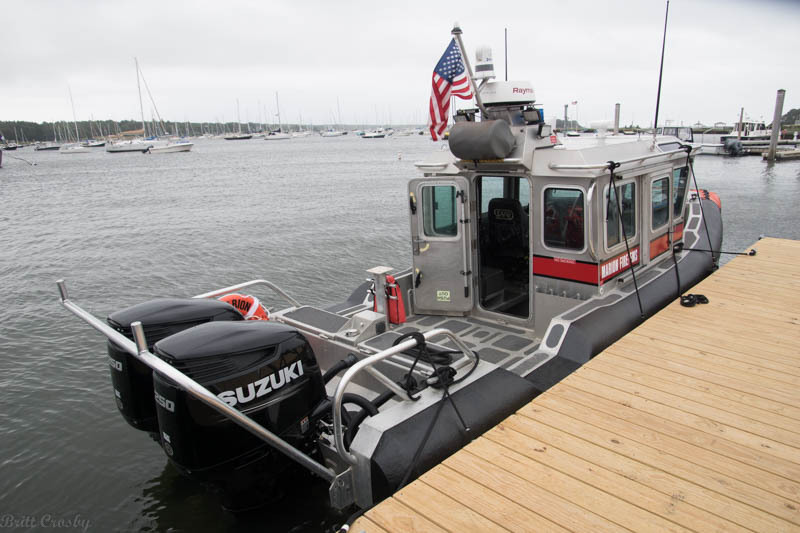 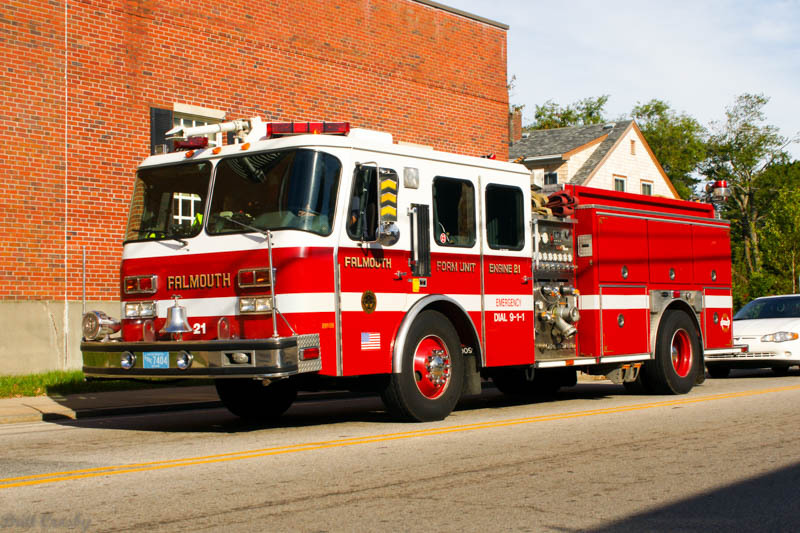 Falmouth is moving to the Ford F550/Lifeline Type I style vehicles. 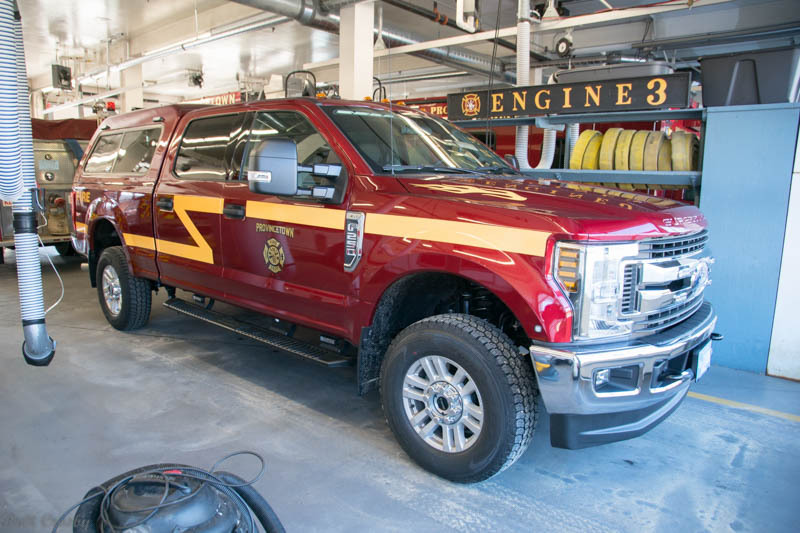 If this goes thru, purchases would likely be in 2019.
for Engine 21. 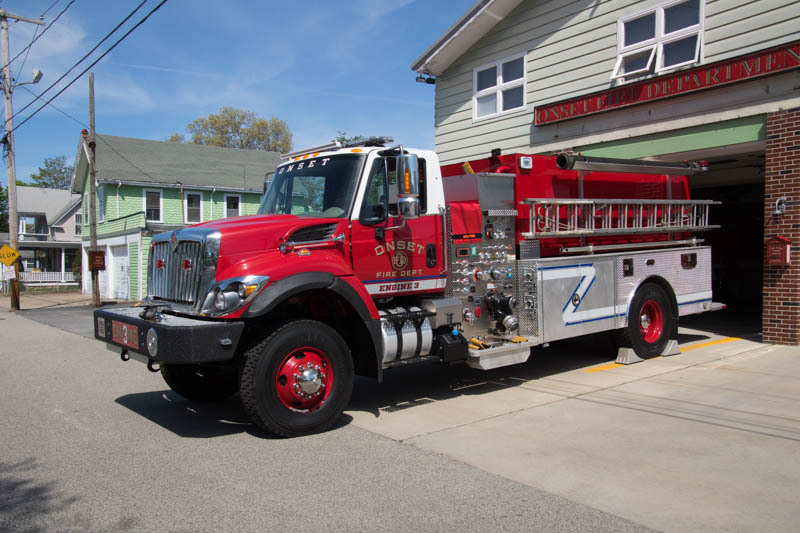 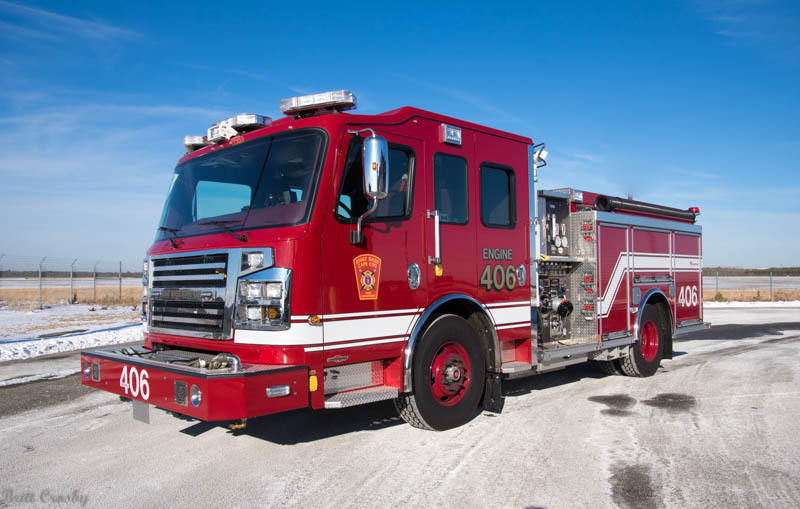 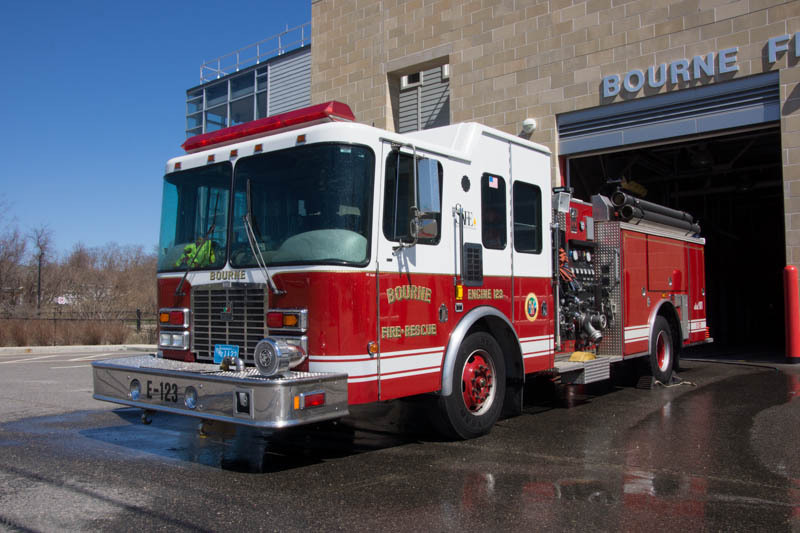 The 1500/720/30 Pumper will be assigned to Station 1.
will once again go back to Woods Hole as Engine 22.
was retired in 2017 due to mechanical issues. 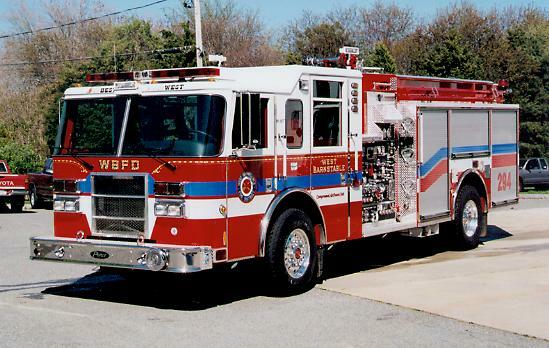 and will return to service as the spare engine. 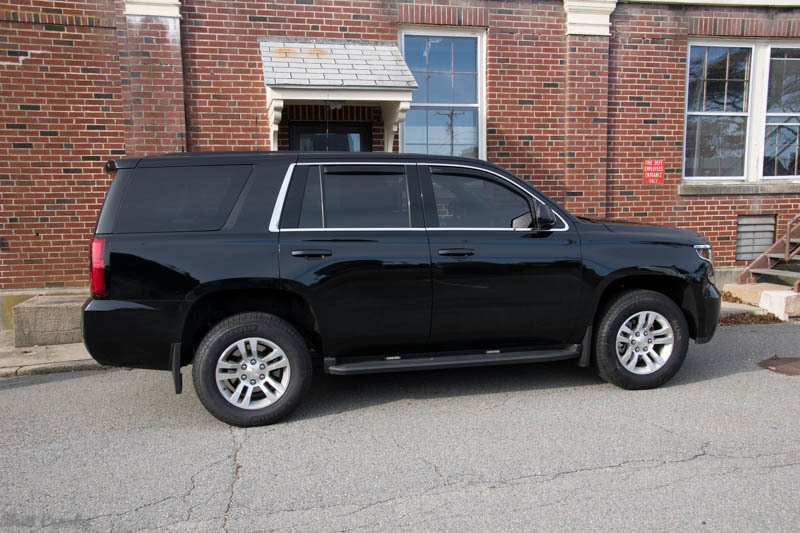 but that apparently has been put on hold for now. 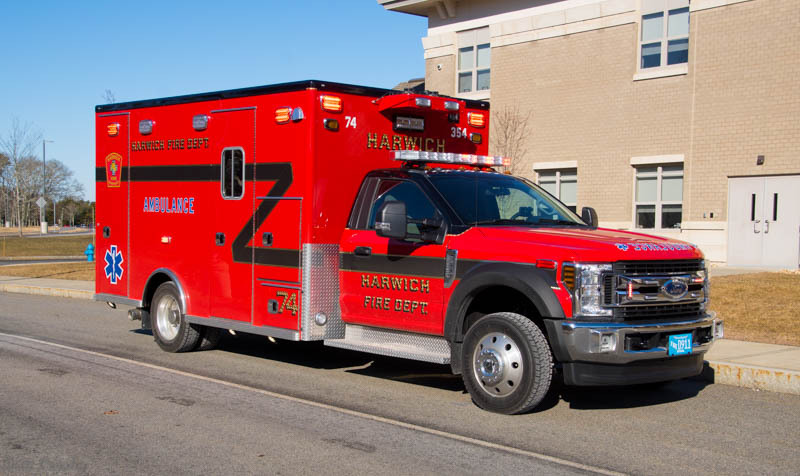 Harwich has put a new ambulance in service as Amb 74. 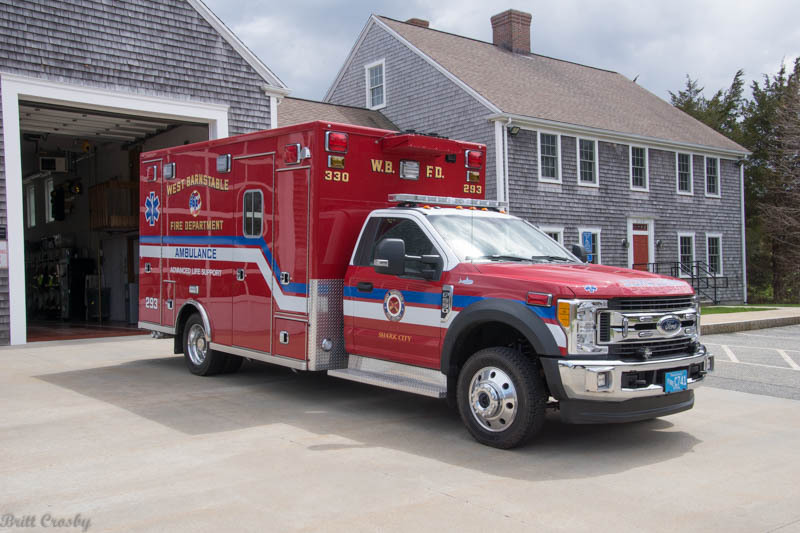 2019 Ford F550 / Life Line Type I Ambulance. 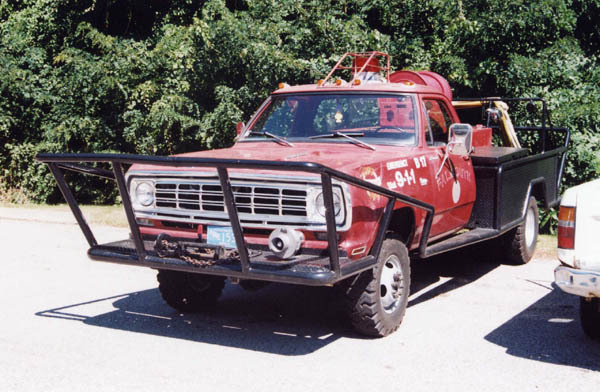 Station 2 and used for storms and off road situations. 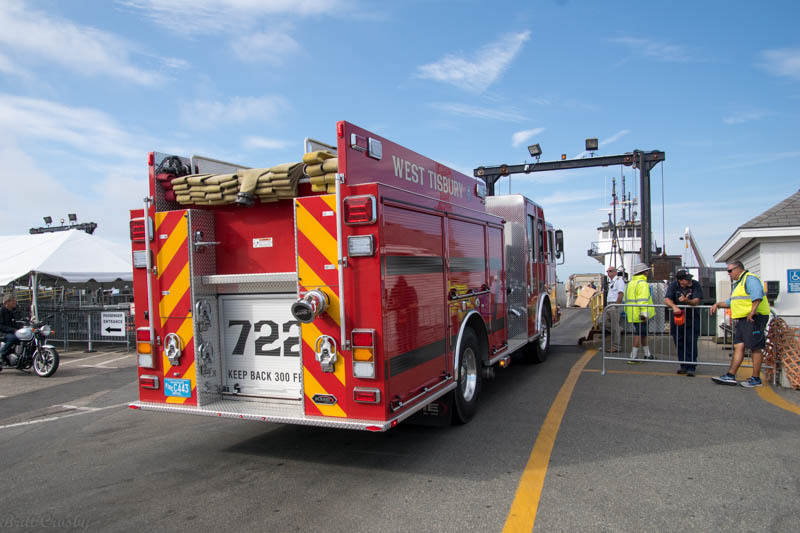 has been assigned to Marine 76 at Station 1. 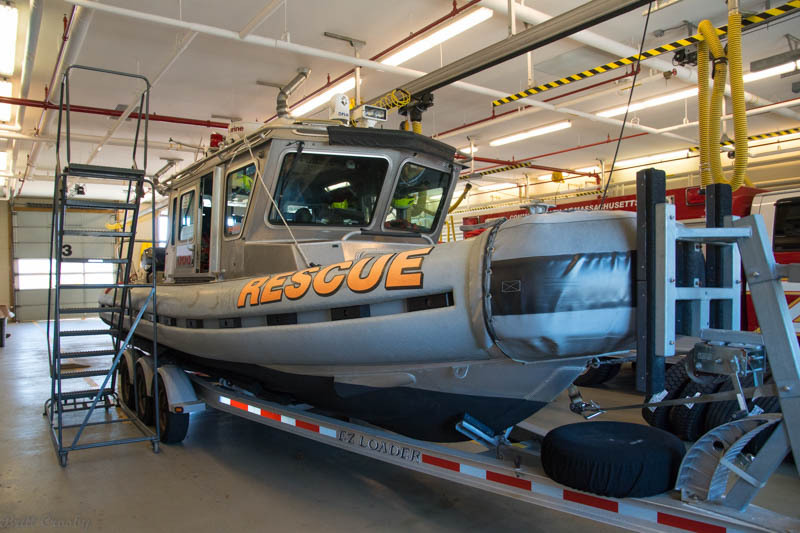 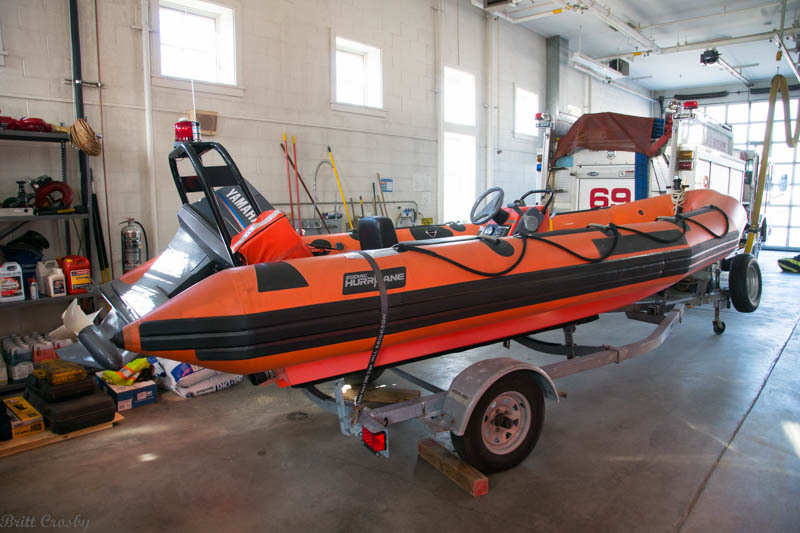 A second similar boat is at Station 2.
along with ice rescue surfboards and kayaks for water rescue. 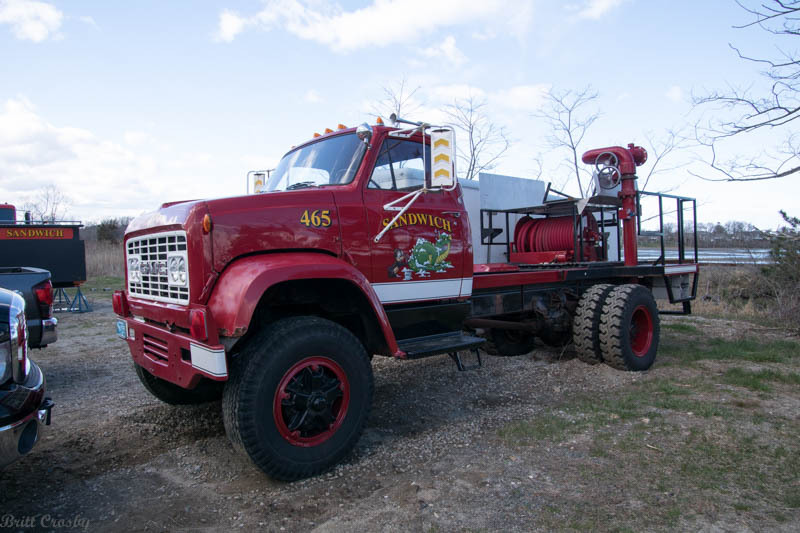 2000/750 Pumper that served as Engine 410.
and possibly a forestry unit. 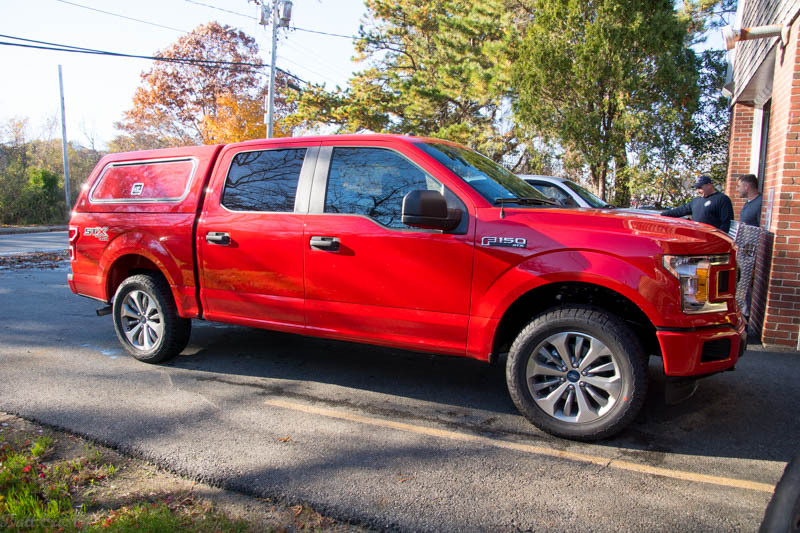 this Fall and may be totaled. 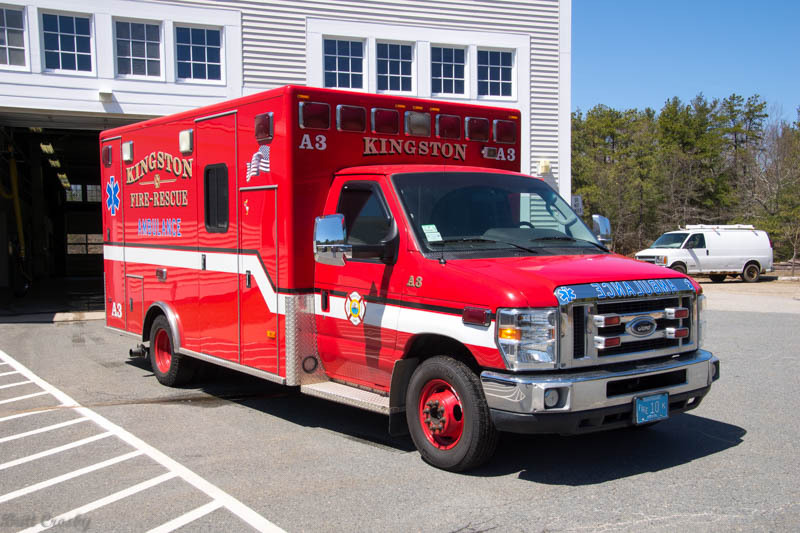 taken out of service after failing an inspection due to mechanical issues. 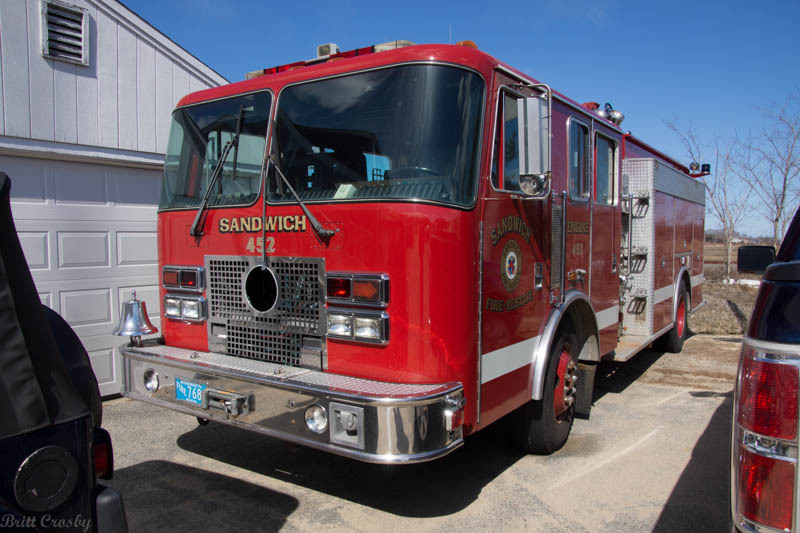 has been relocated to the Sandwich FD. 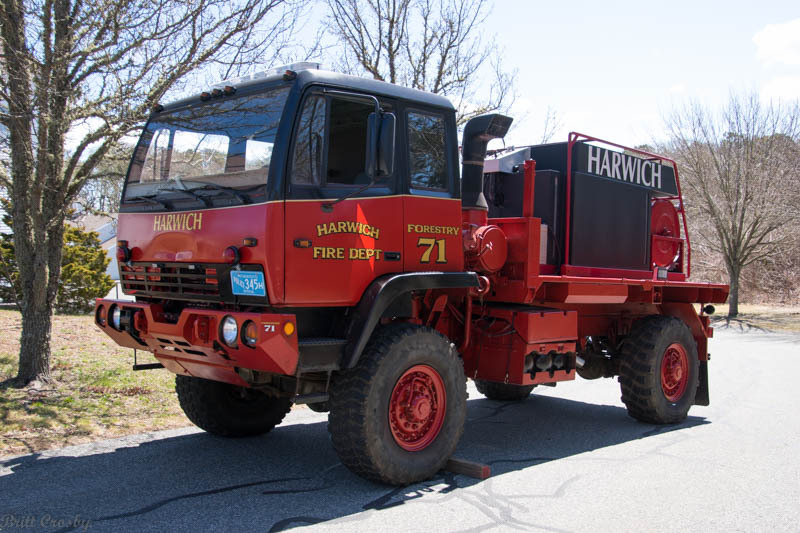 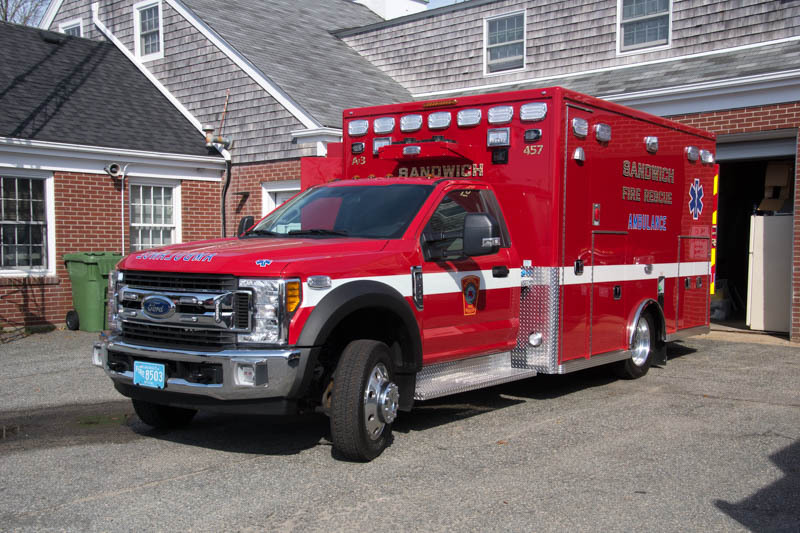 Nantucket recently took delivery of their first new brush breaker. 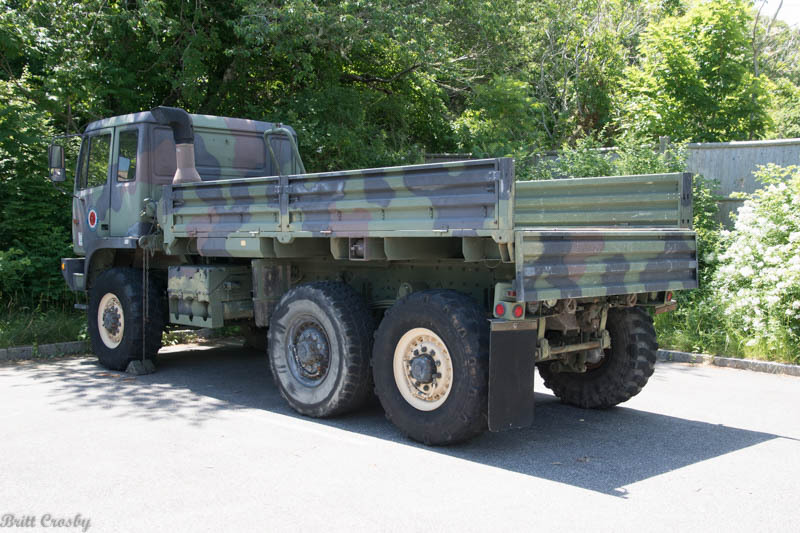 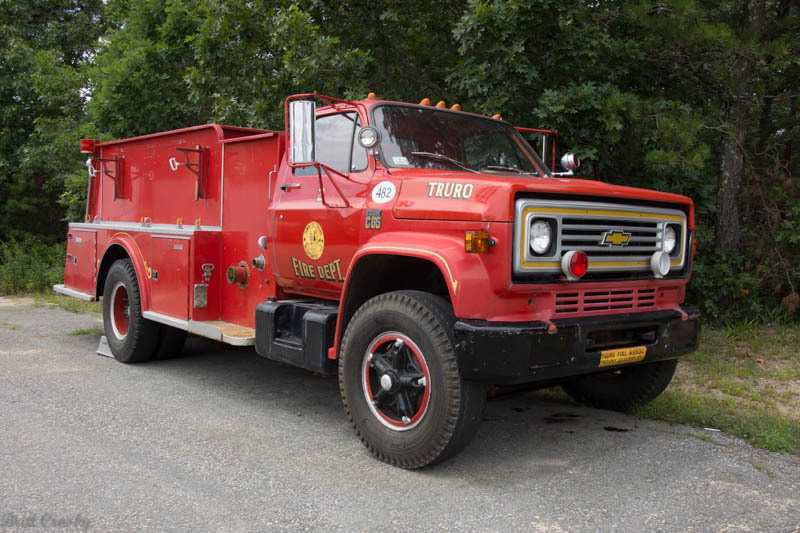 The breaker was built on a former military chassis by Fire-One. 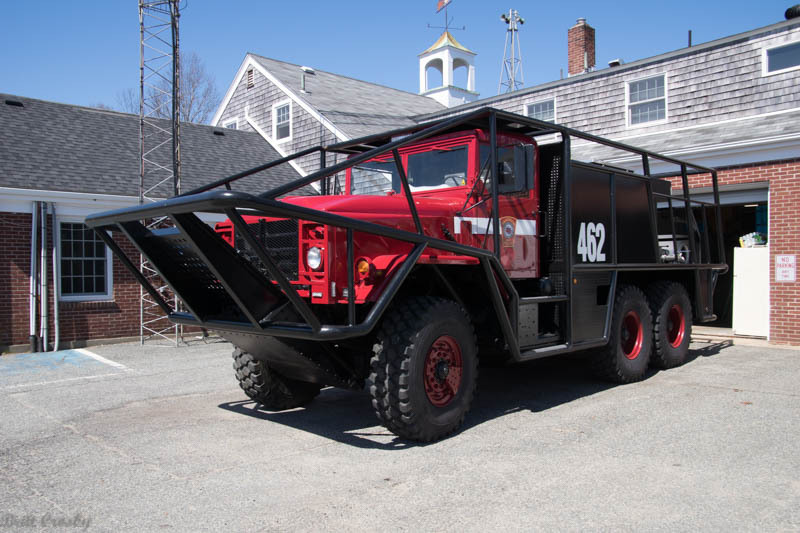 It has a 650 gallon tank and rear pump. 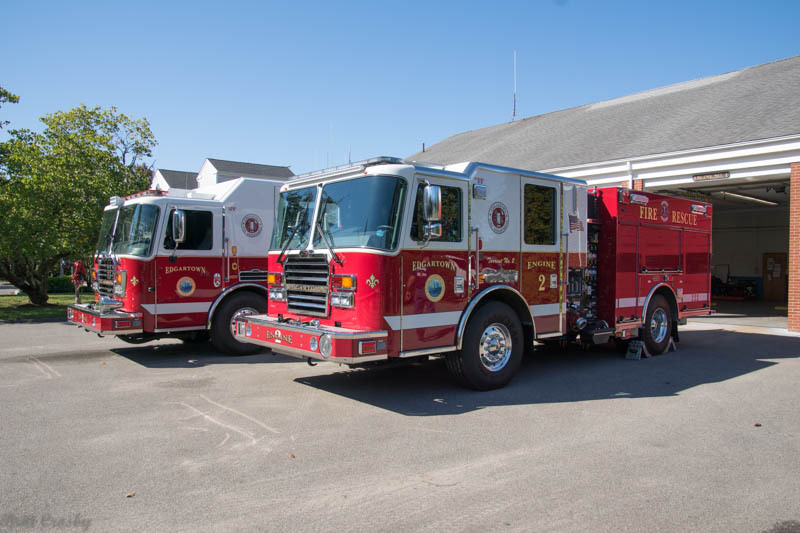 250 gpm / 2000 gallon tankers were put in service in May 2017. 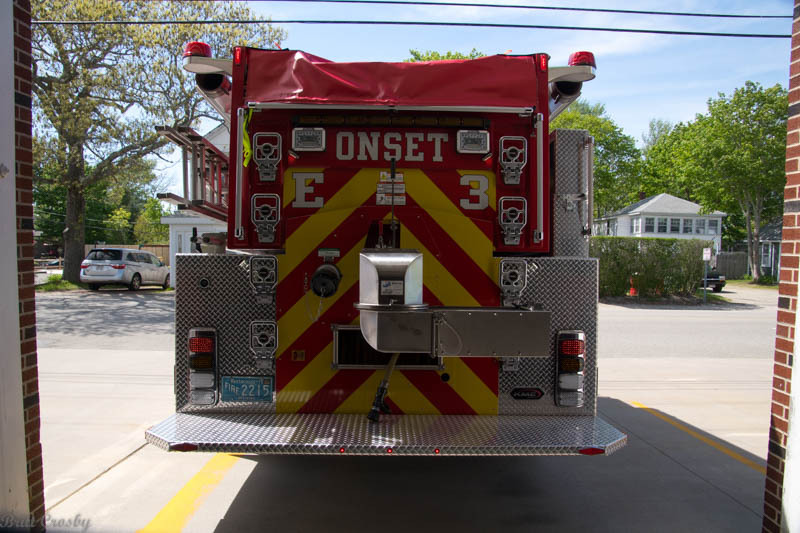 One at central station and one at Siasconset station. 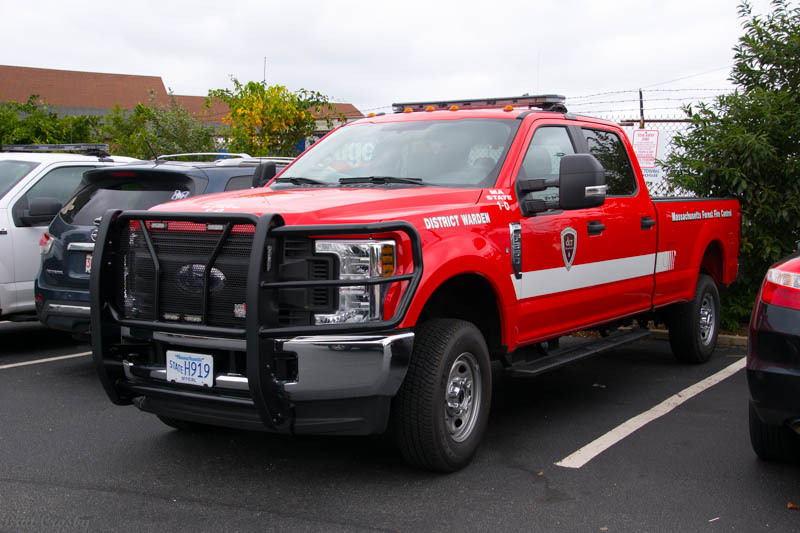 Ford F350 pickup on the island. 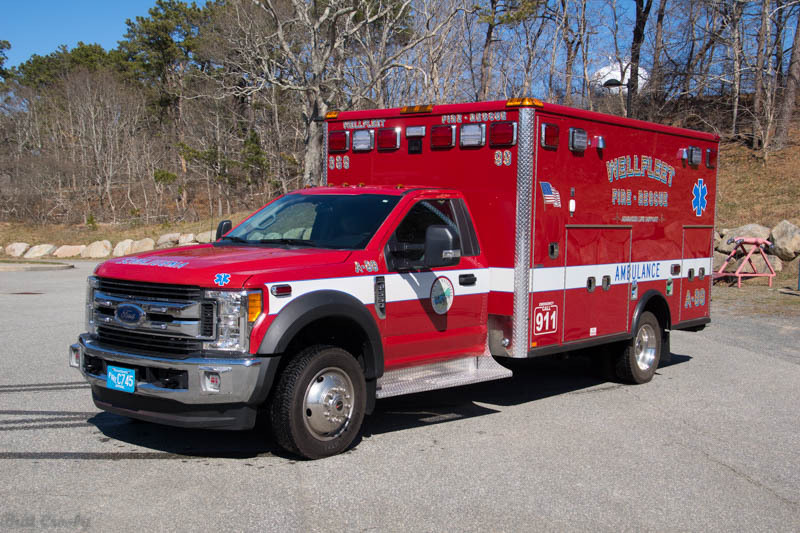 and a 2017 Ford F550 4x4 /Horton Type I Ambulance 2 in 2017.
with the department's new black over red colors. 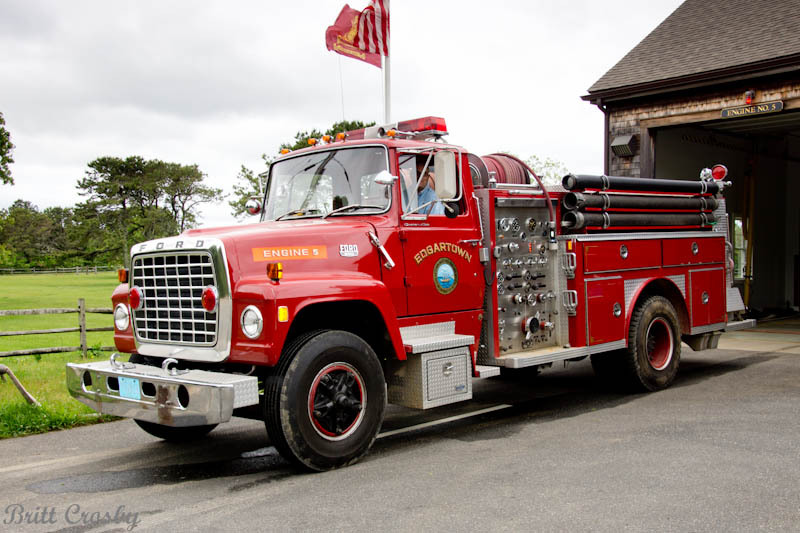 which is now Oak Bluffs Dive 541. 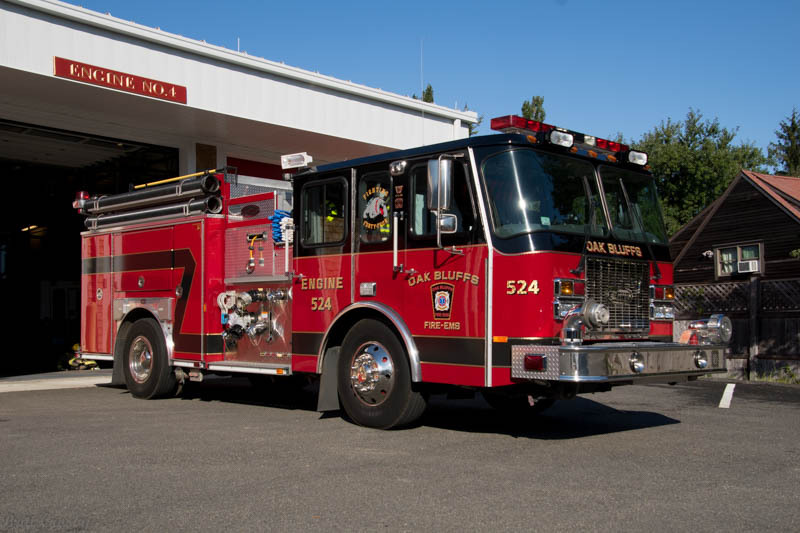 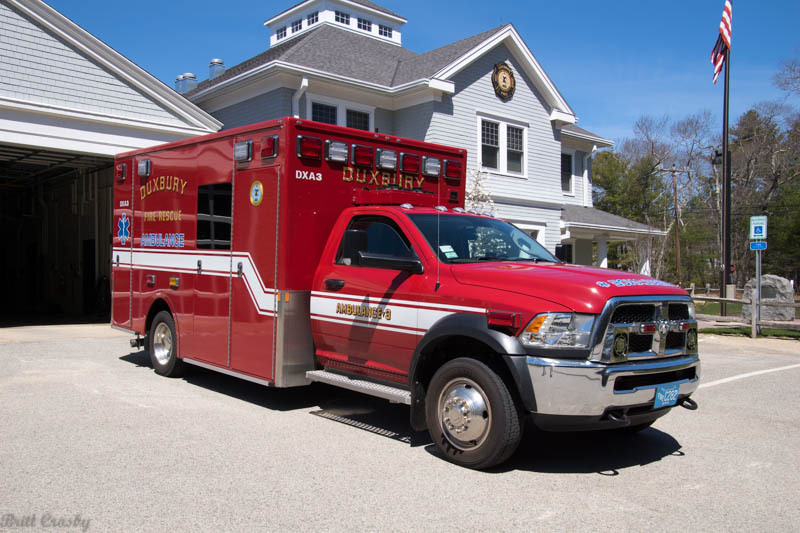 The Oak Bluffs FD also got a newer Rehab Unit for Oscar 85. 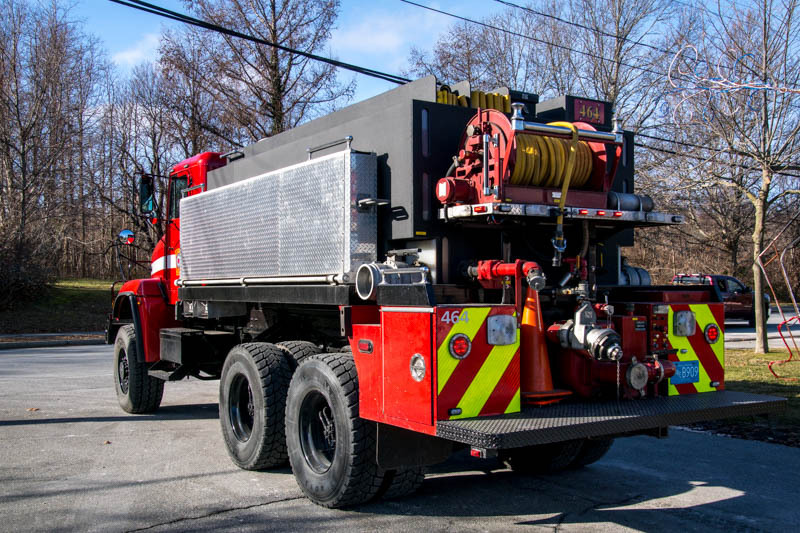 Breaker 148 that went out of service in 2017.
chassis and will be using in house skills to build the new truck. 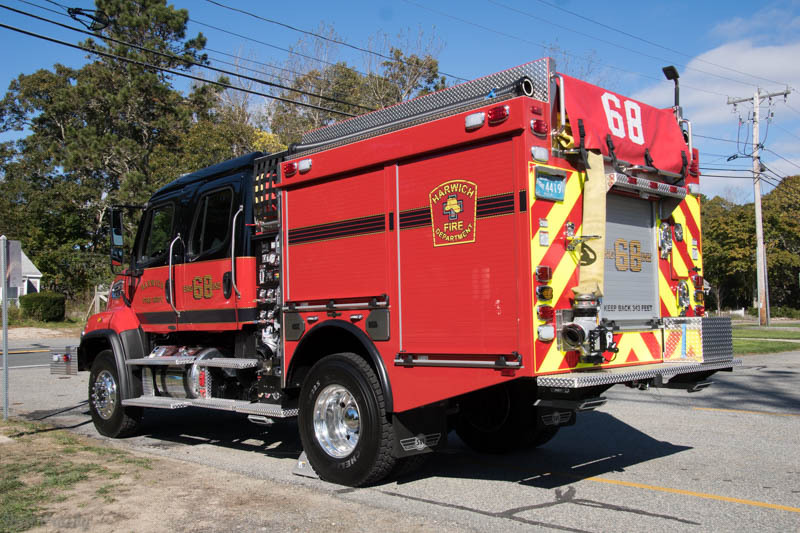 It will have a 350 gpm pump and 750 tank. 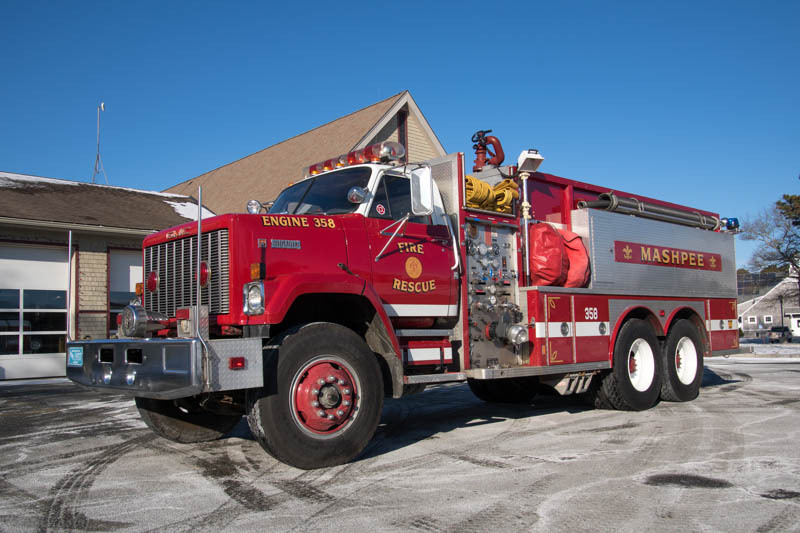 Onset is planning to replace the 1988 Maxim F Engine 1. 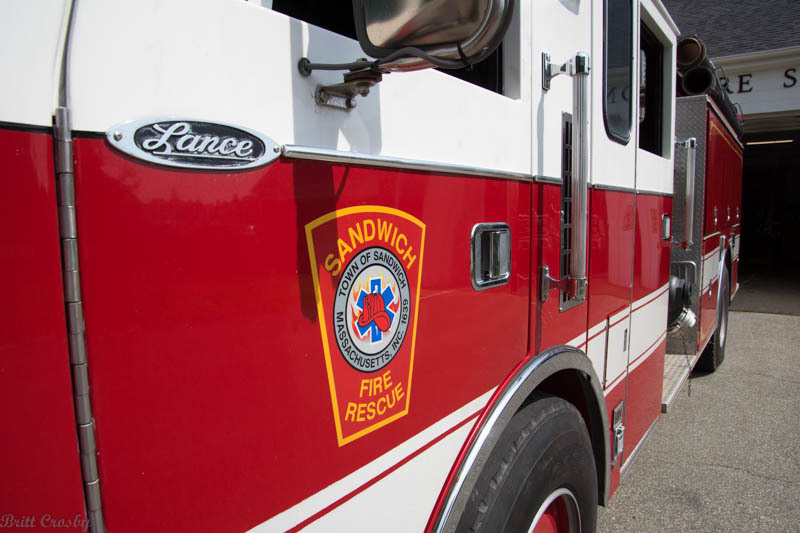 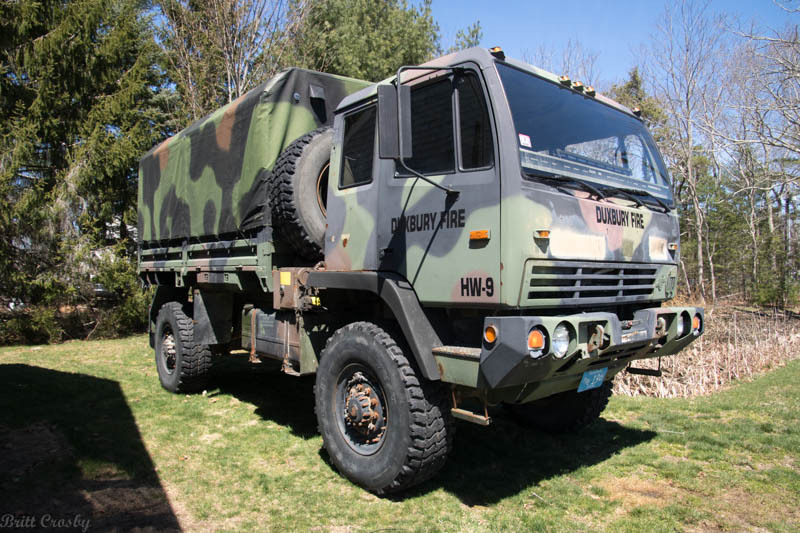 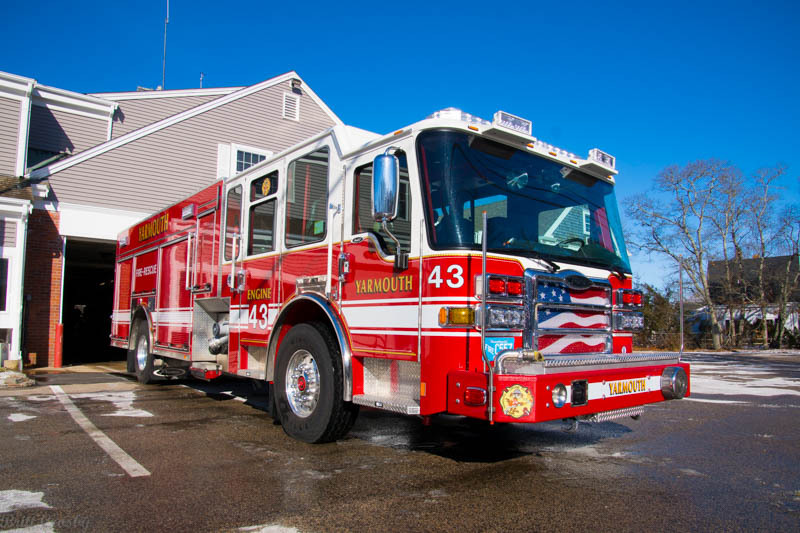 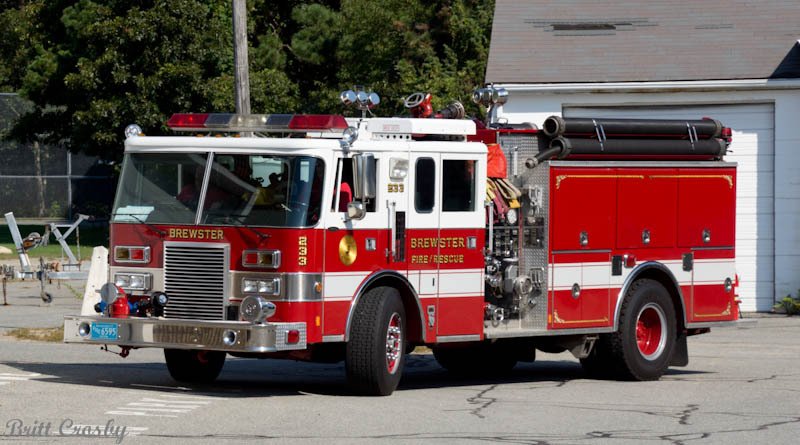 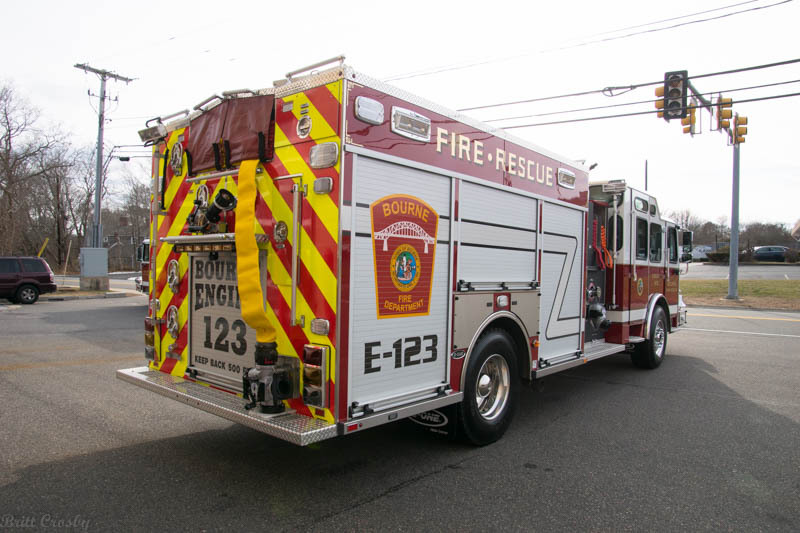 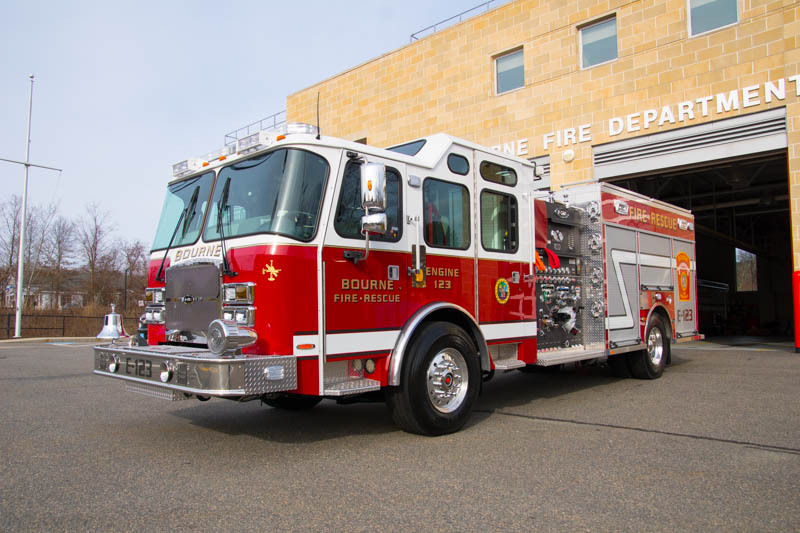 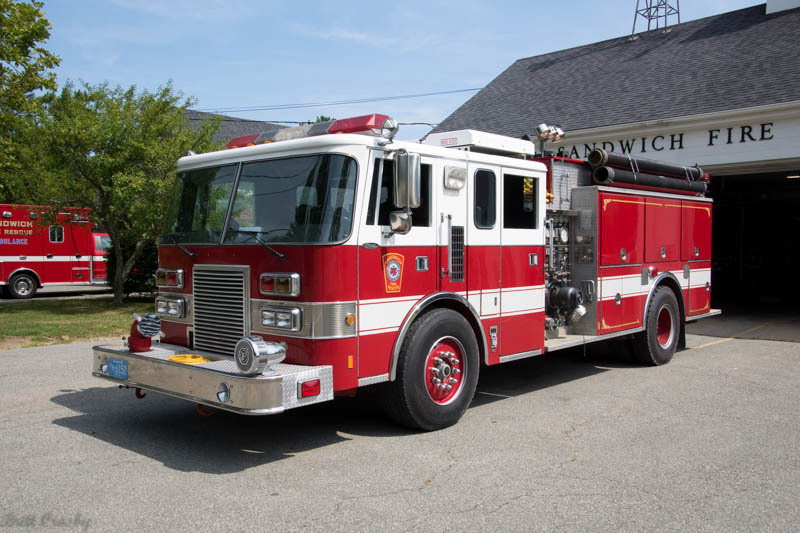 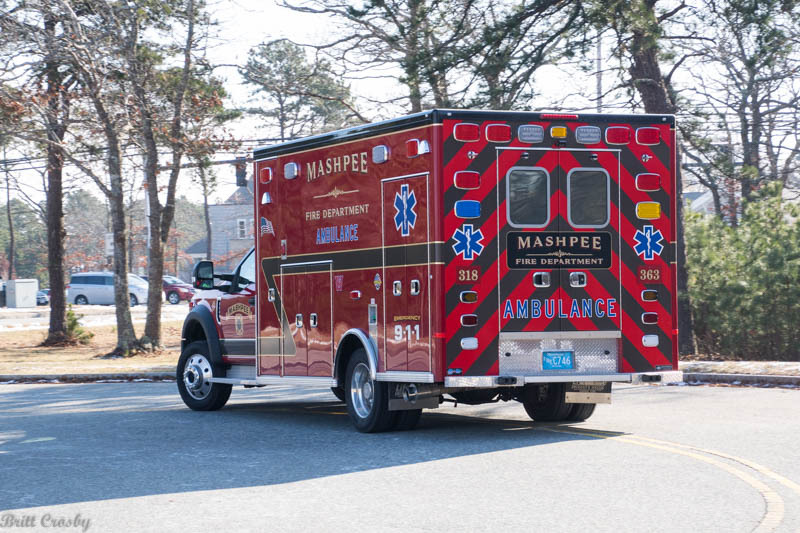 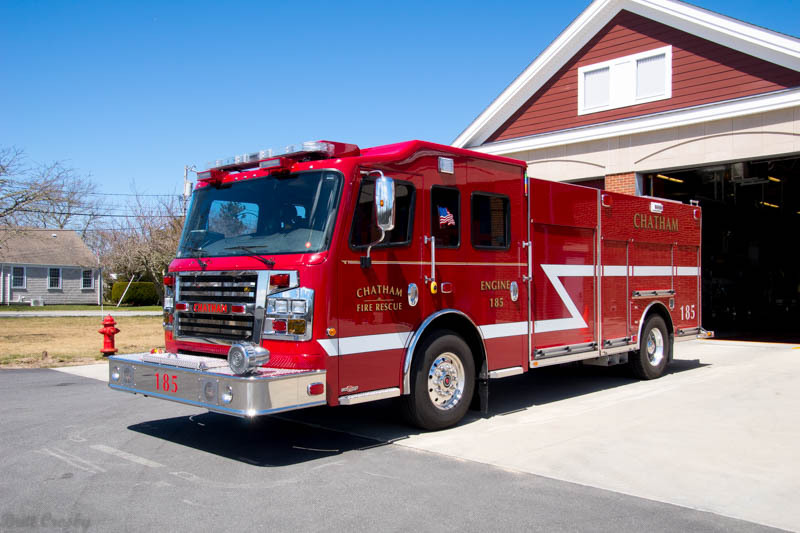 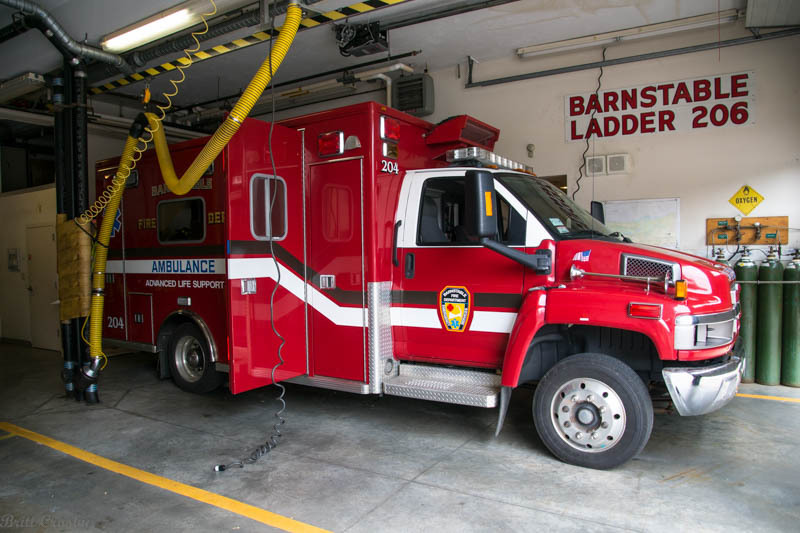 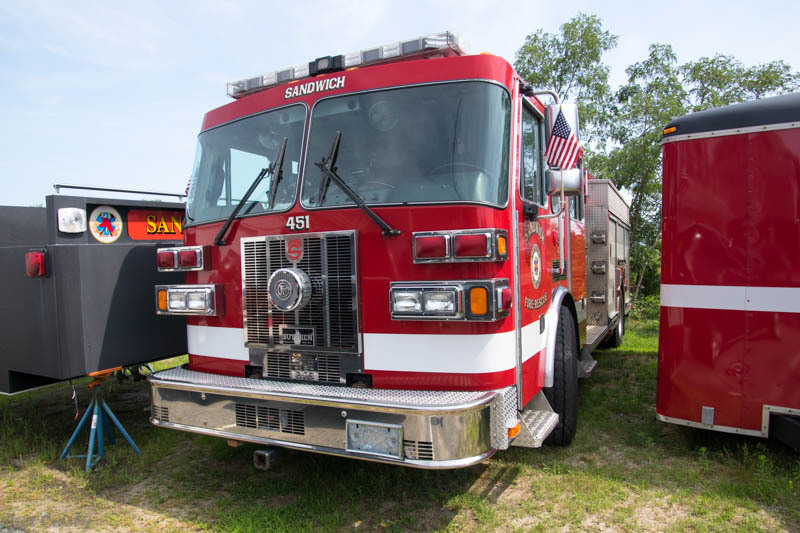 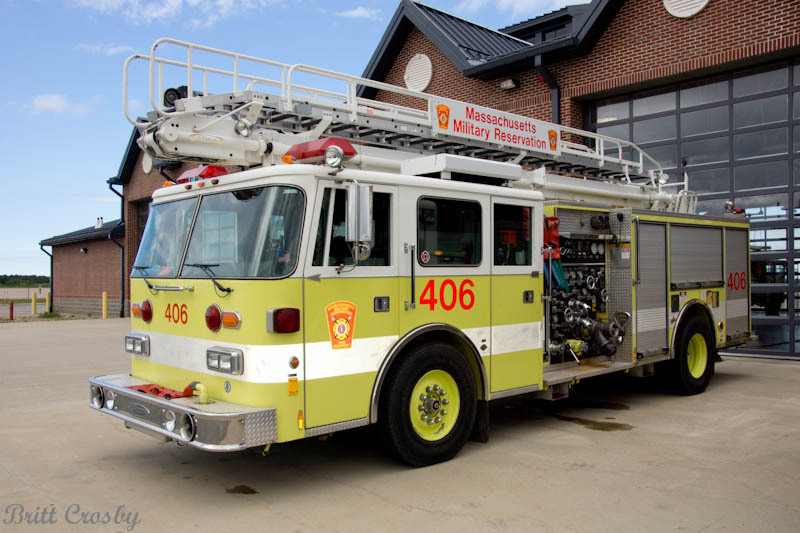 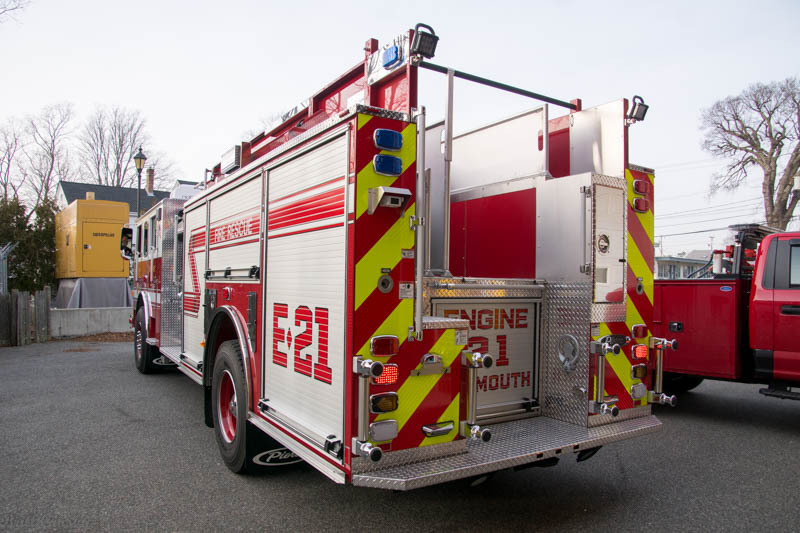 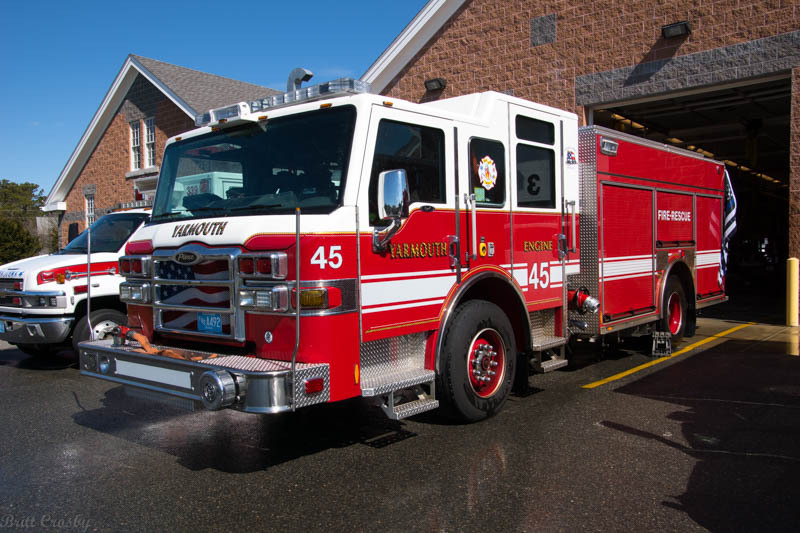 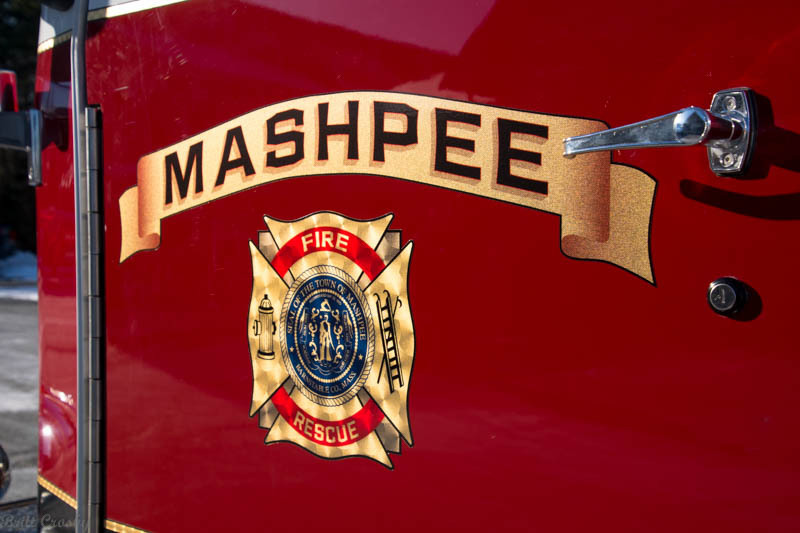 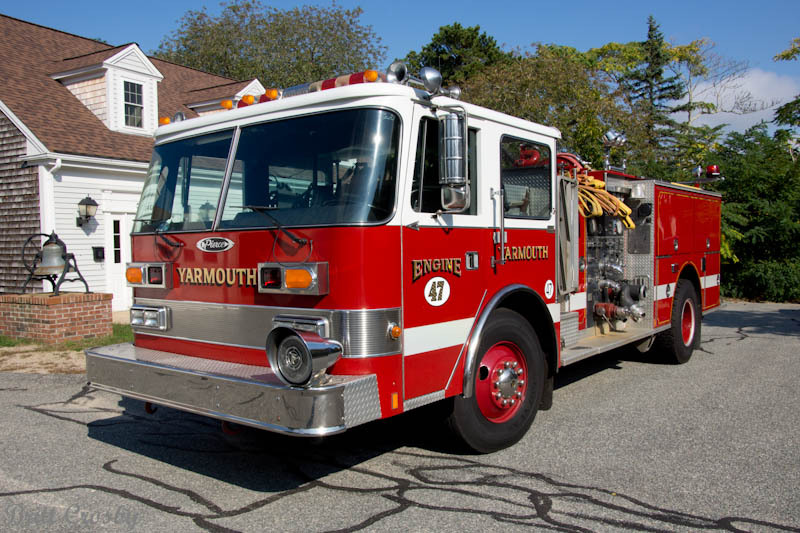 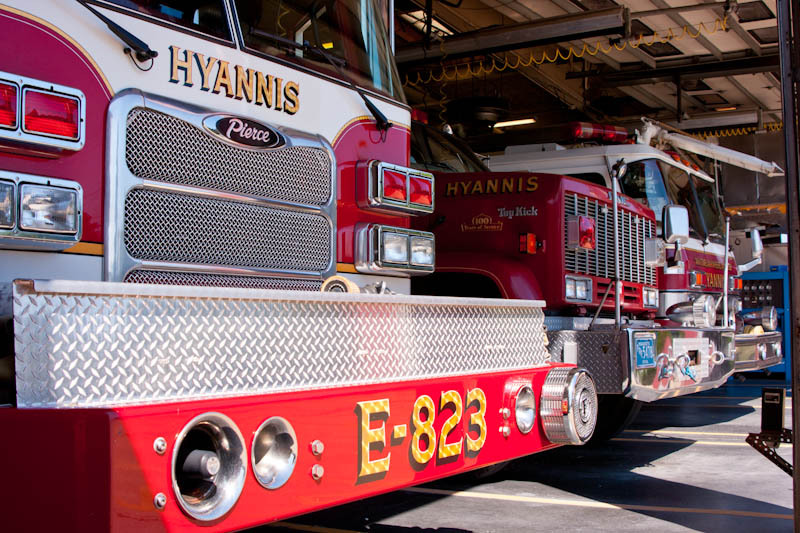 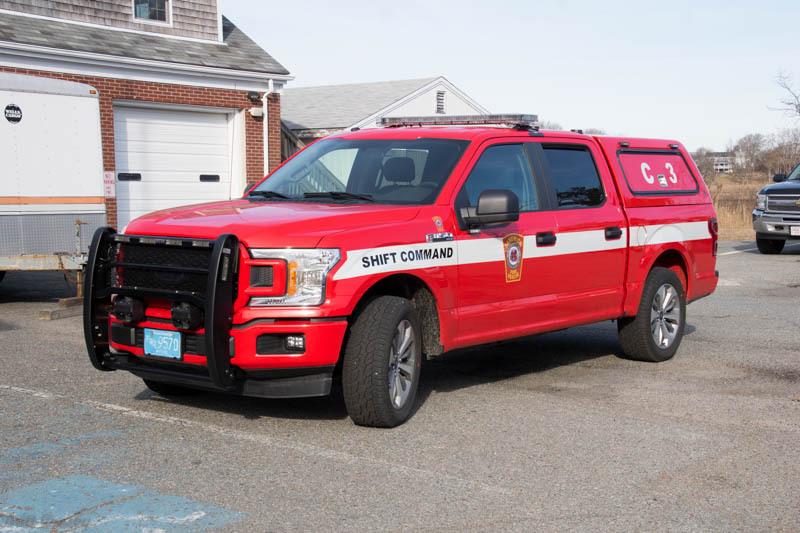 They will likely seek funding in 2019.
caught fire in the Manomet Fire Station in January 2019.
to return to service. 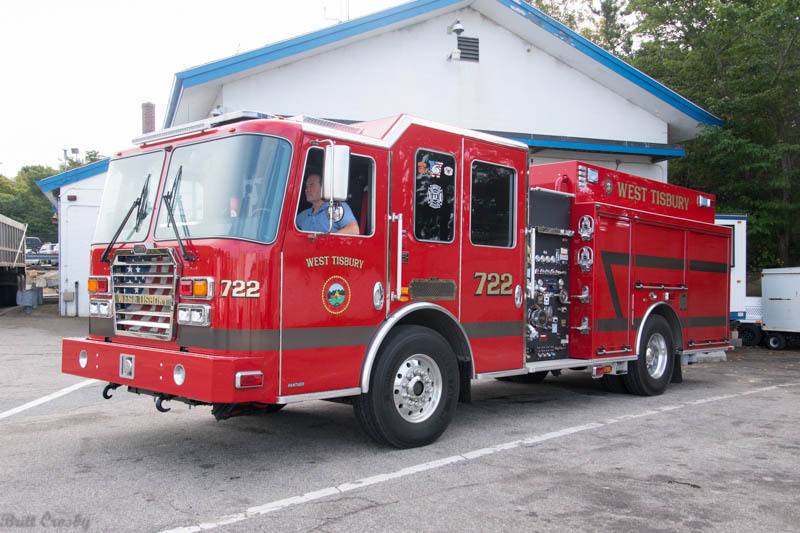 One of the spare engines is filling in. 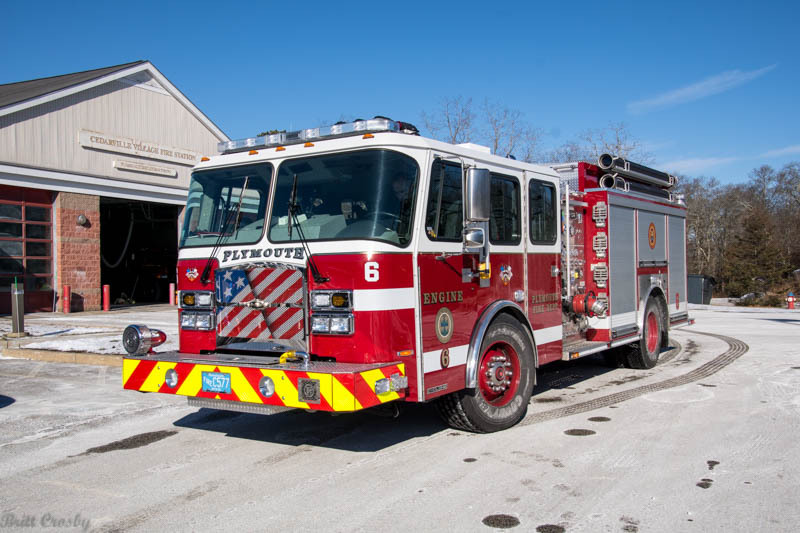 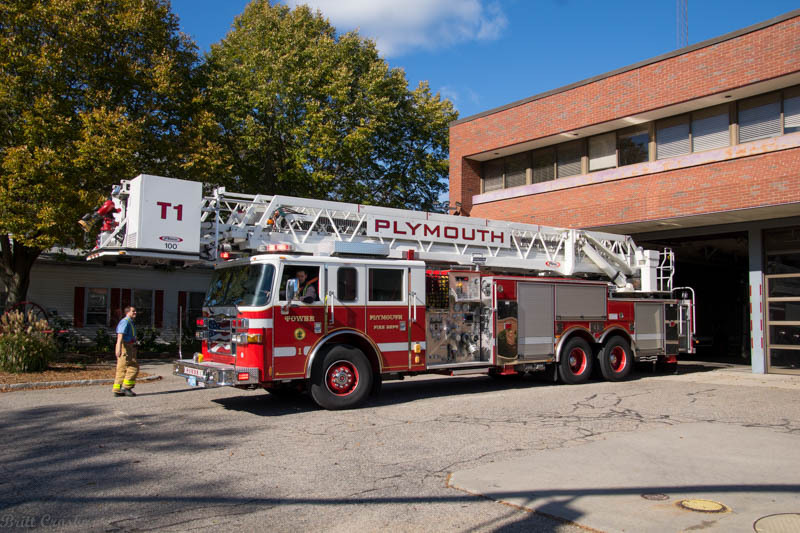 Plymouth is planning a 3rd Ladder company. 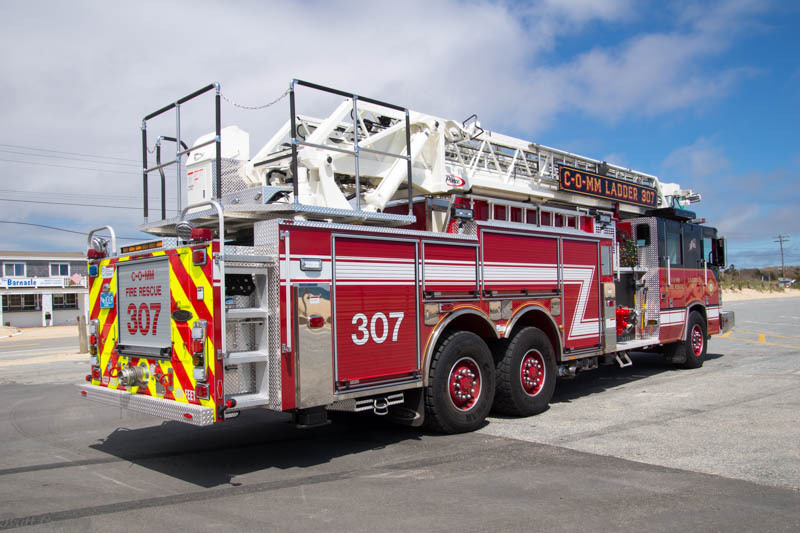 A 100' Aerial Ladder truck would add to the fleet. 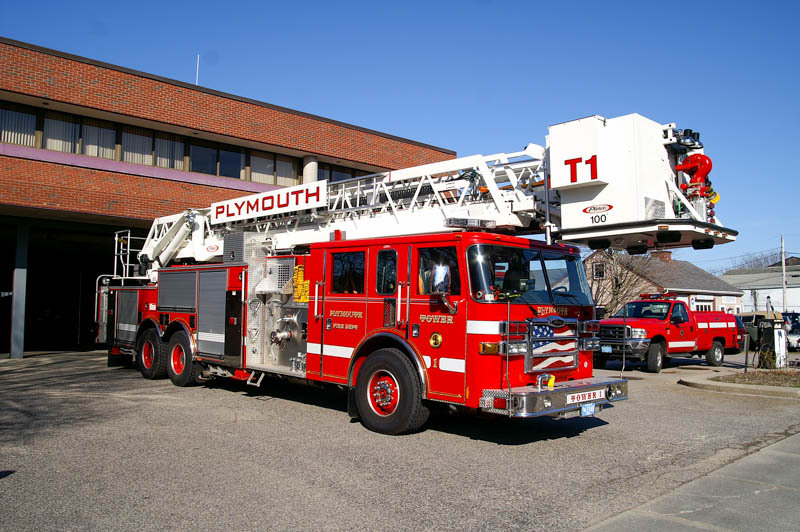 It may be assigned to a new North Plymouth Station 7 in the future. 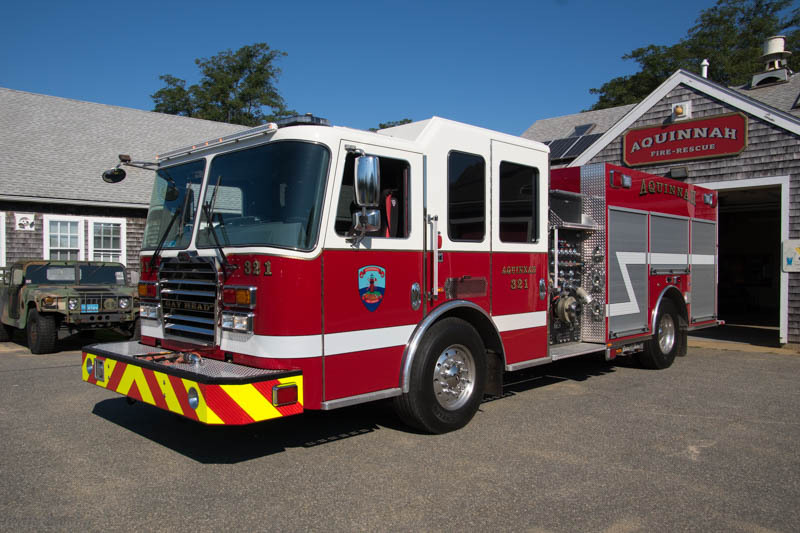 110 gpm pump and 400 gallon tank. 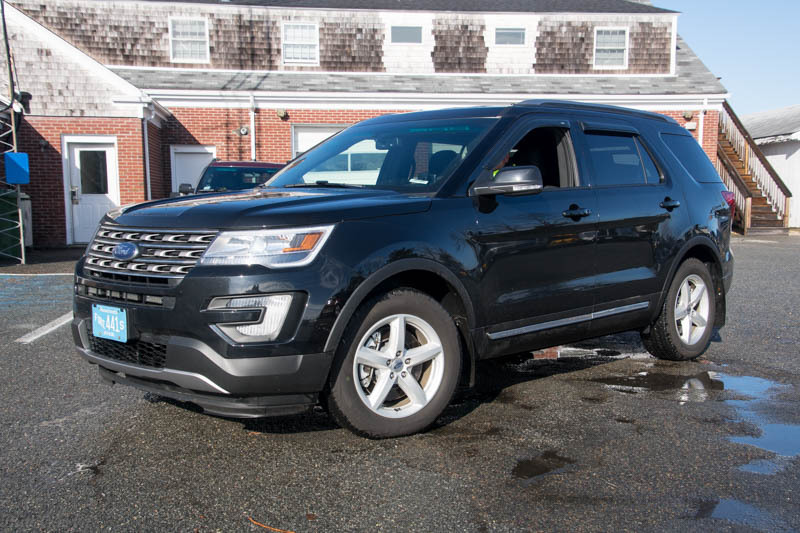 be at risk of failure and should be totaled and replaced. 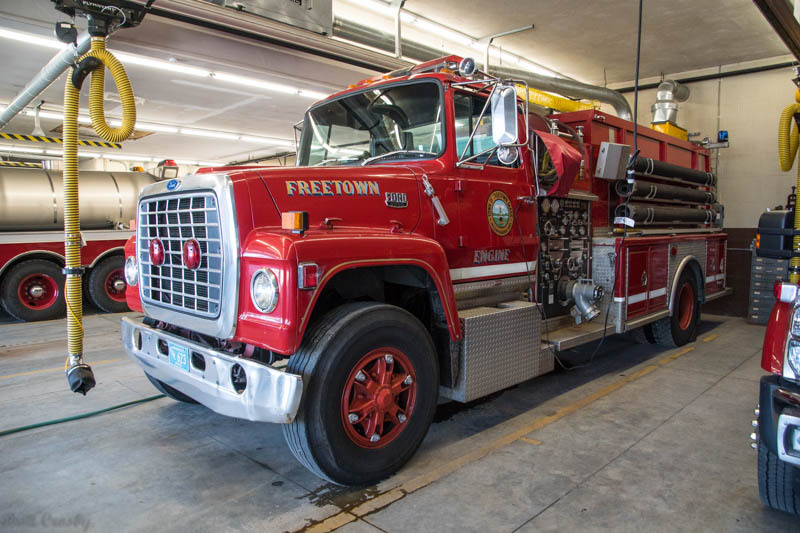 Funding was approved by voters, pending an insurance settlement. 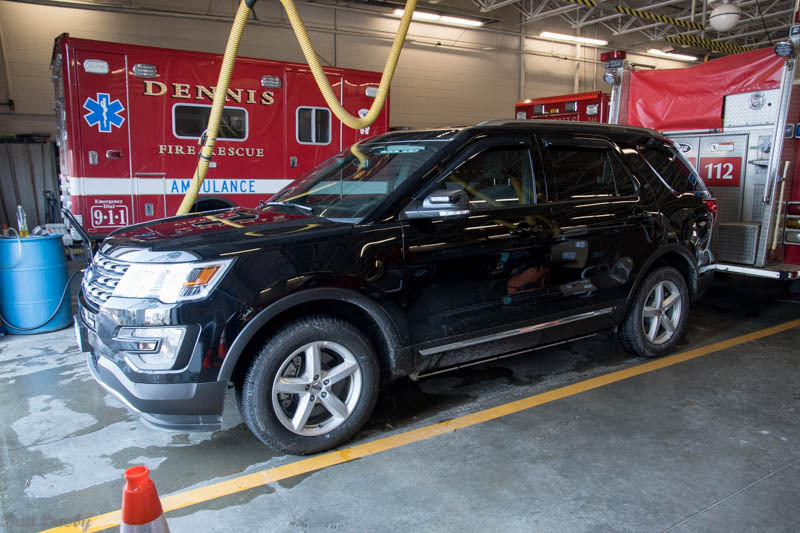 new apparatus can replace the damaged vehicles. 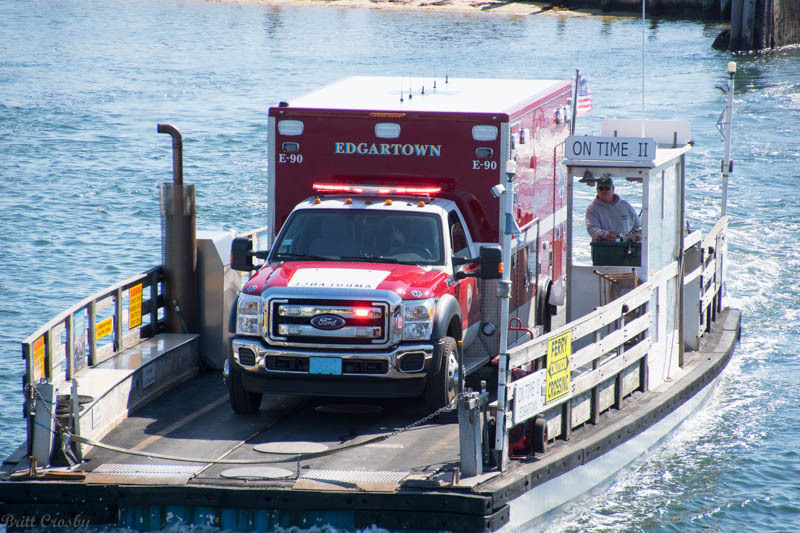 was also damaged by salt water in the storms of 2018. 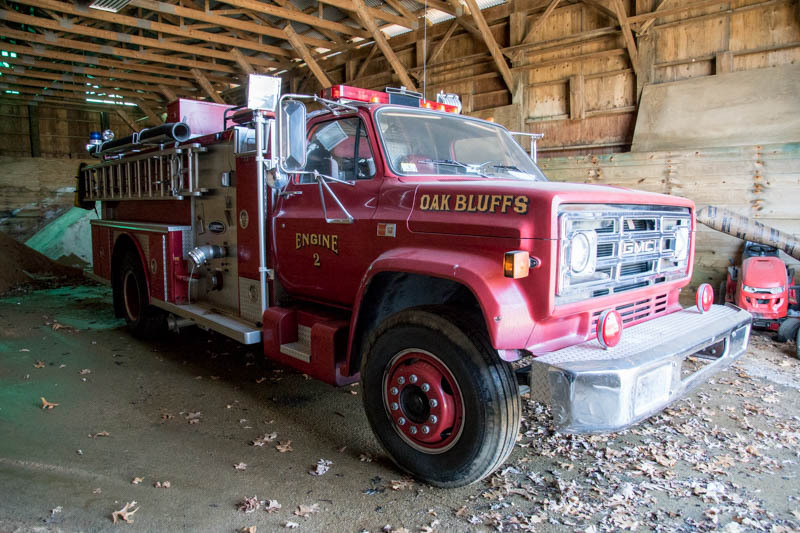 It has not yet been replaced and is still in service. 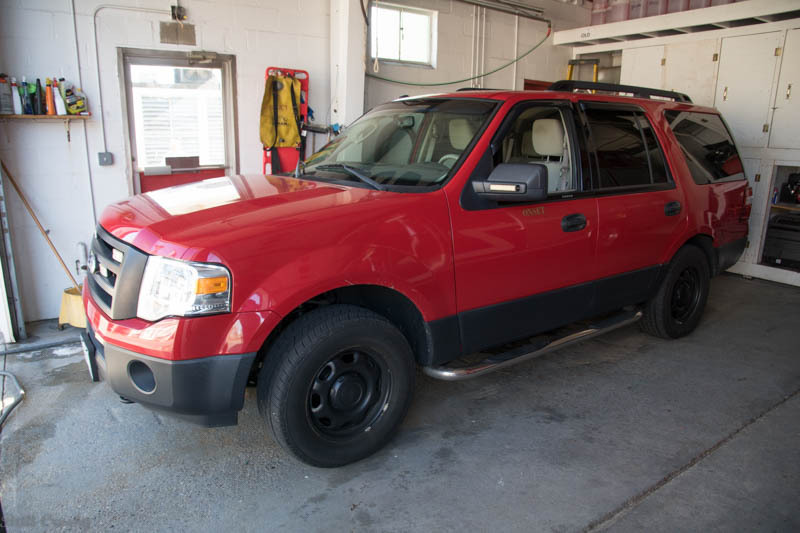 A 2004 former chief car is still used as a utility vehicle. 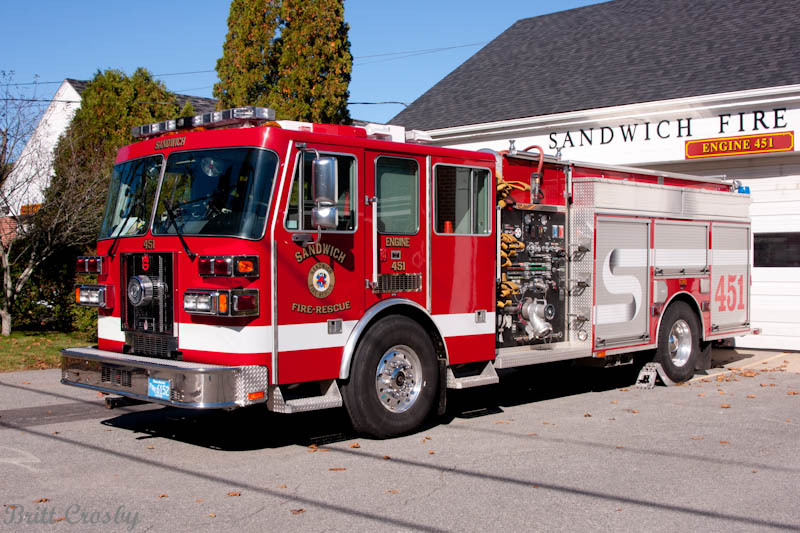 was taken out of service unexpectedly for major mechanical issues. 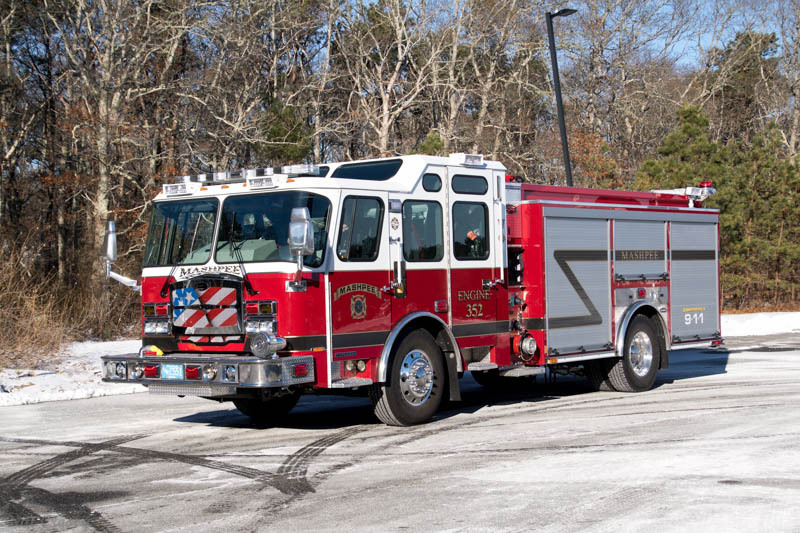 This left the department with only 2 engines to cover 3 stations. 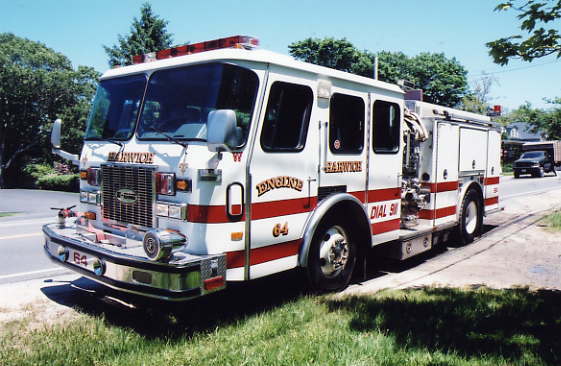 One would be assigned to Engine 451 (Eng 1) at Station 1. 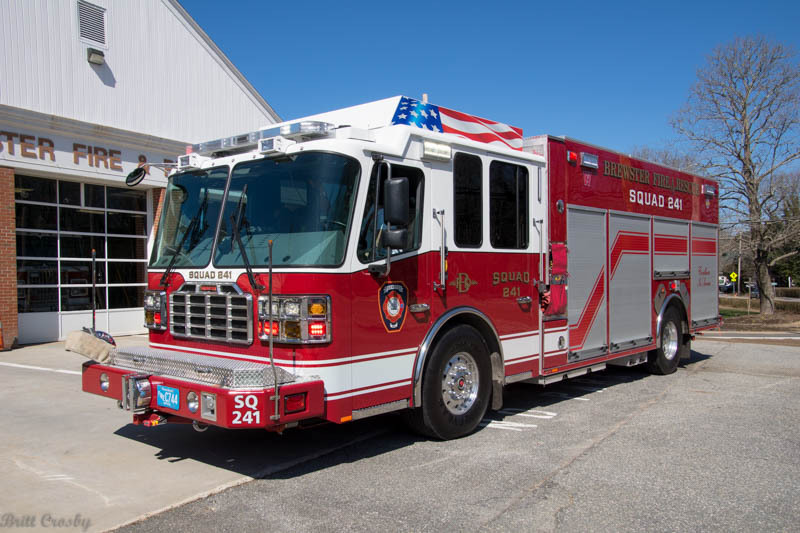 The other would be assigned to the new Forestdale Station 3 as Engine 453 (Eng 3). 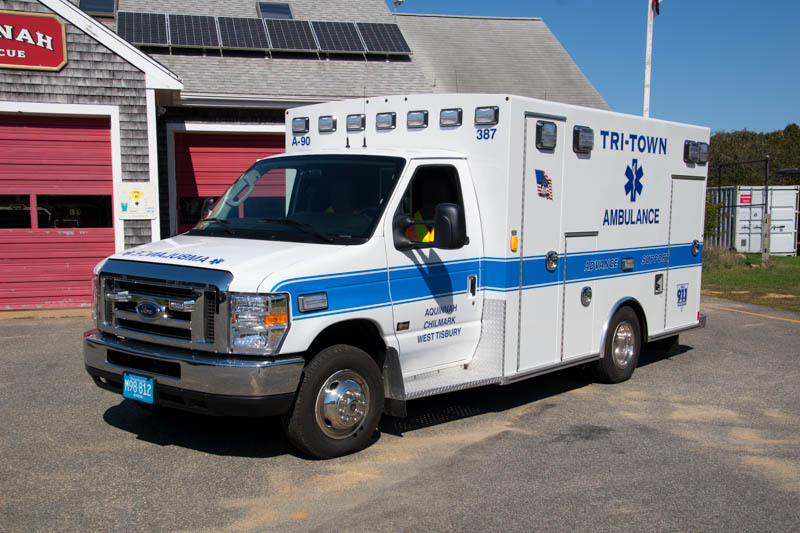 enable better coverage and service for the town. 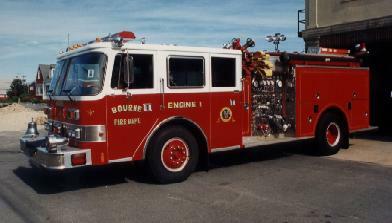 1989 Pierce Lance as a spare engine. 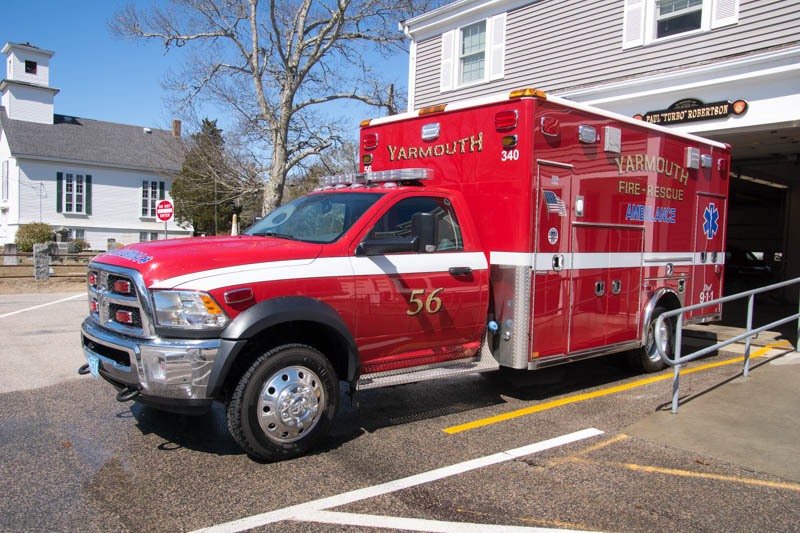 Ambulance 458. 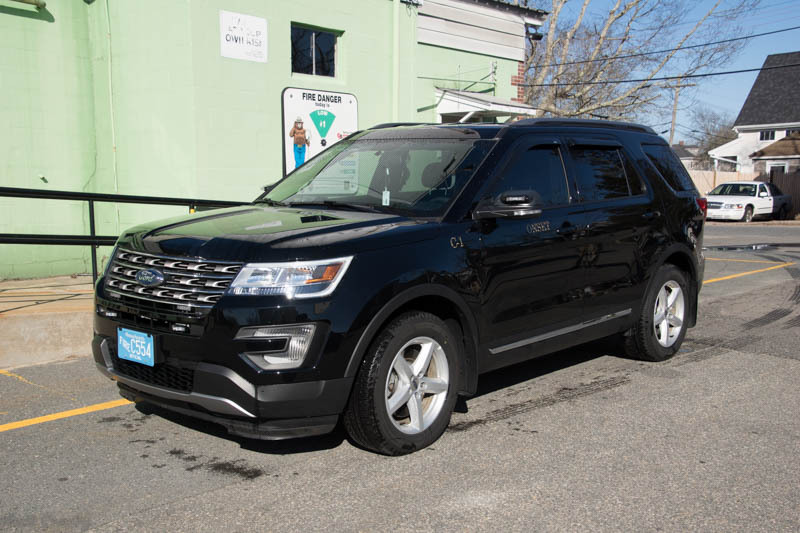 It is expected around May 2019.
the rare occasion, but have special needs. 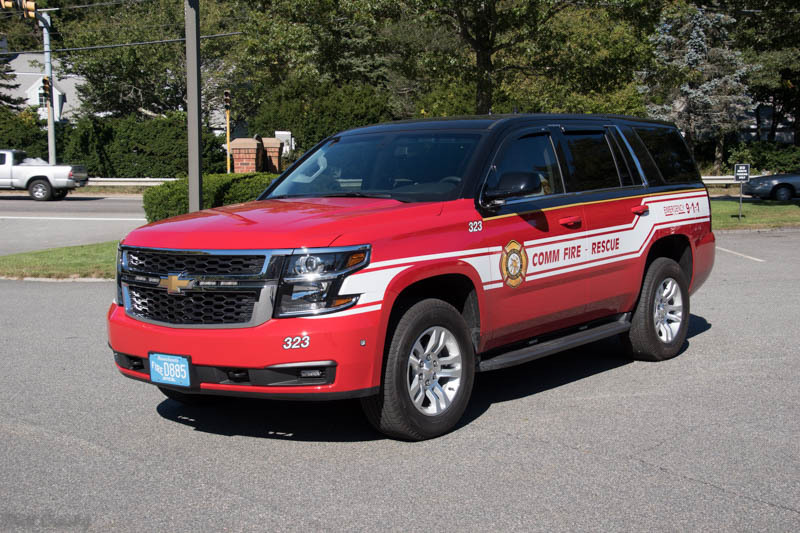 It would likely be assigned to the new Station 3.
with a full cap in service as the Command Car 460 (Car 3). 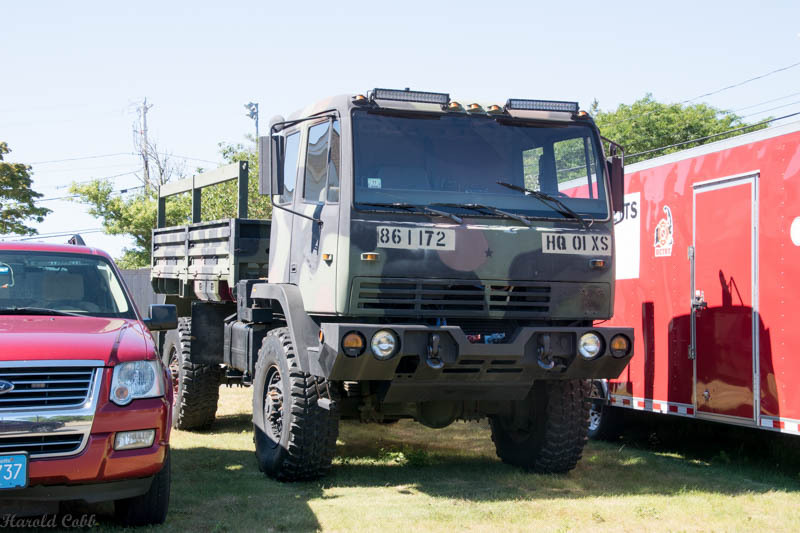 computers, radios, and supporting communications equipment. 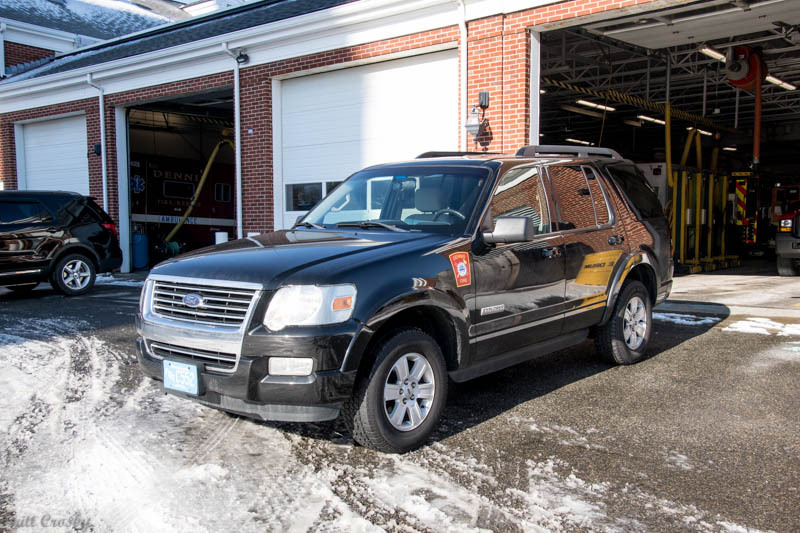 The Duty Officer is currently assigned to Station 1 with the vehicle. 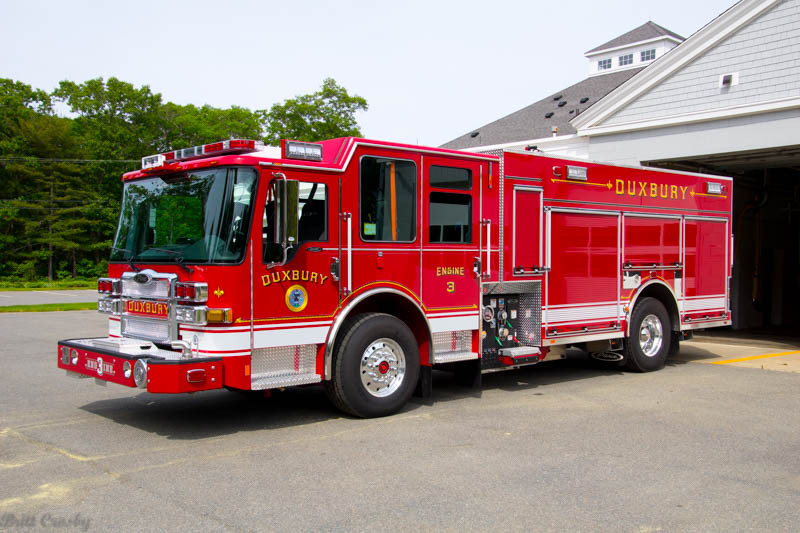 Plans are to move the Duty Officer to the new Station 3 when it opens. 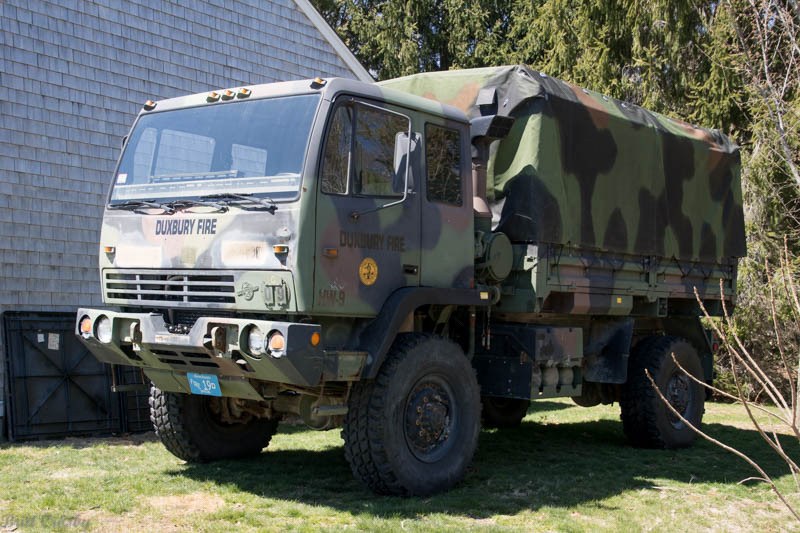 to be used as a school and support vehicle. 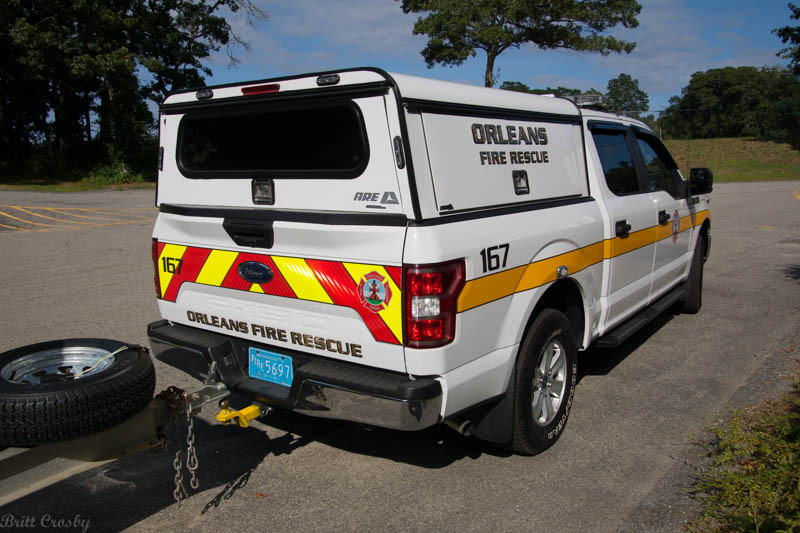 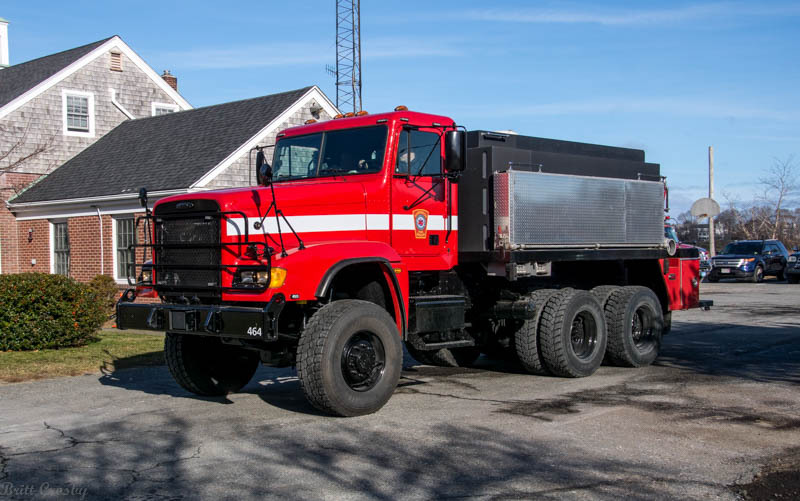 It replaced the 2008 Ford Taurus Car 455.
forestry truck will remain at Station 1.
to be used as the platform to replace the former Foam Tanker 465.
a Jaws training drill in 2018.
a foam tanker and opened the use of the chassis for other purposes. 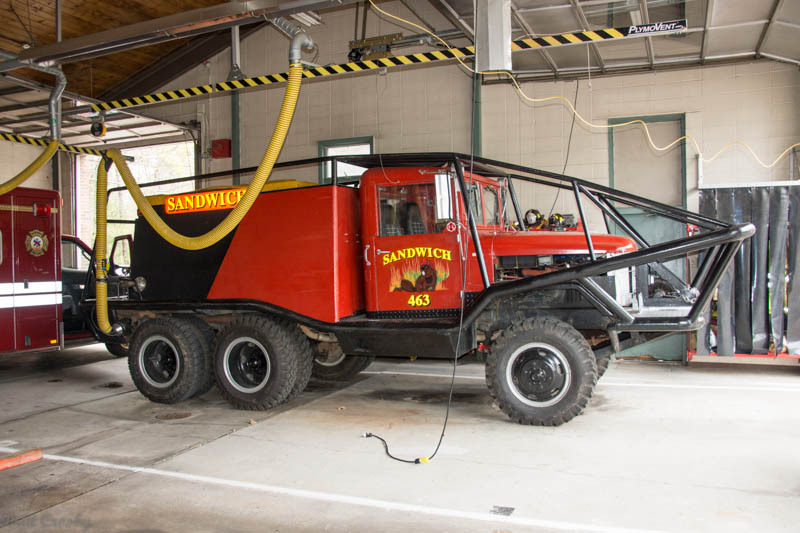 Sandwich is assessing the best options for using the 2009 chassis. 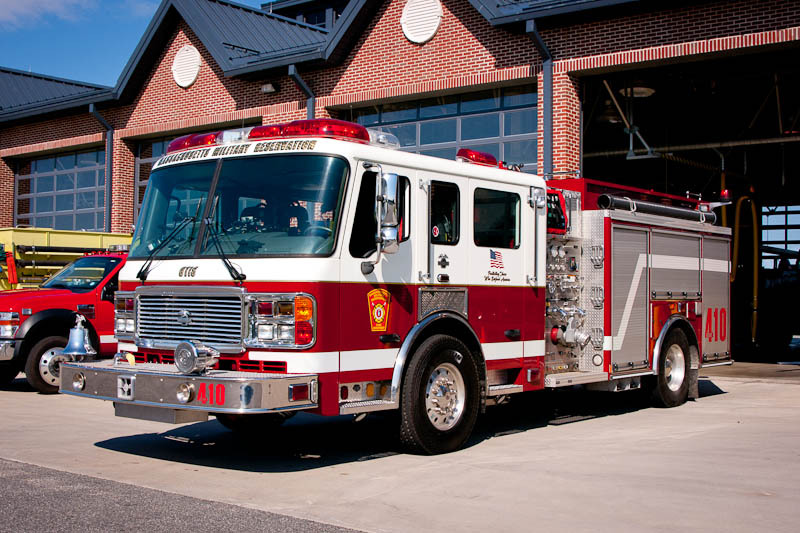 move into the new station. 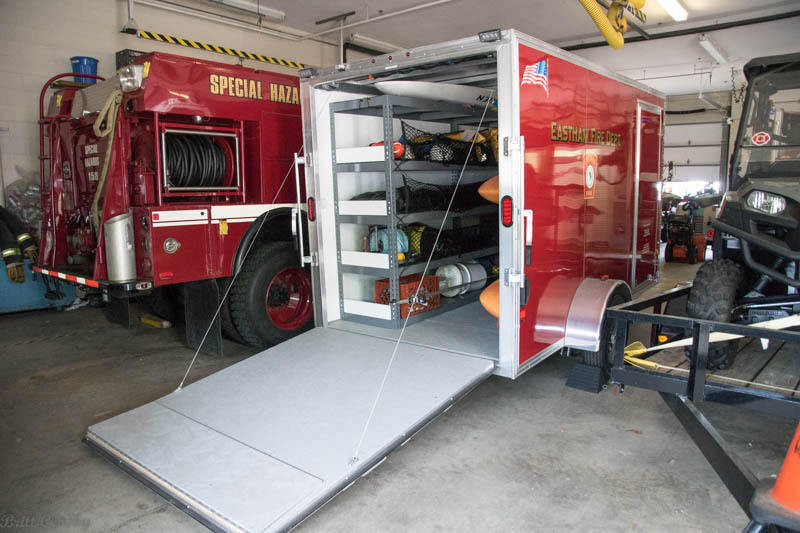 plan looks at keeping the following apparatus at the following stations. 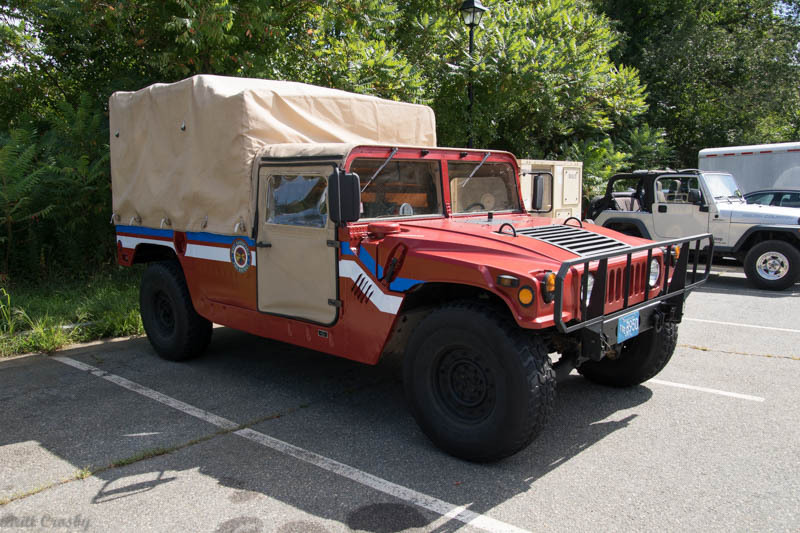 as well as an officer vehicle. 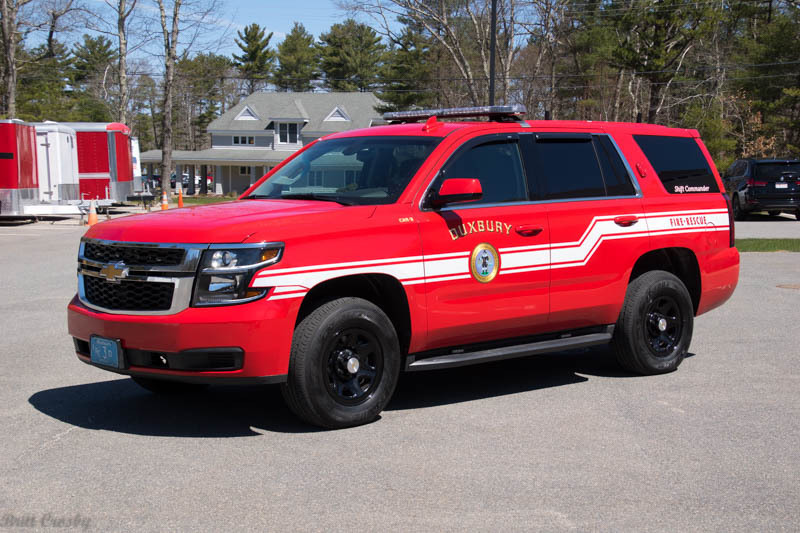 Incidents Unit, a forestry unit, Command Car, and support units. 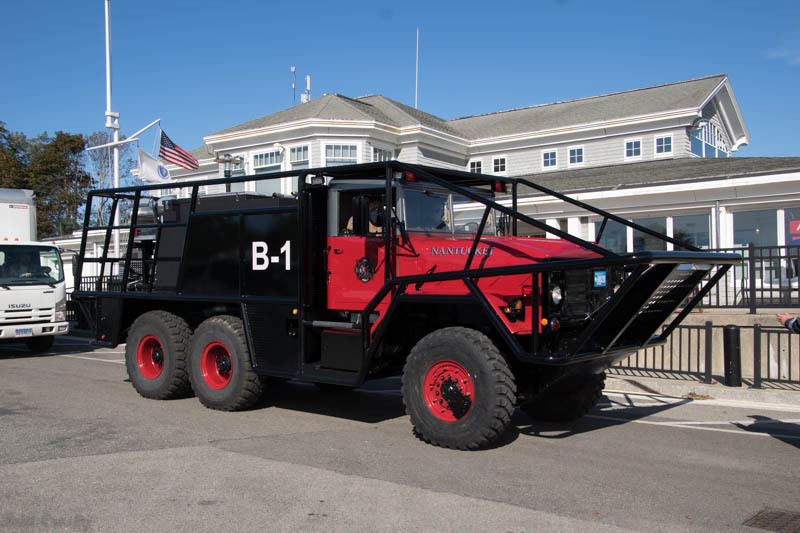 2nd Brush Breaker will be assigned. 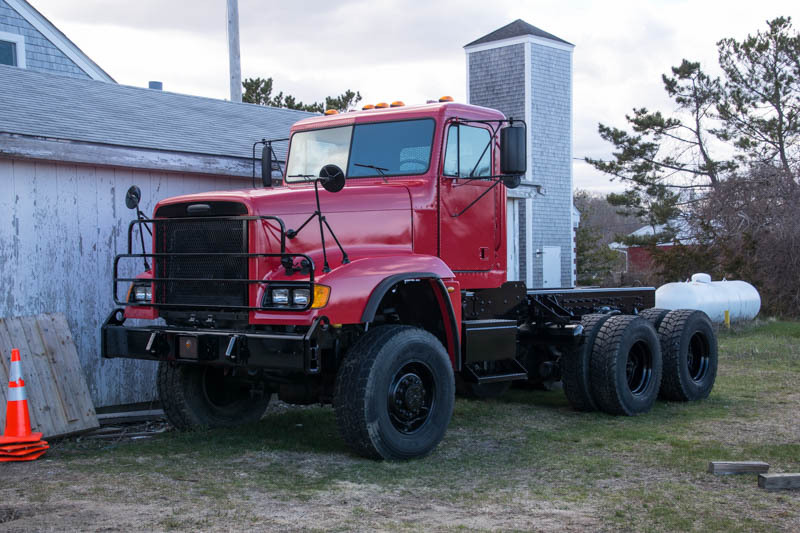 More to follow once the details are worked out. 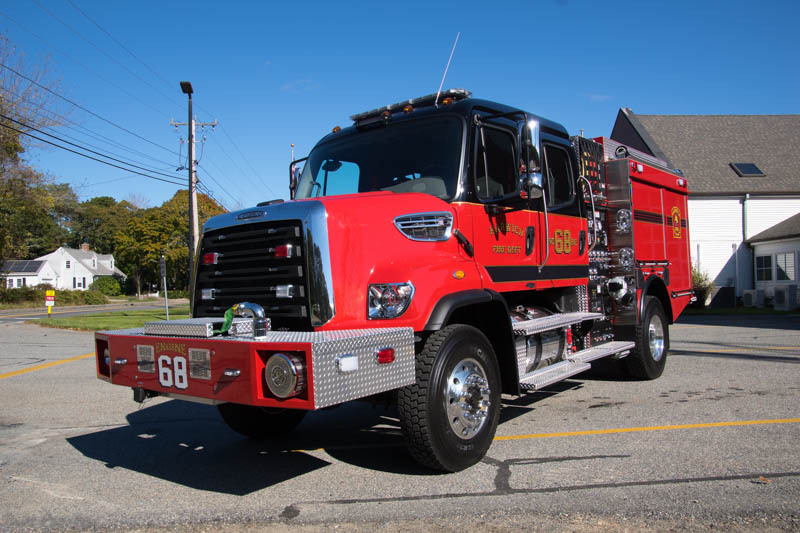 Truro has a 3000 gallon Pierce Tanker on order. 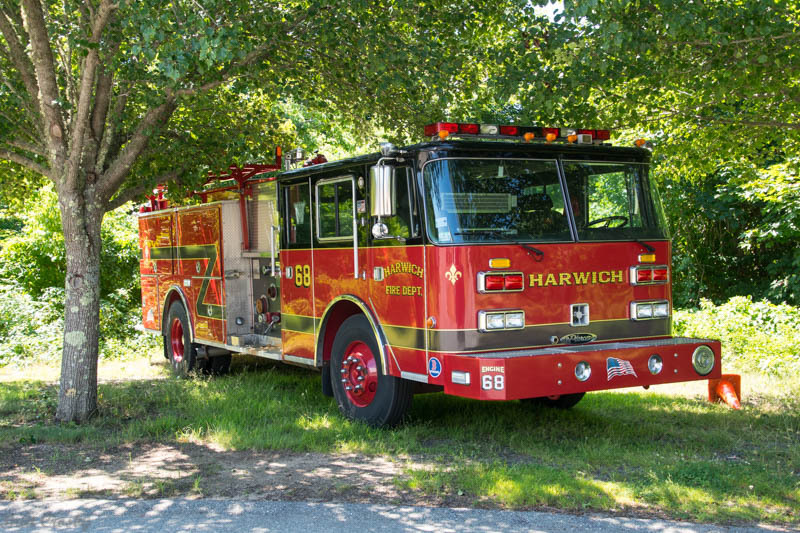 Due in the Spring 2019. 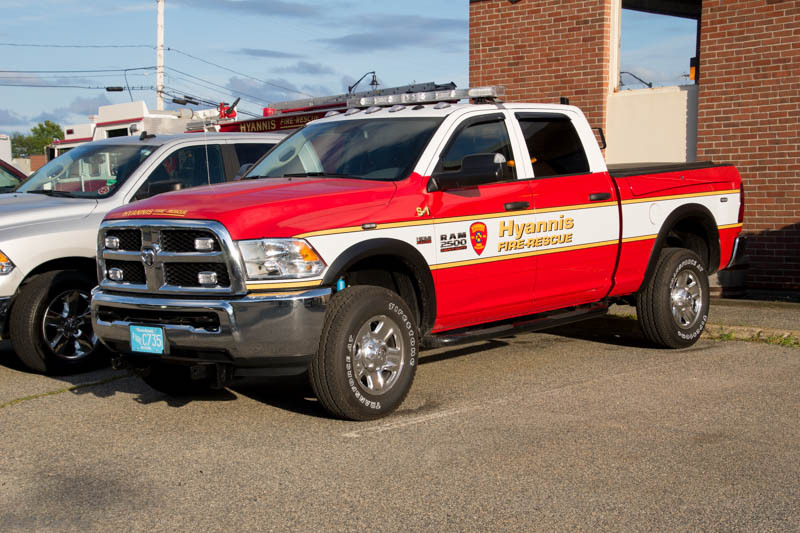 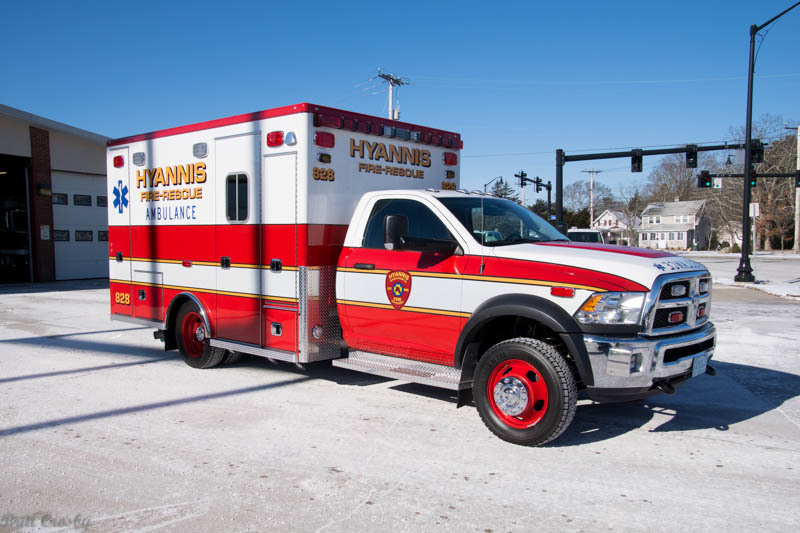 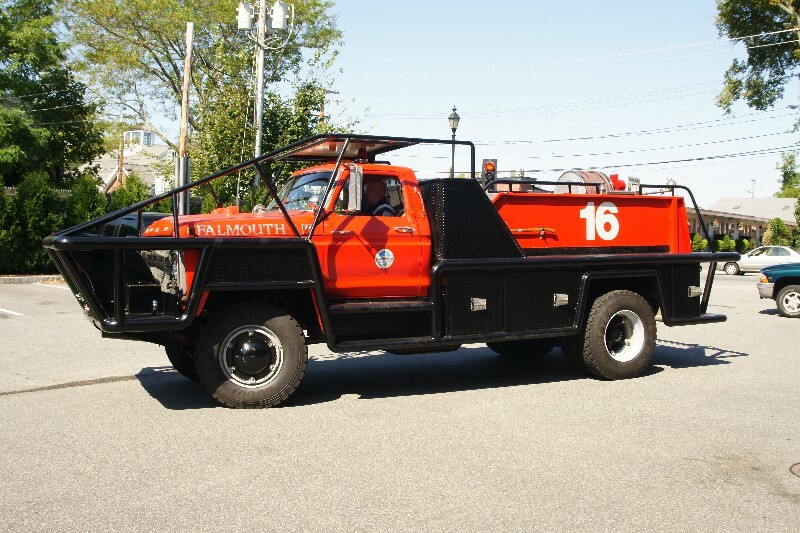 Wareham has ordered a Spartan/EVI 6 wheel walkin Heavy Rescue. 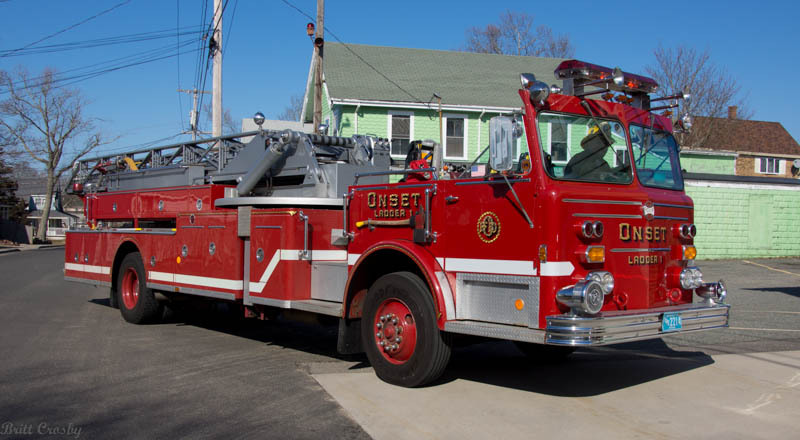 their 1987 Emergency One 110' Ladder truck. 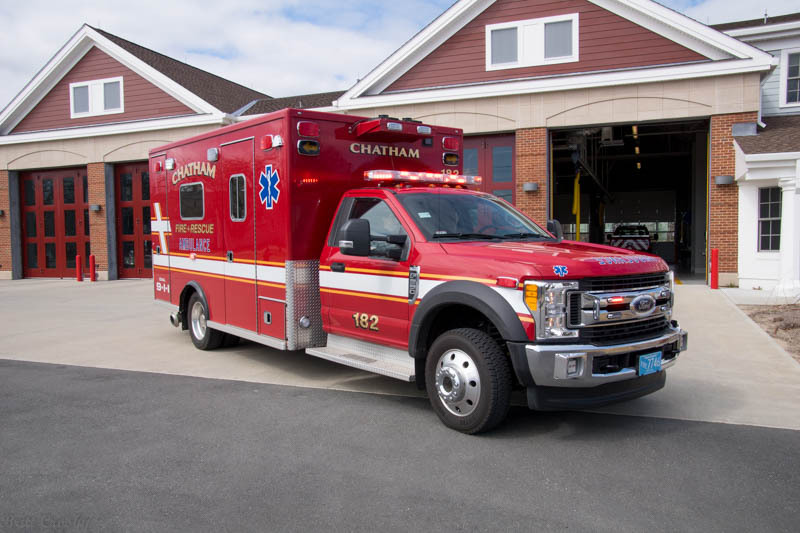 Wareham has an ambulance on order. 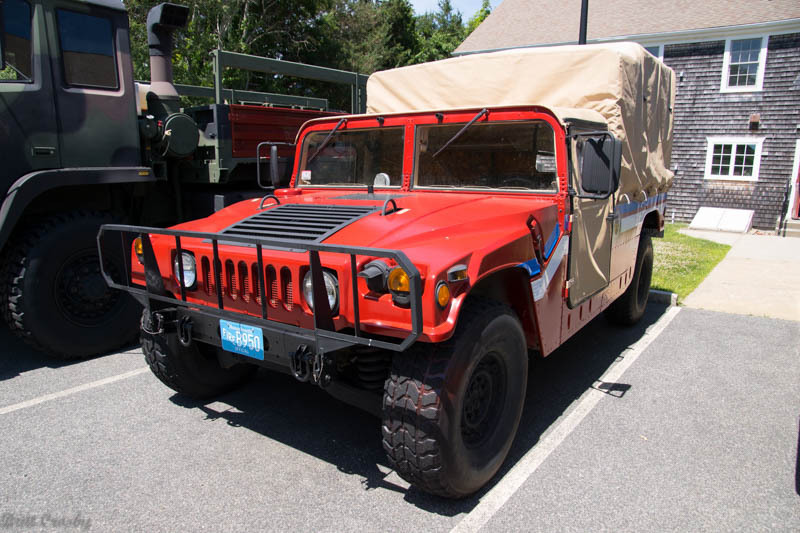 which will be equipped with a pump and water tank. 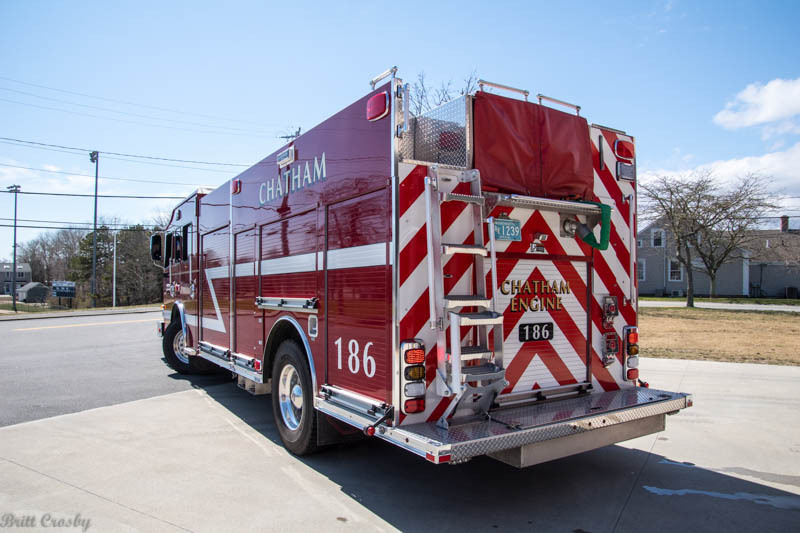 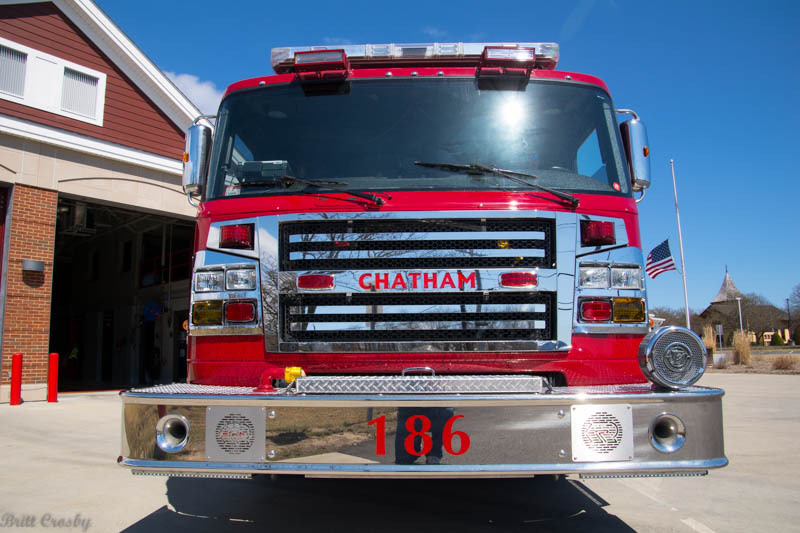 went on to serve as Chatham's new High Water unit. 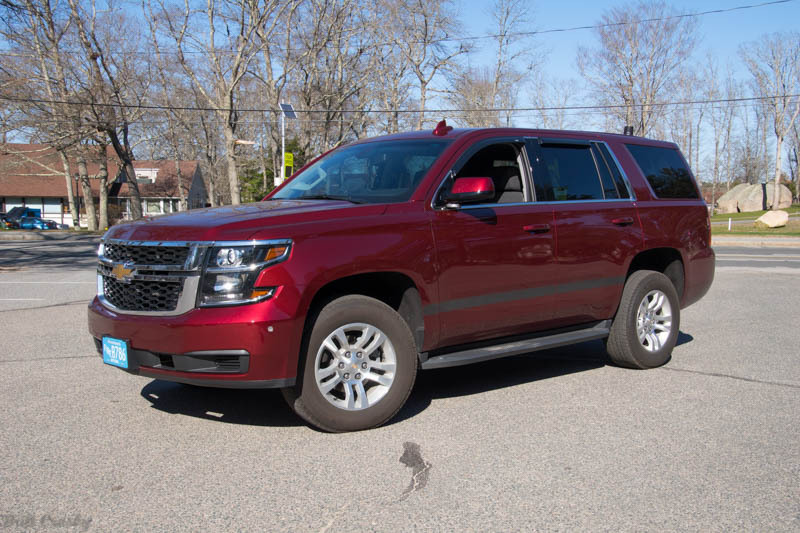 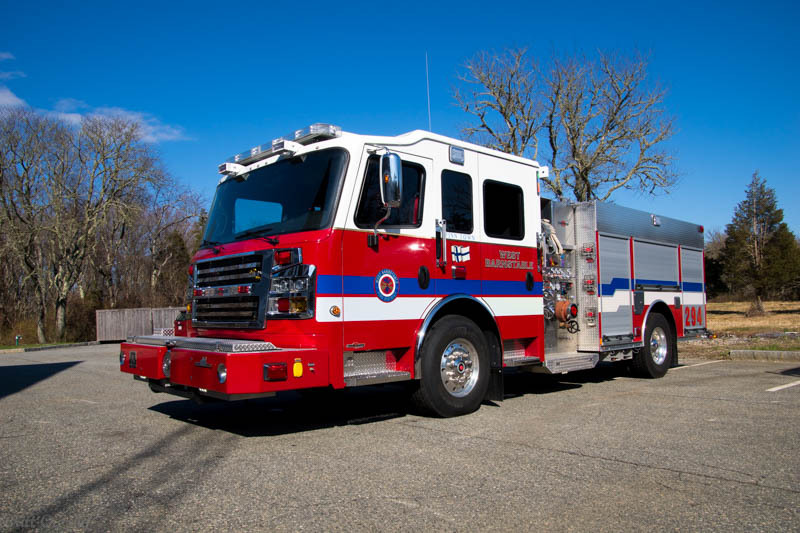 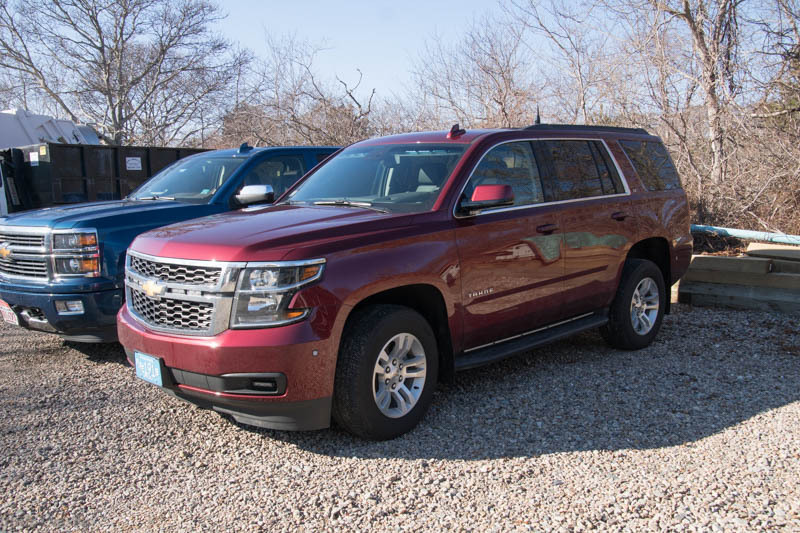 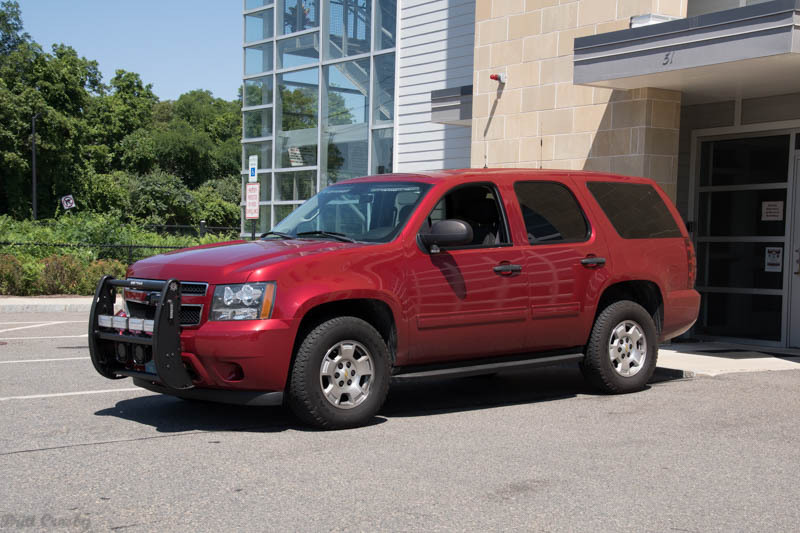 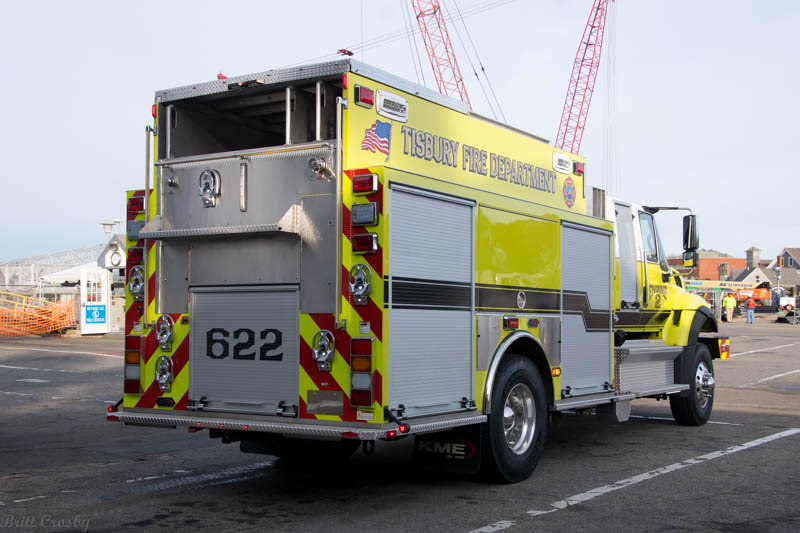 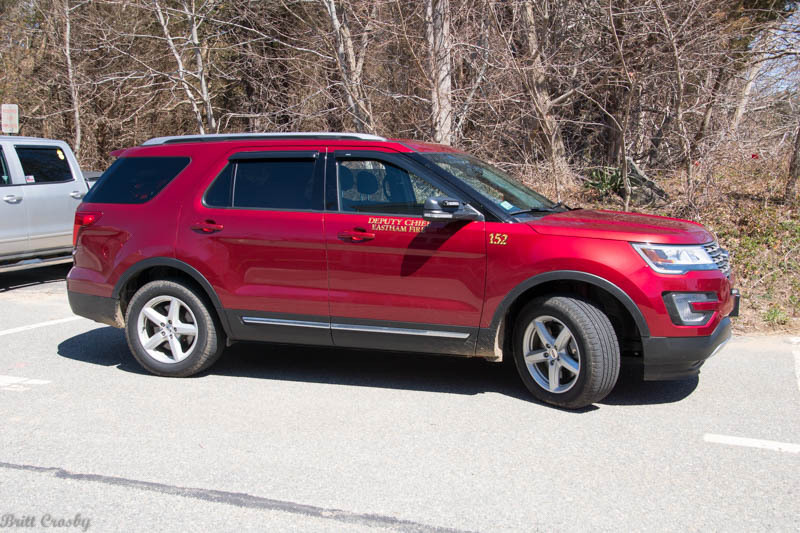 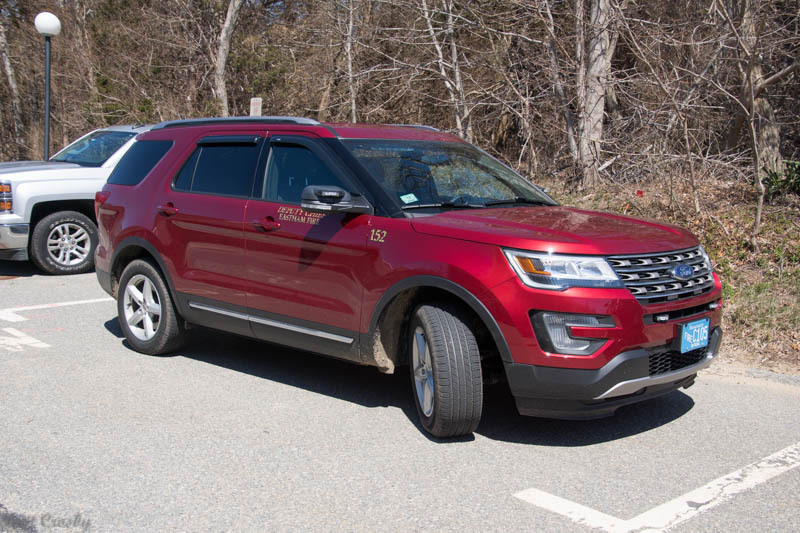 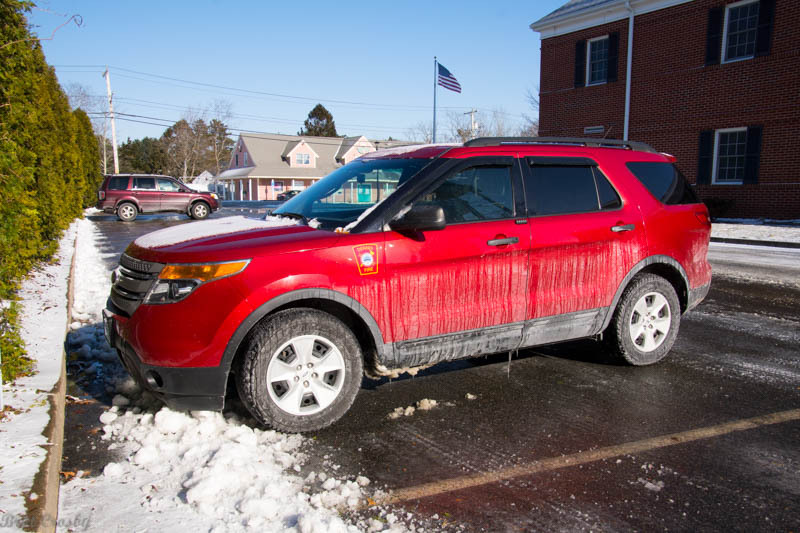 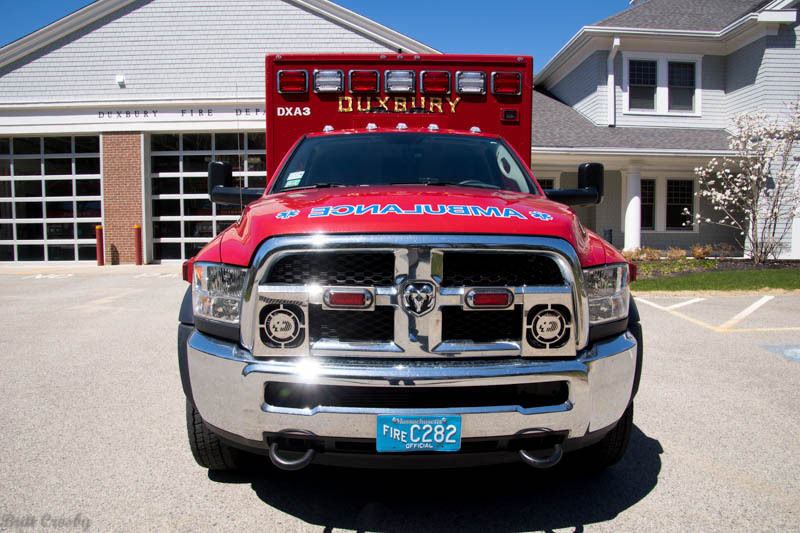 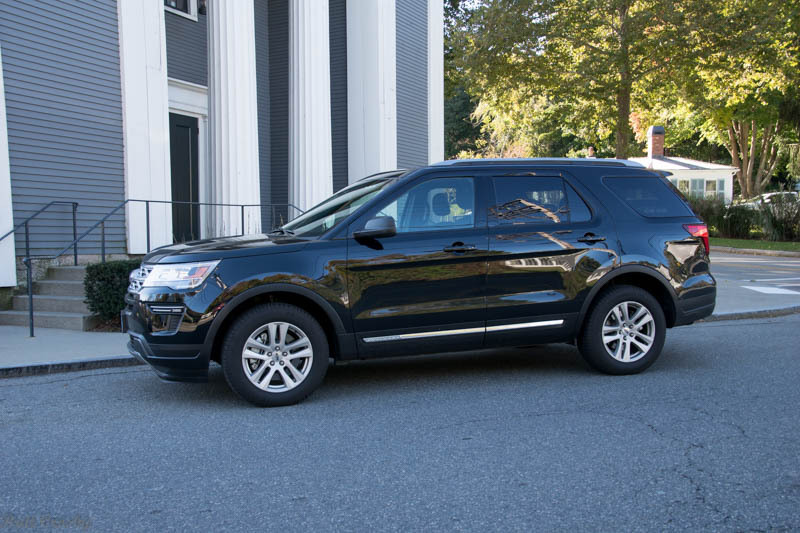 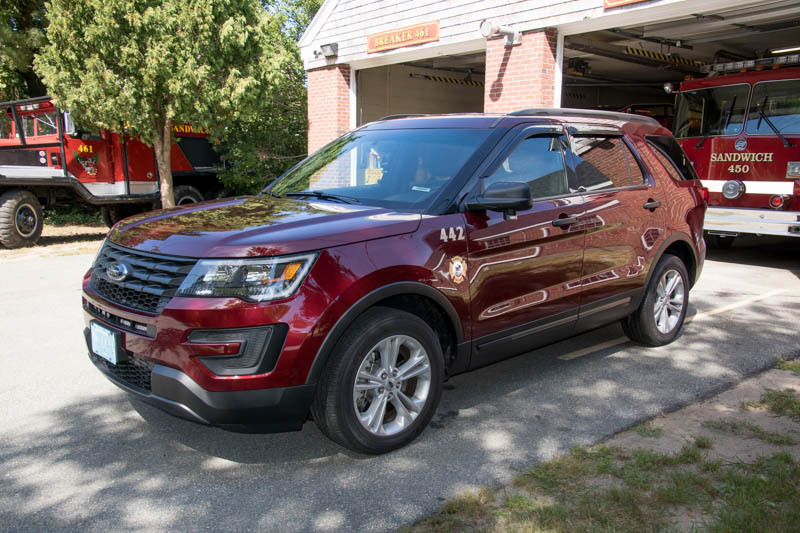 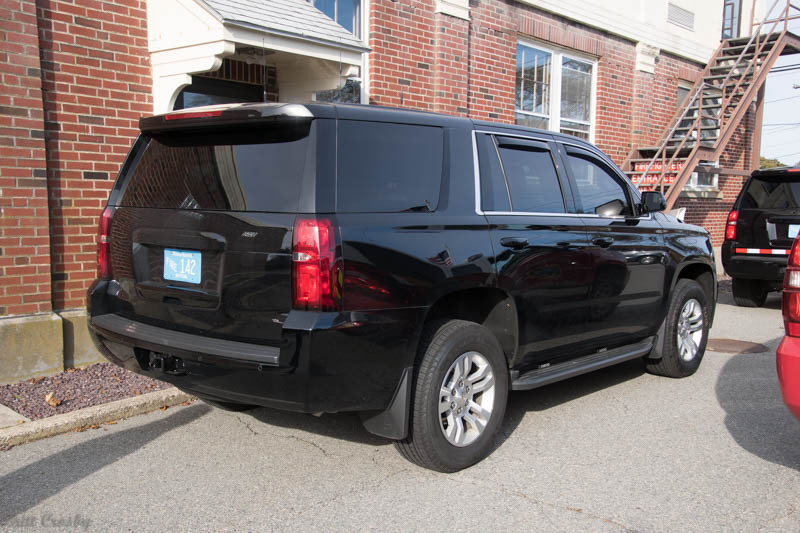 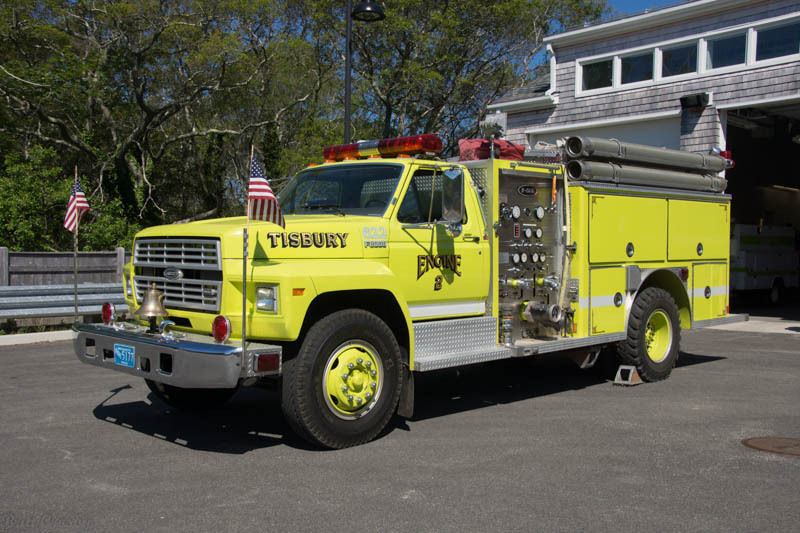 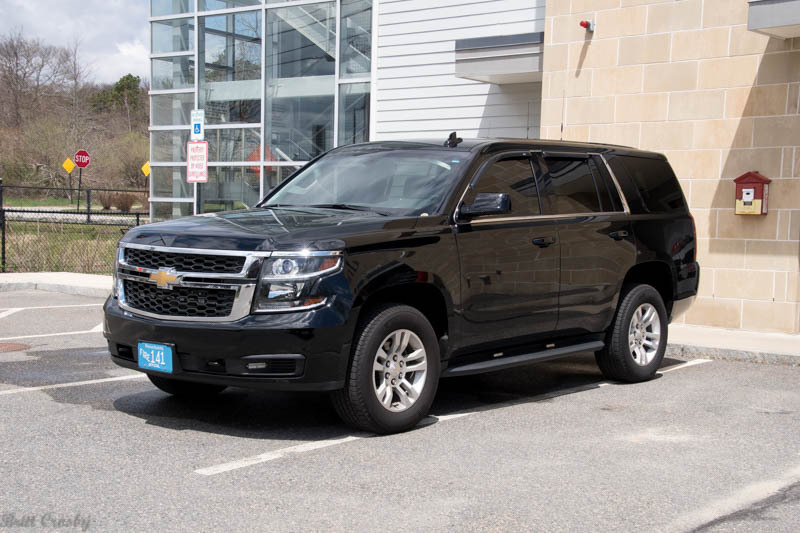 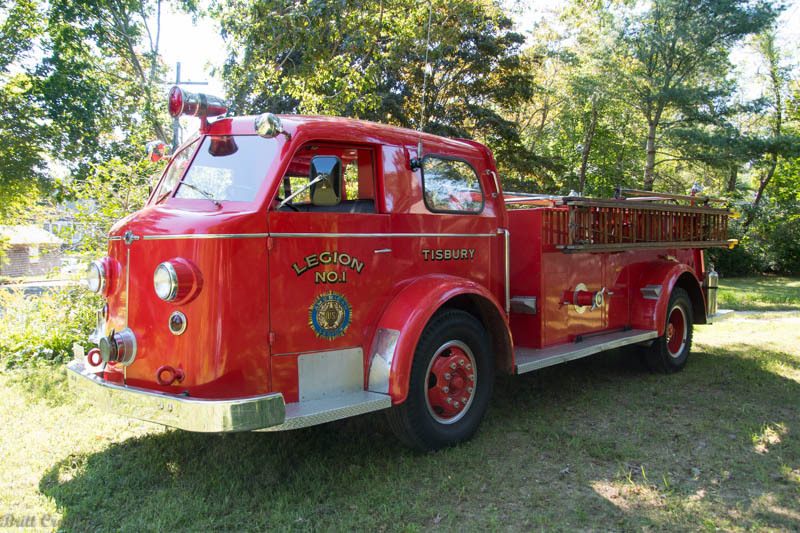 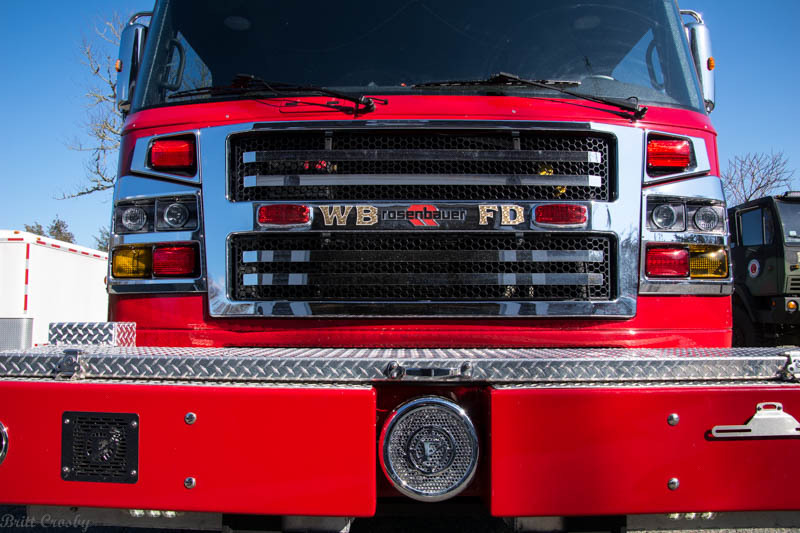 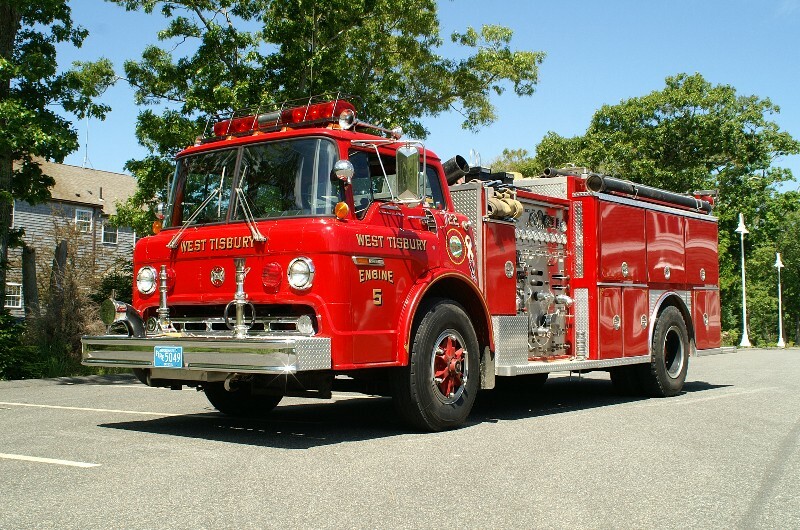 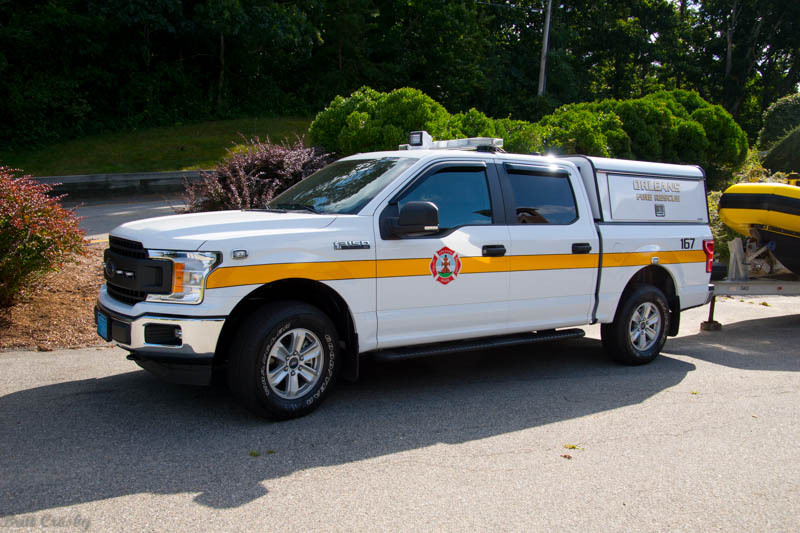 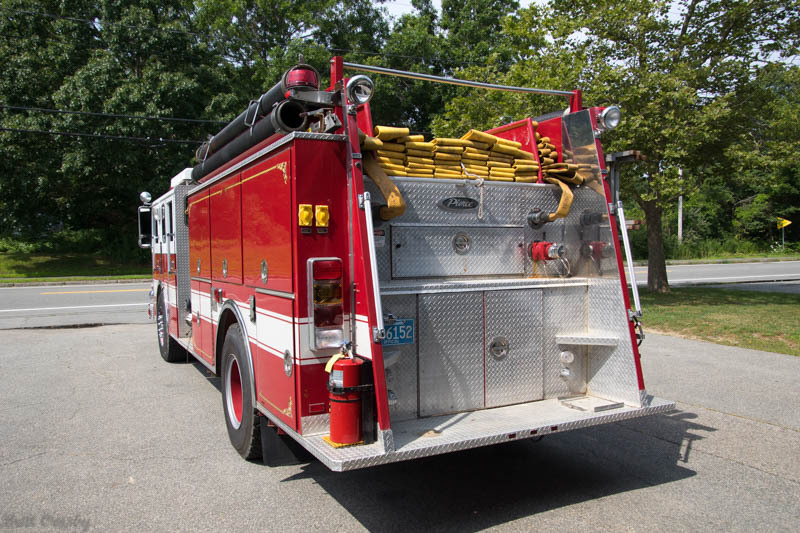 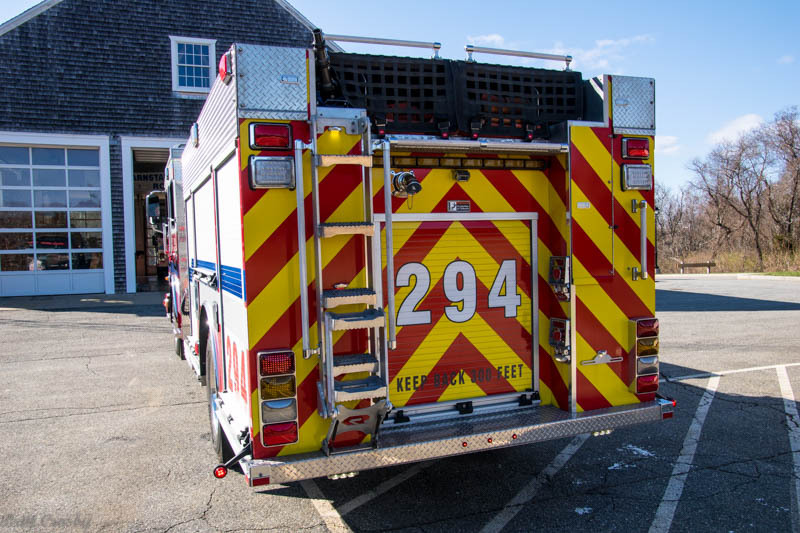 West Tisbury recently put a new fire chief car in service. 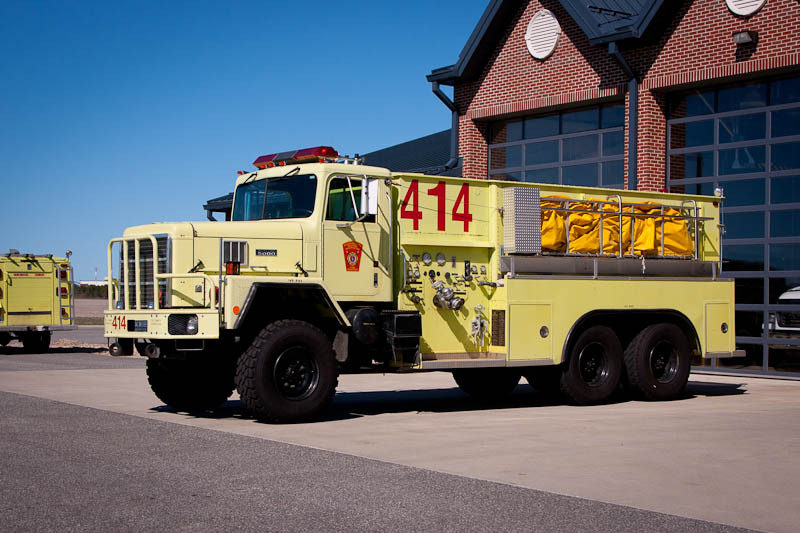 Forestry 49 in service since 2012. 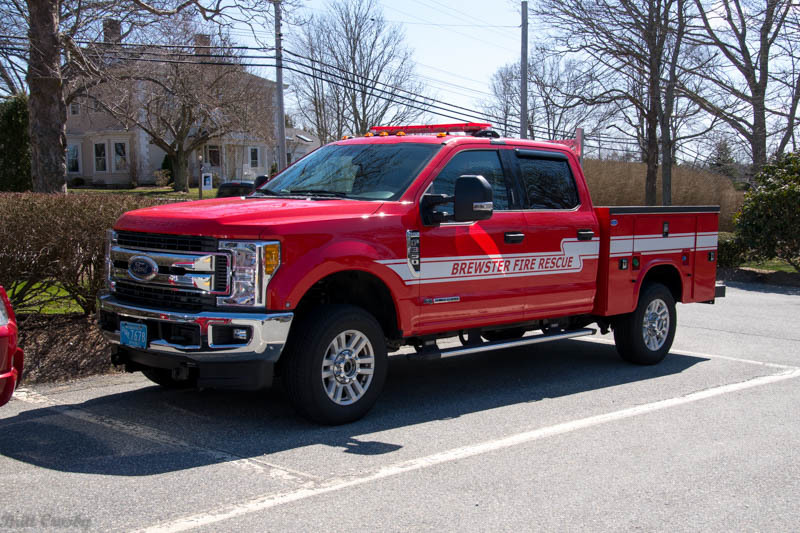 West Barnstable has been working on a Humve. 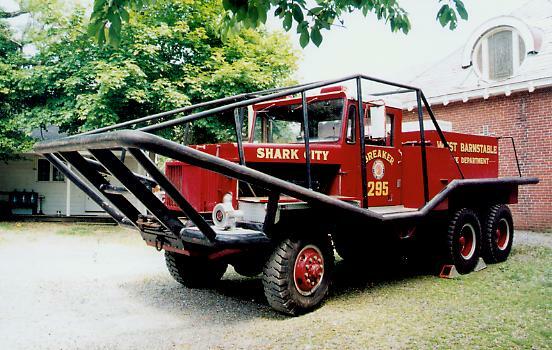 for Forestry 288. 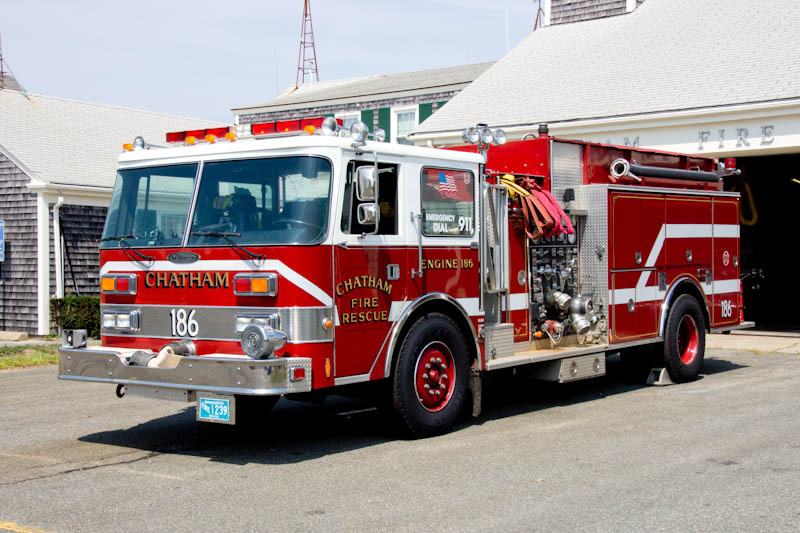 The previous LMTV was transferred to Chatham FD. 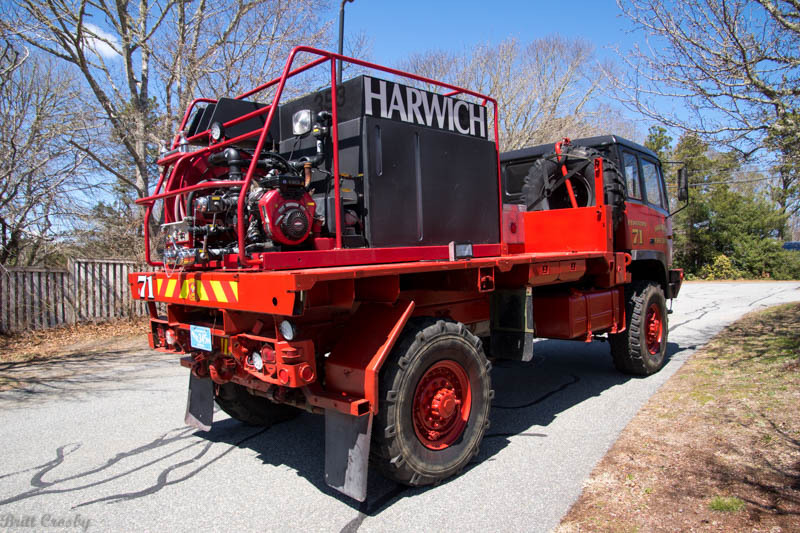 Combined high water and forestry use. 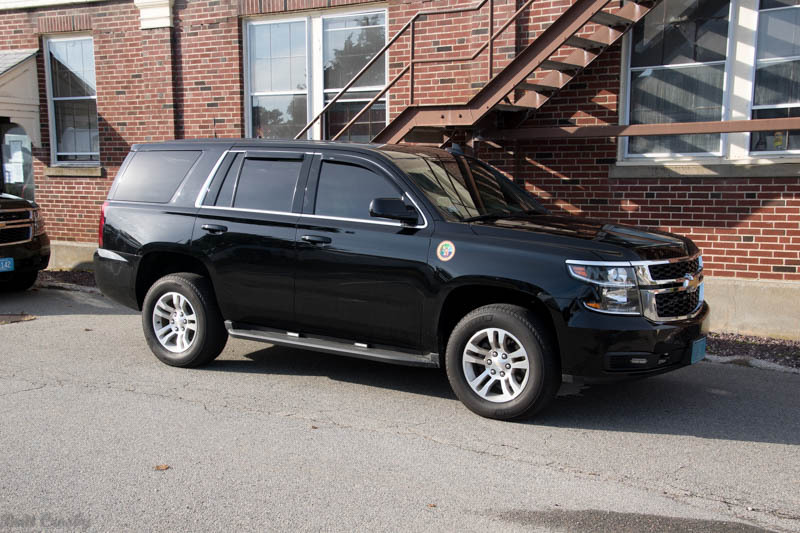 vehicle when work is completed. 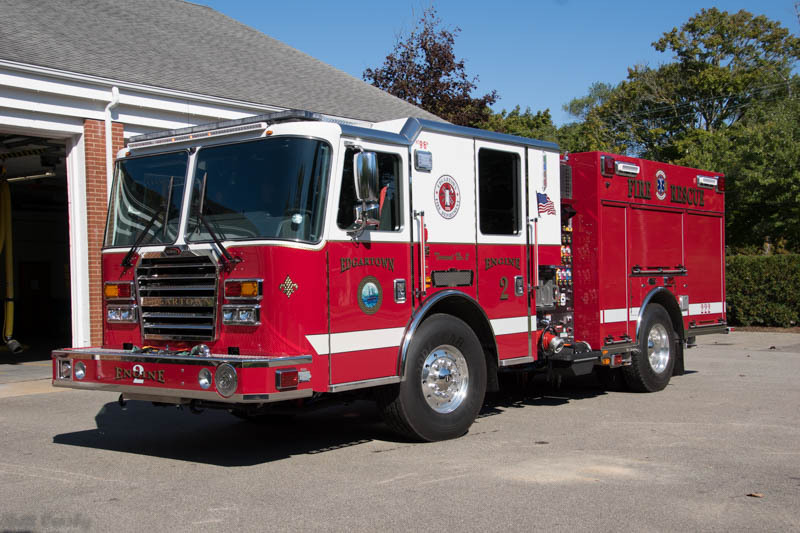 new brush breaker to replace the recently retired Breaker 148.
with a 750 gallon tank, 350 gpm pump, and class A foam system. 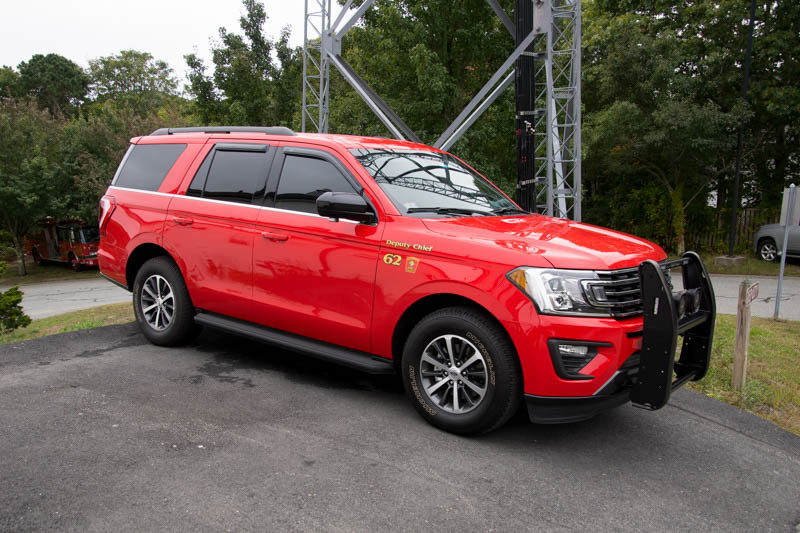 It is expected to be ready in the spring of 2018. 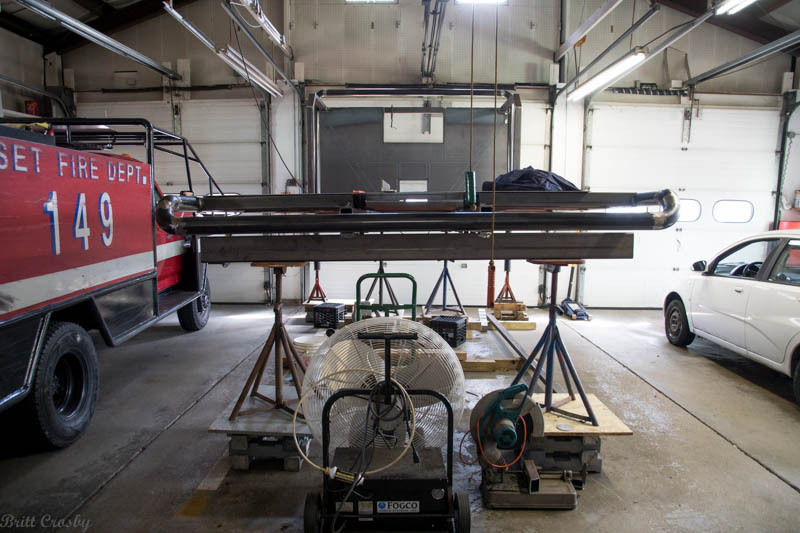 Rear of future brush breaker bar work fabrication. 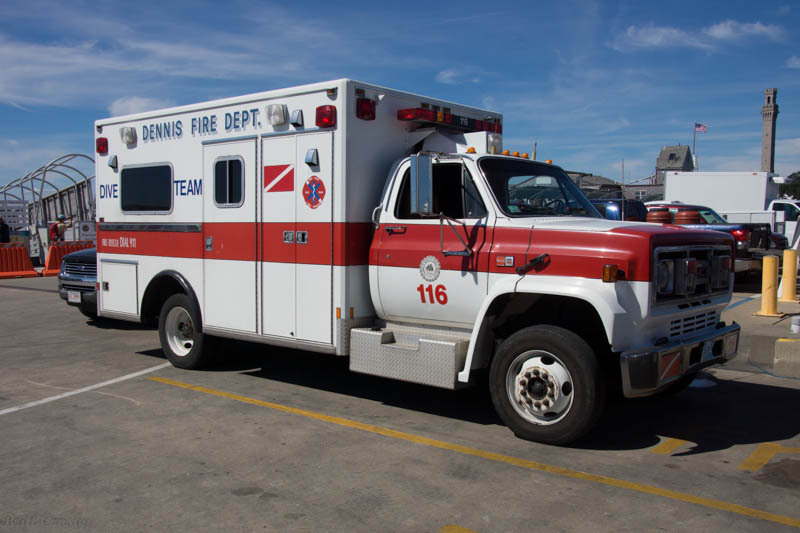 that has served as Dive 116 since 1995. 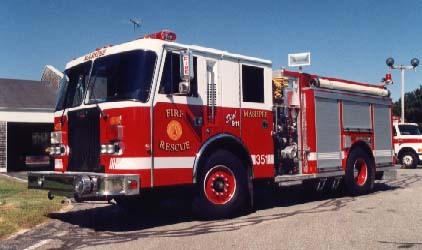 Originally Rescue 1 (103) from 1989 - 1995. 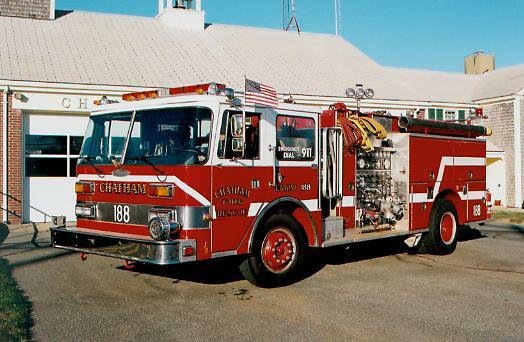 It became Dive 116 in 1995. 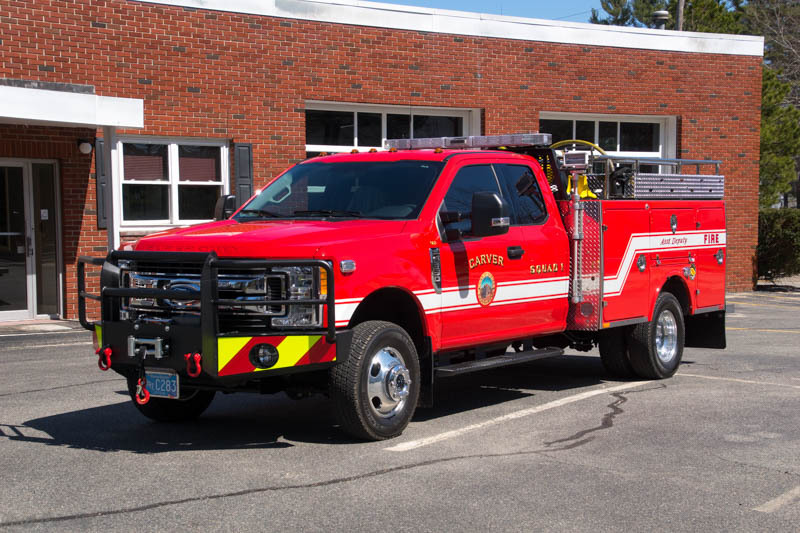 Being replaced by 2011 Ford F450/Horton former A-105. 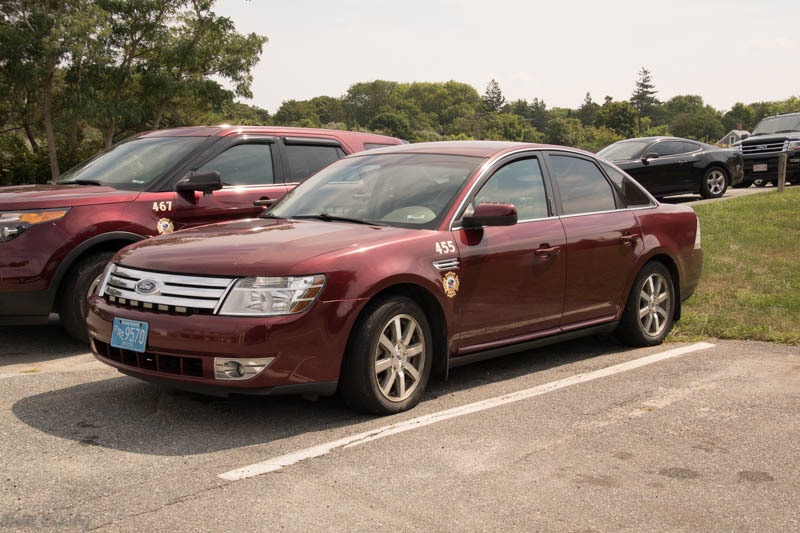 which resulted in the vehicle being taken out of service in August 2018. 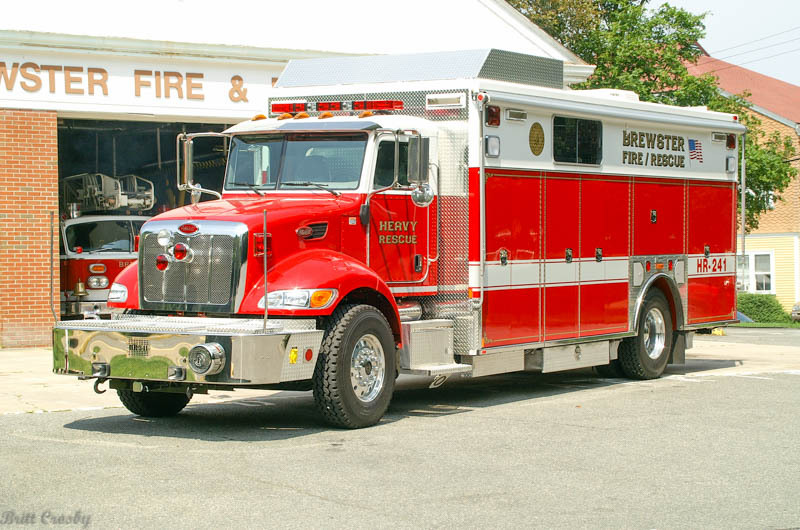 1989 Pierce Lance former Brewster Engine 233. 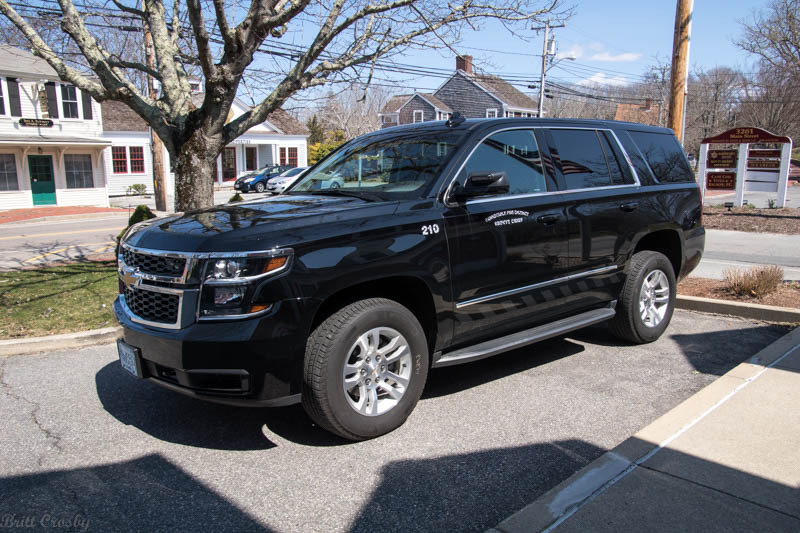 Plans changed. 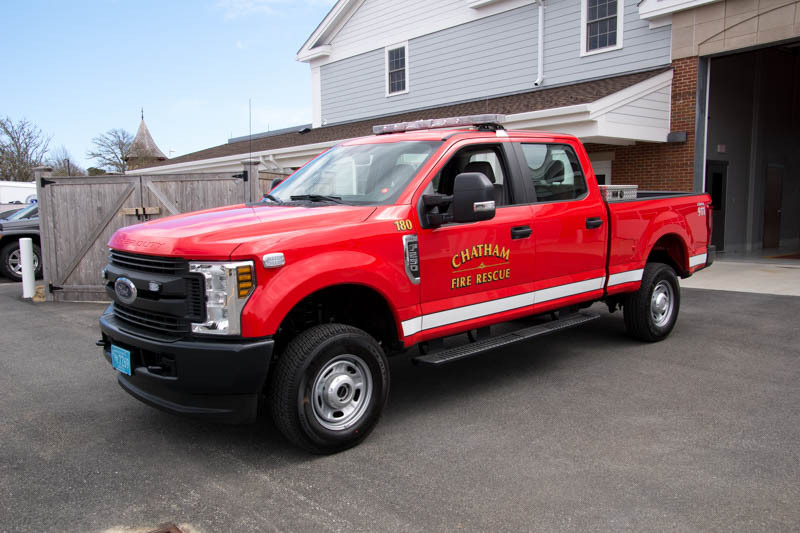 The old truck was cut up in Nov 2018.
to serve a 3rd life with another department. 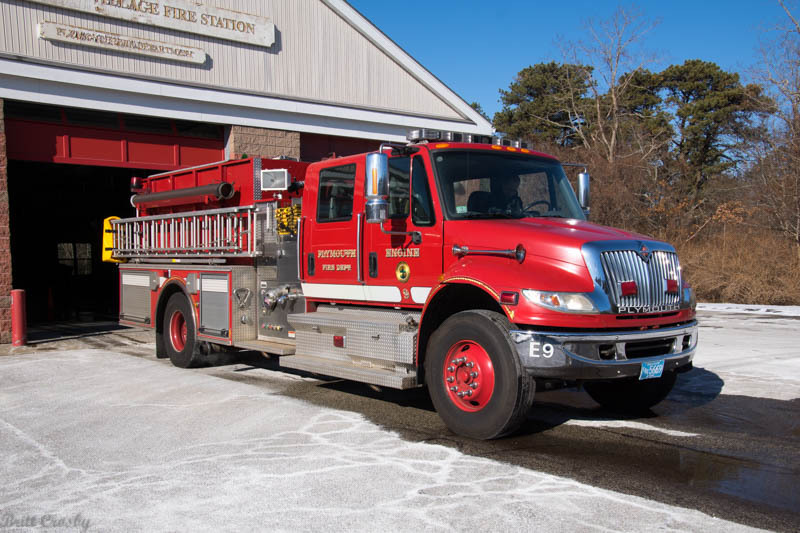 Retired, replaced by 2001 Pierce Dash former Engine 185.
finally as Engine 22 back in Woods Hole. 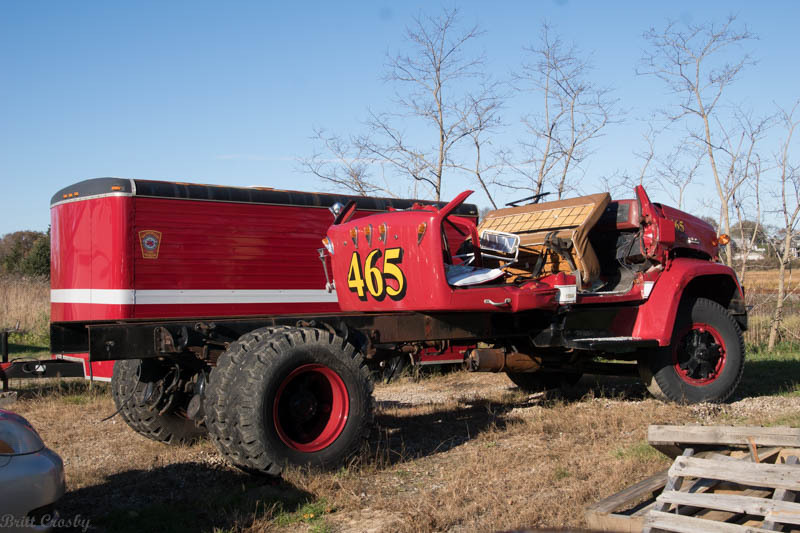 Retired in 2017 due to mechanical failure. 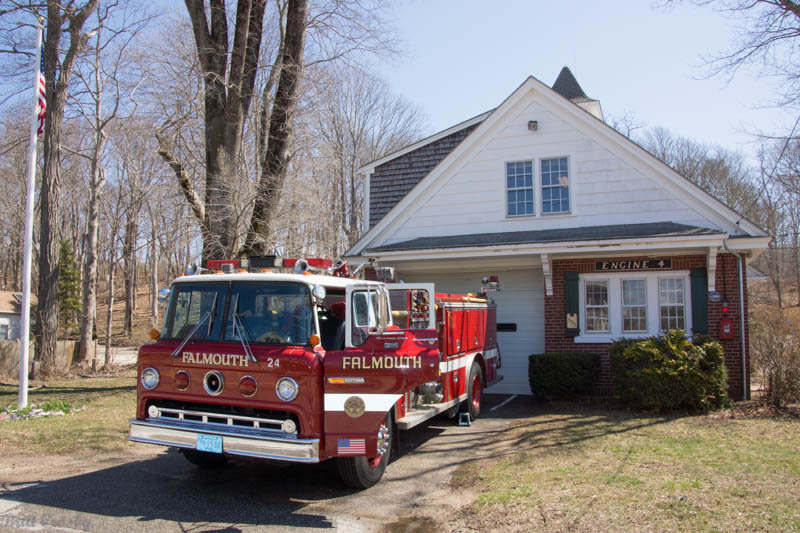 Housed at old home, P-Town Station 4 Johnson Street. 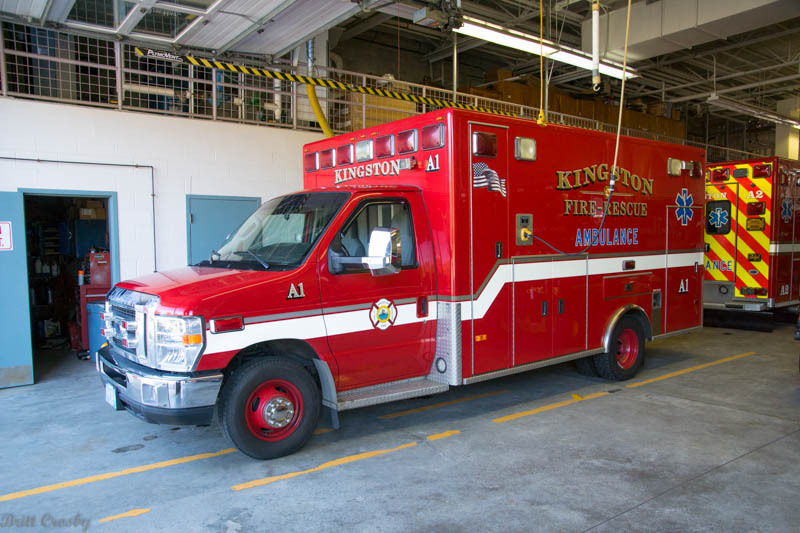 has been taken out of service "Long Term"
due to significant structural problems. 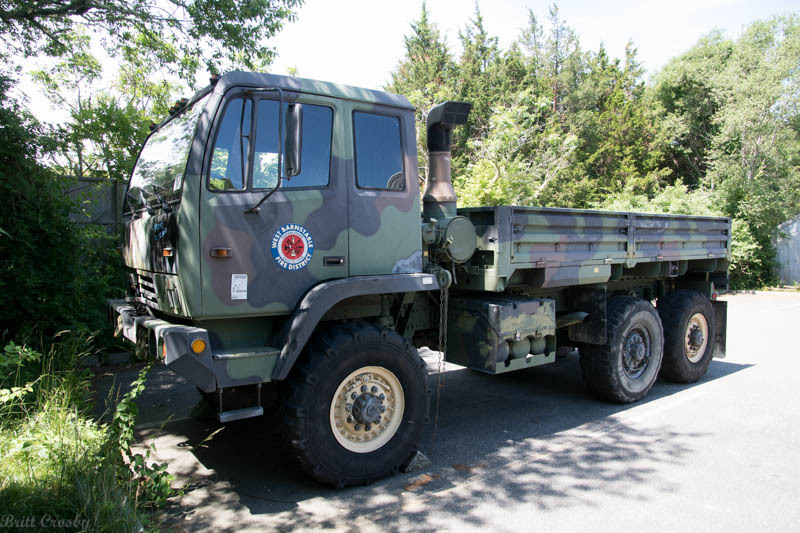 It is "unlikely" to return to service. 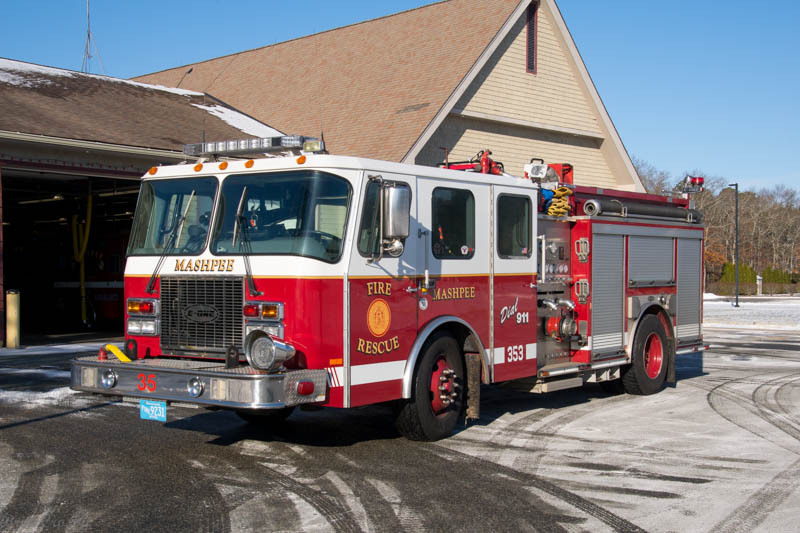 engines to fill its 5 firehouses and no spare engine. 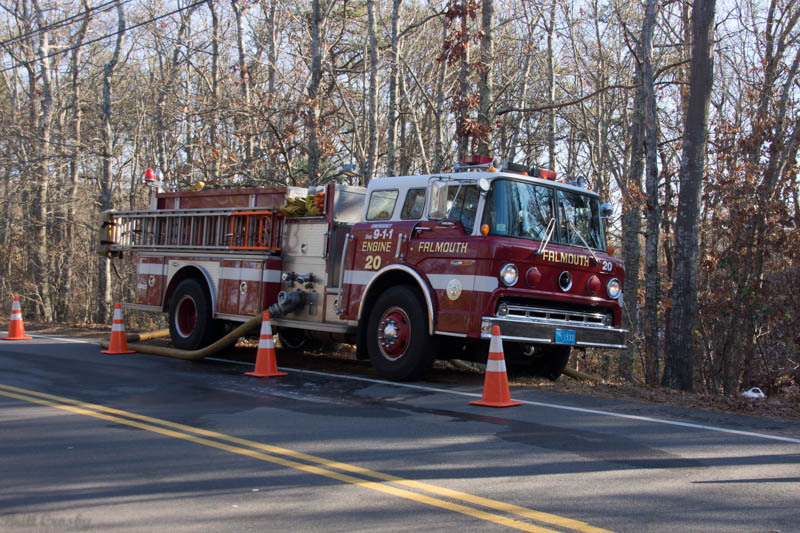 worn out apparatus as calls are up again from last year. 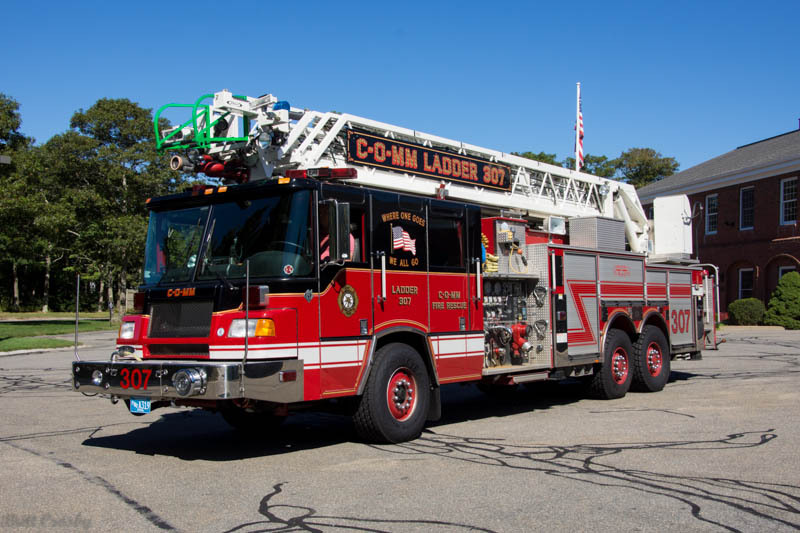 Replaced by 2015 Rosenbauer 78' quint ladder. 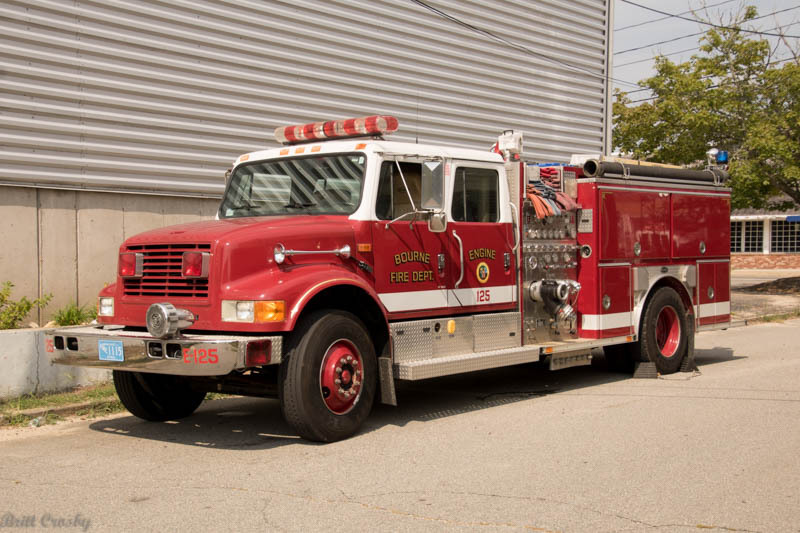 1987 Ford C8000/E-One 1250/500 taken out of service Nov 2015. 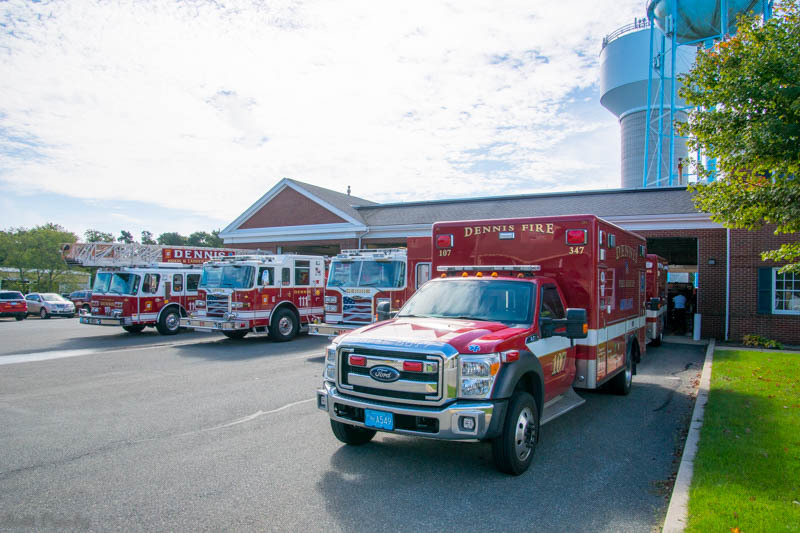 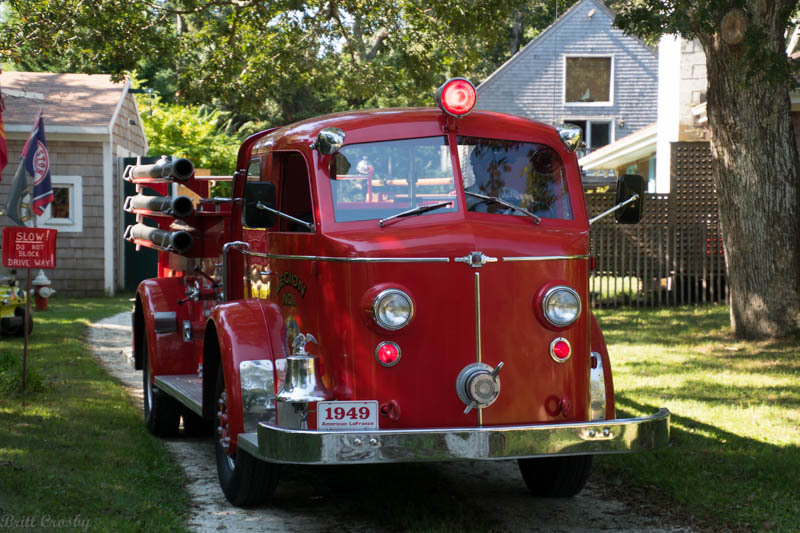 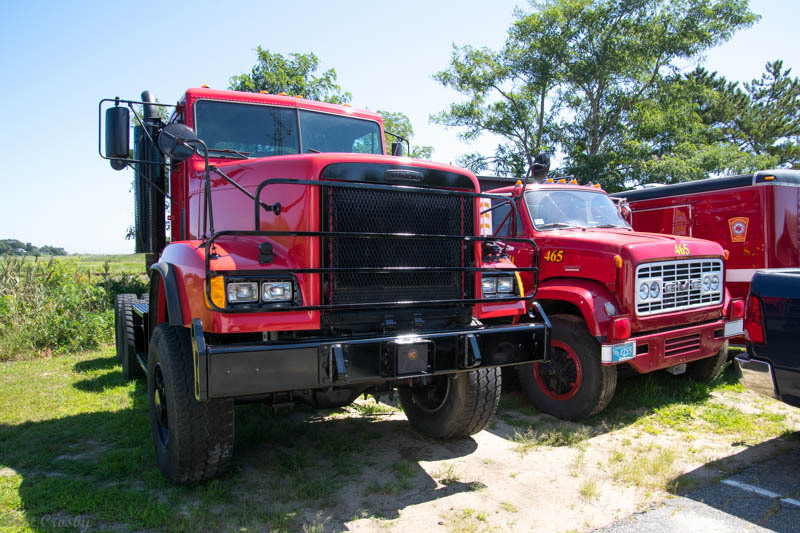 Fire District at Osterville for many years. 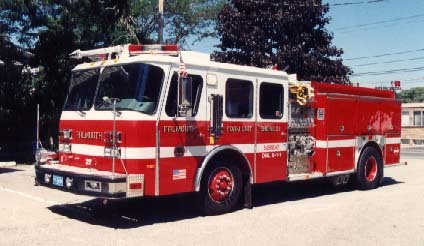 as Breaker C-15 in North Falmouth. 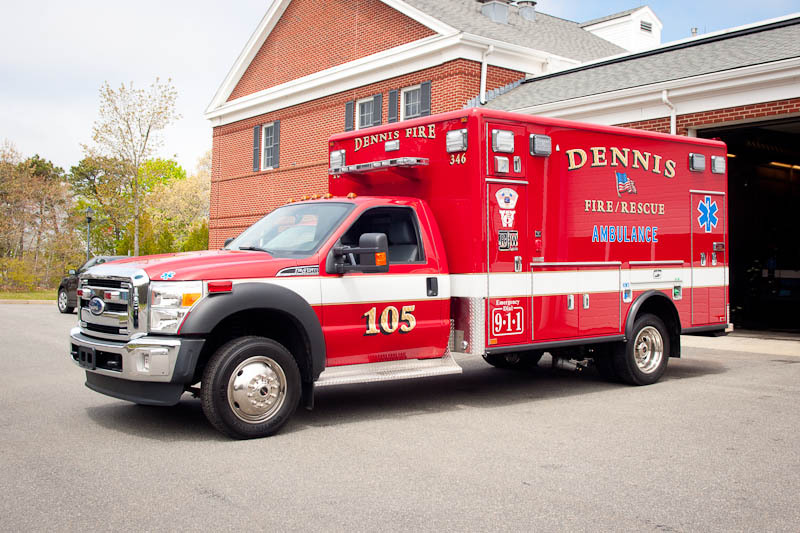 Dennis Fire and Rescue Apparatus on the ramp.